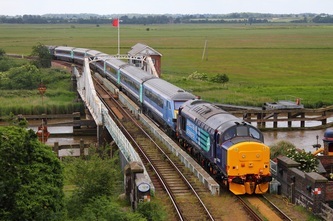 DRS 20308 leads 20309 on a Cheshire Cat tour at Hatton North junction powering the 1Z20 06:11 Stratford upon Avon to Carlisle on the 7th July 2012. 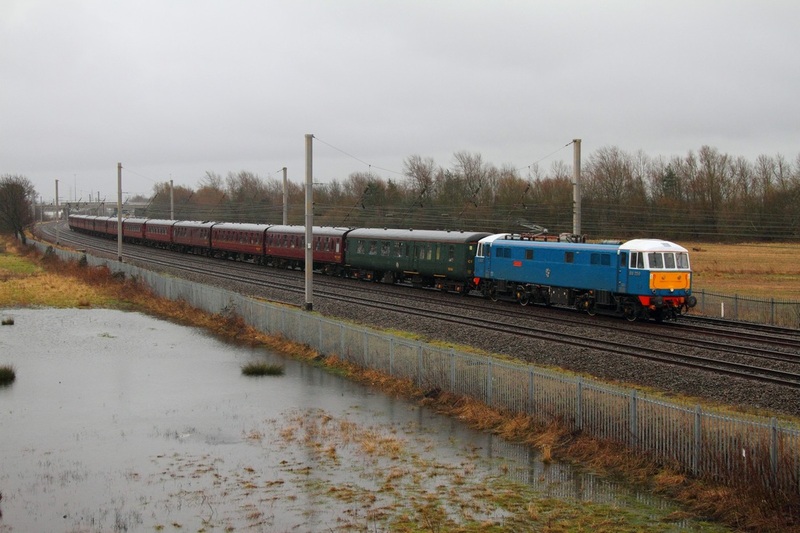 Unfortunately 20308 failed on the return at Wigan therefore the choppers were replaced by DRS 57002. 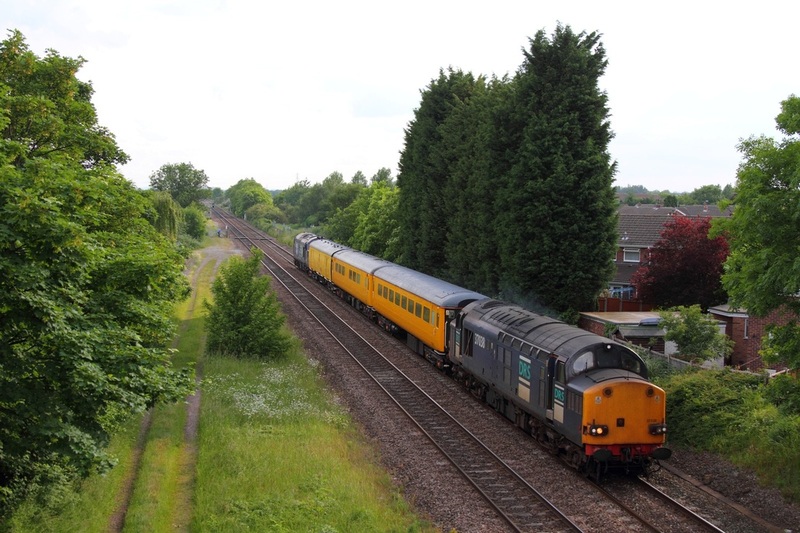 On the Spitfire railtours, unfortunately 37676 failed on the return which resulted in 37685 running solo to Leeds. DB Schenker's Silver 67026 'Diamond Jubilee' rounds the curve at Tamworth powering the 1Z20 Glasgow Central to Southampton Western Docks on the 30th June 2012. 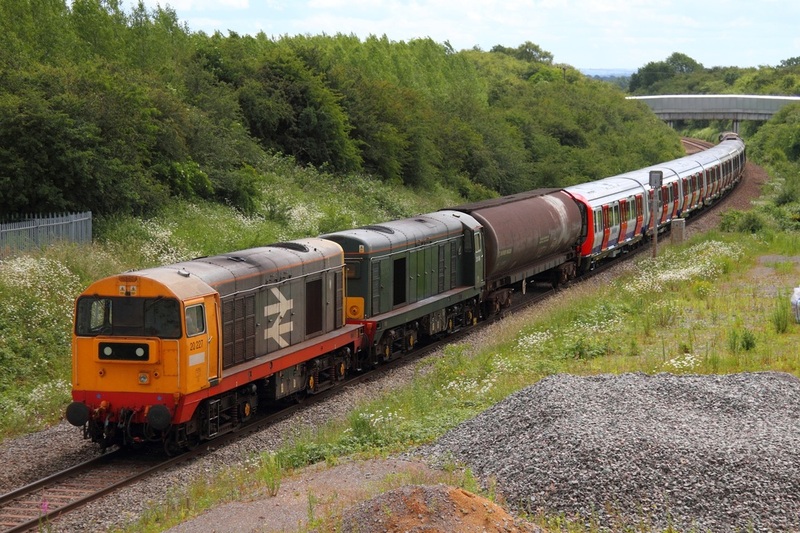 20905 leading 20901 leads a new set of London Underground stock at Bagworth on the Coalville line working as the 7X23 09:33 Derby Litchurch Lane to Old Dalby with Br Green 20189 and Railfreight 20227 on the rear. 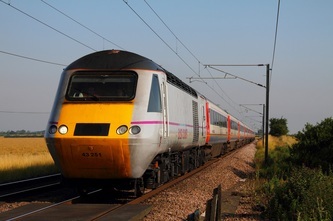 30/06/2012. 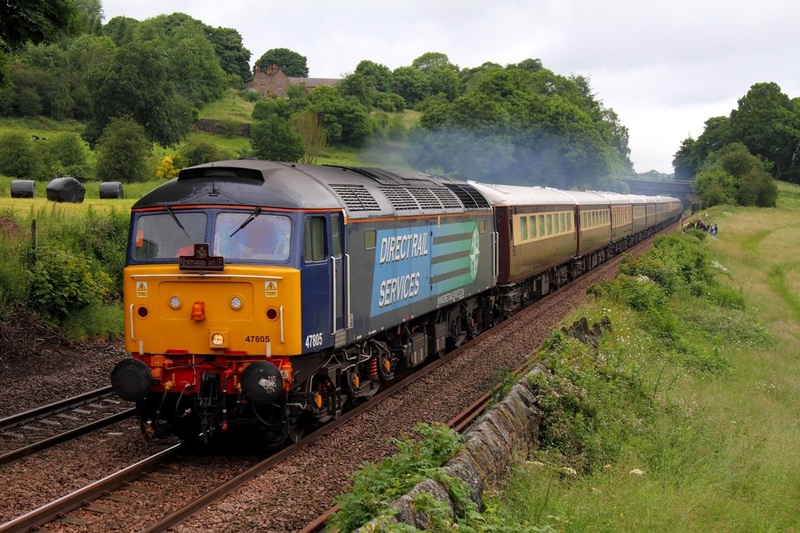 DRS 47805 leads 47790 on the Northern Belle as the 1Z25 York to Bath at Chevin, Milford near Duffield on the 30th June 2012. 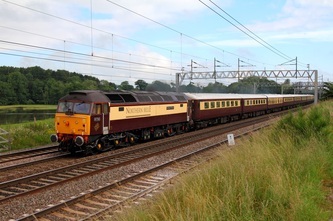 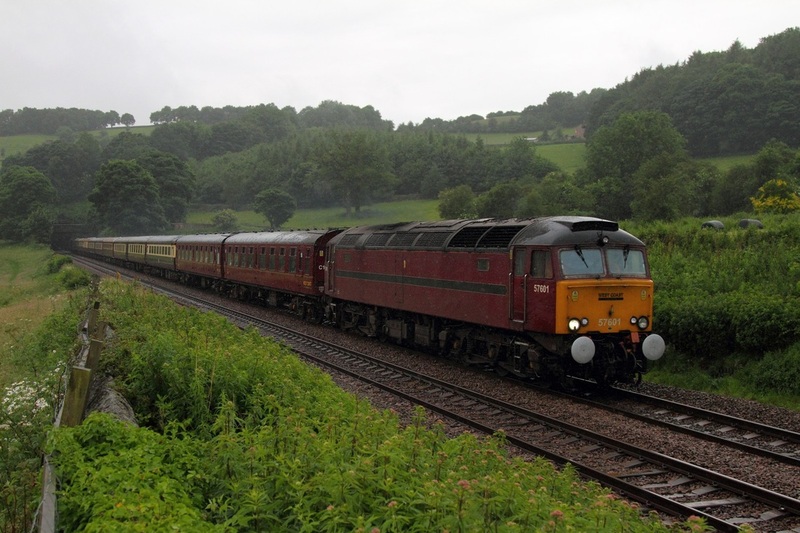 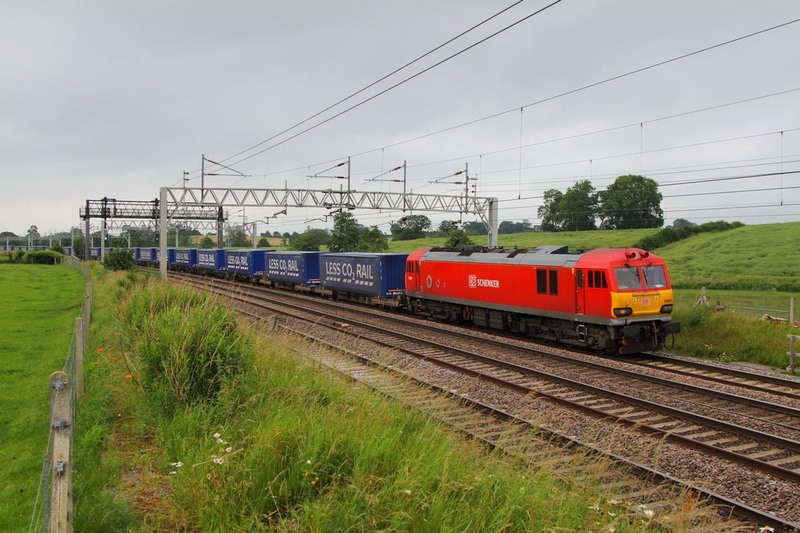 WCRC 57601 leads Royal 47798 on the 1Z30 Hereford to Berwick at Chevin, Milford near Duffield on the 30th July 2012. 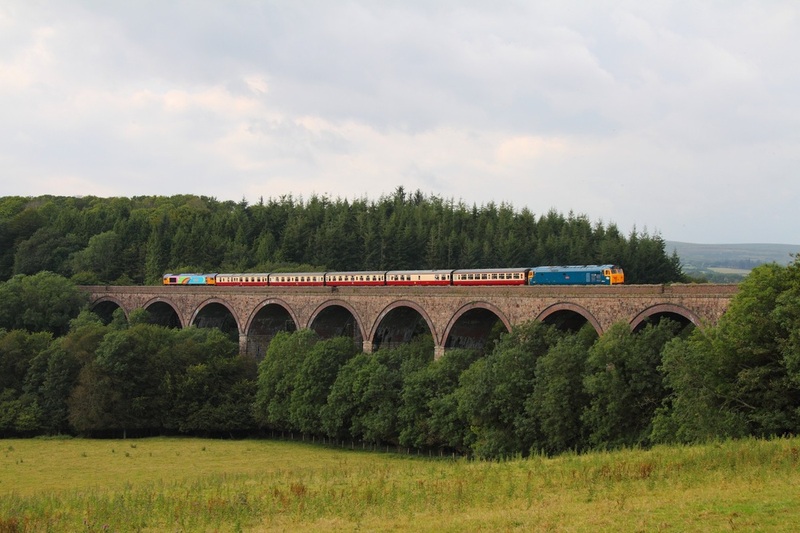 Br Blue 47580 looking stunning in its new Br Blue Union jack livery, powers the 1Z36 06:15 Newport to Carlisle Statesman railtour over Smardale viaduct on the Settle and Carlisle line on the 2nd June 2012. WCRC 47854 was on the rear and is now named Diamond Jubilee. 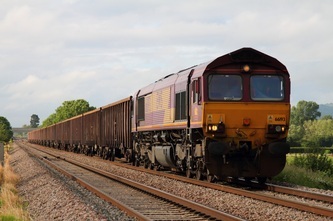 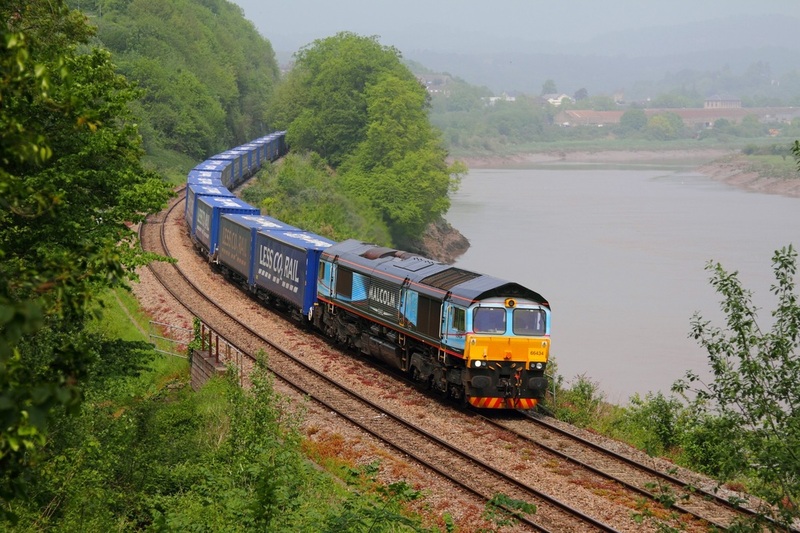 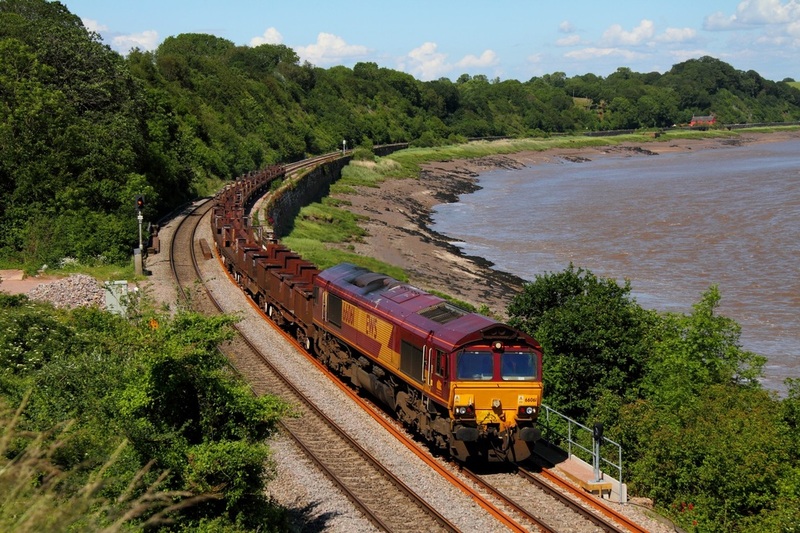 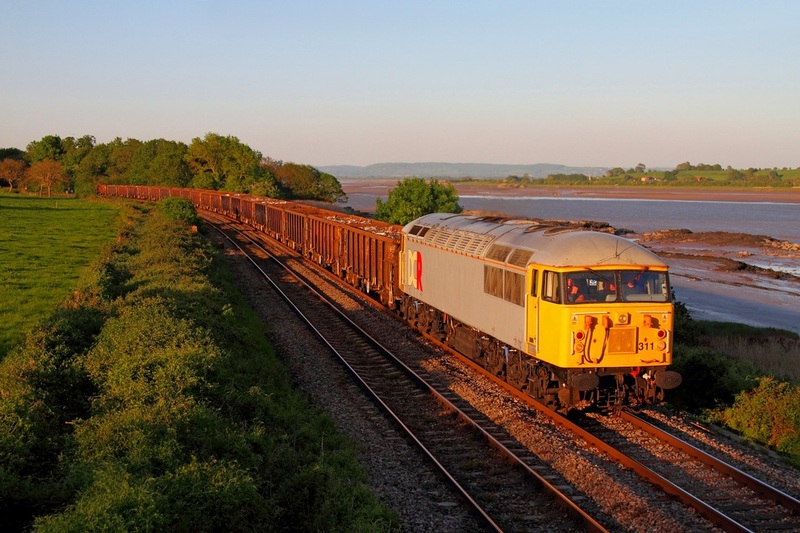 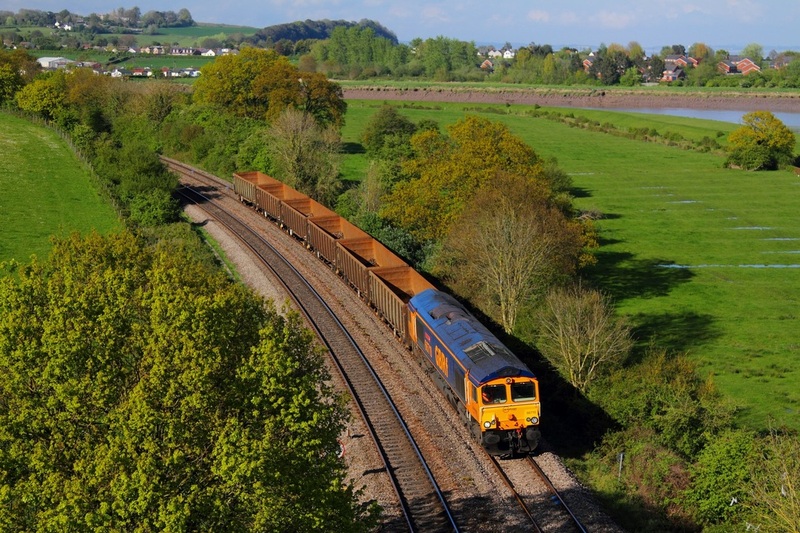 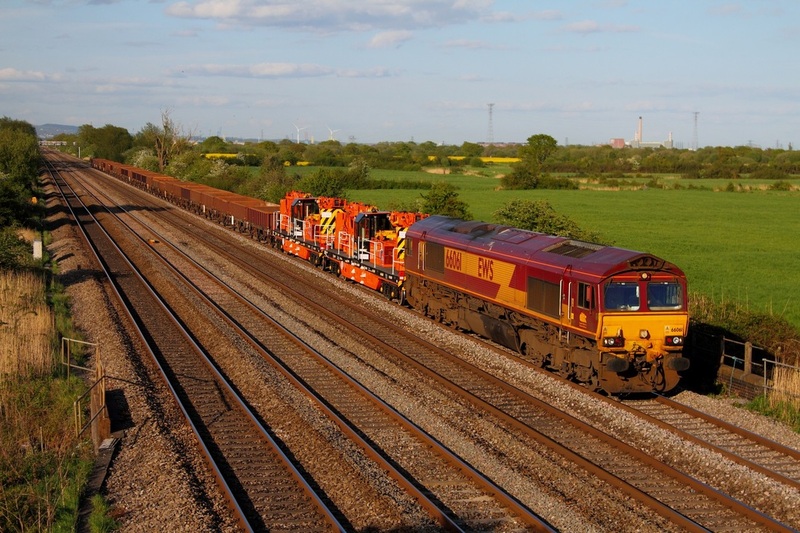 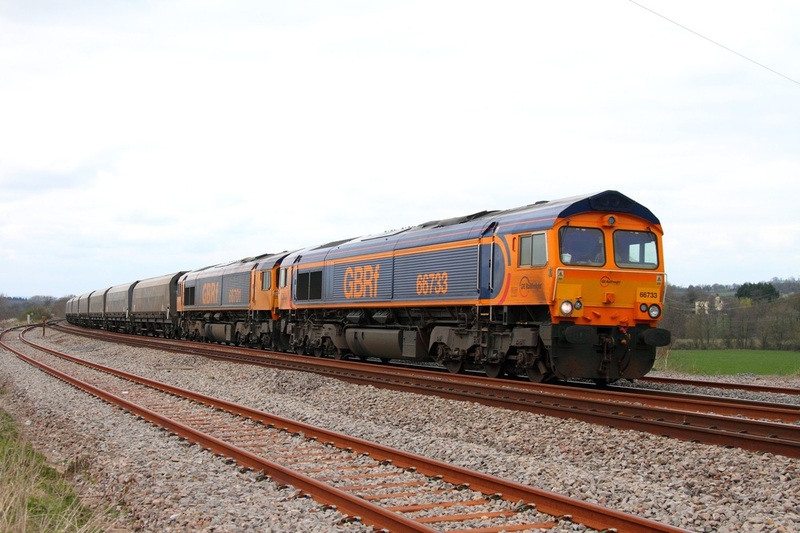 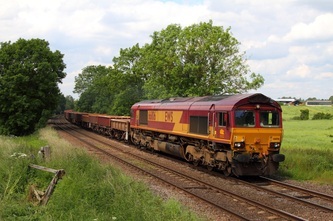 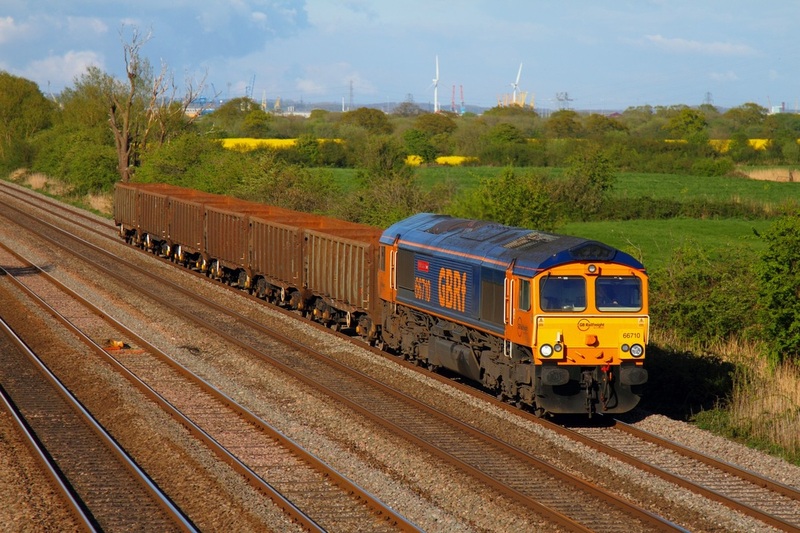 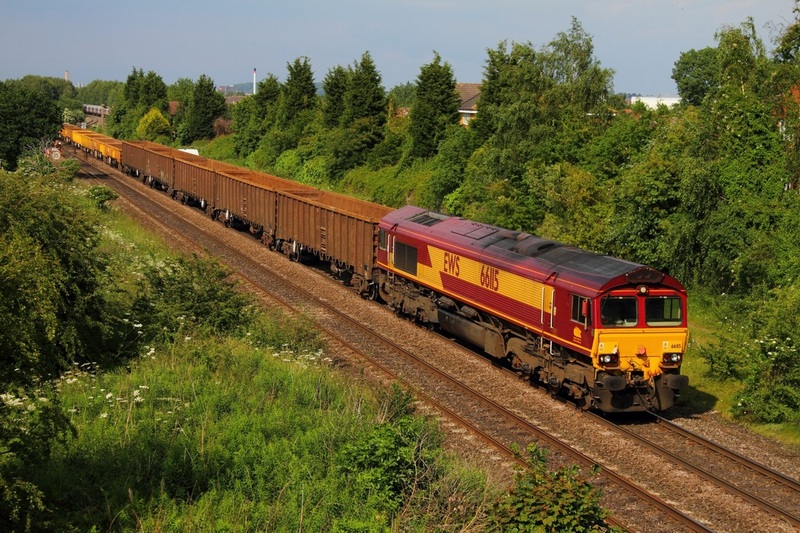 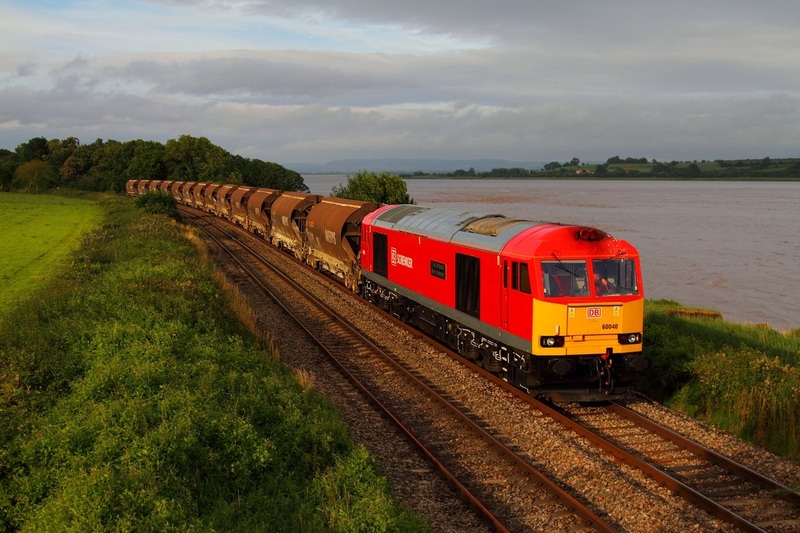 On the 25th May 2012, GBRF 66715 powers the 6Z30 Handsworth to Cardiff Tidal loaded scrap at Purton, running in an earlier path. 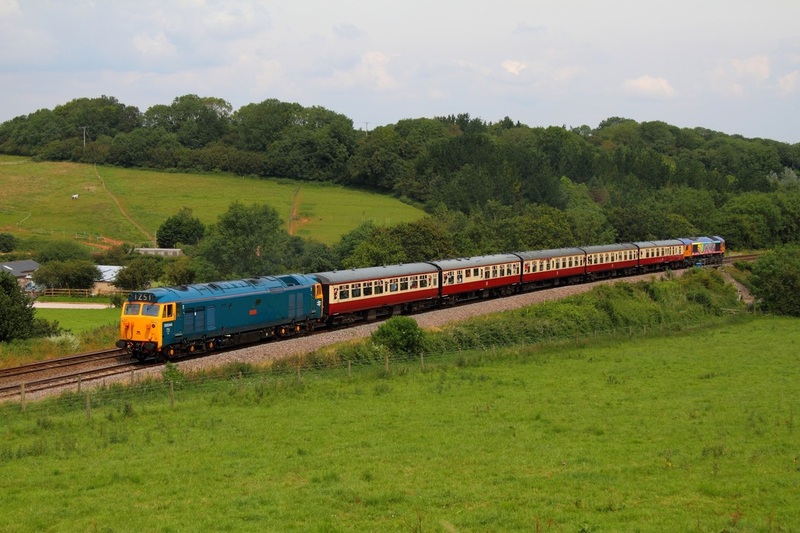 On the 1st June 2012, Br Blue 47580 hurries through Goytre powering the mighty 5Z93 Carnforth to Bristol Temple Meads ECS for a Statesman railtour. 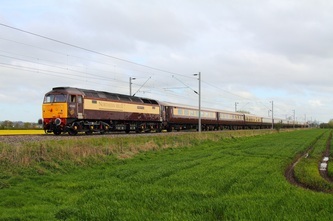 47854 'Diamond Jubilee' was on the rear. 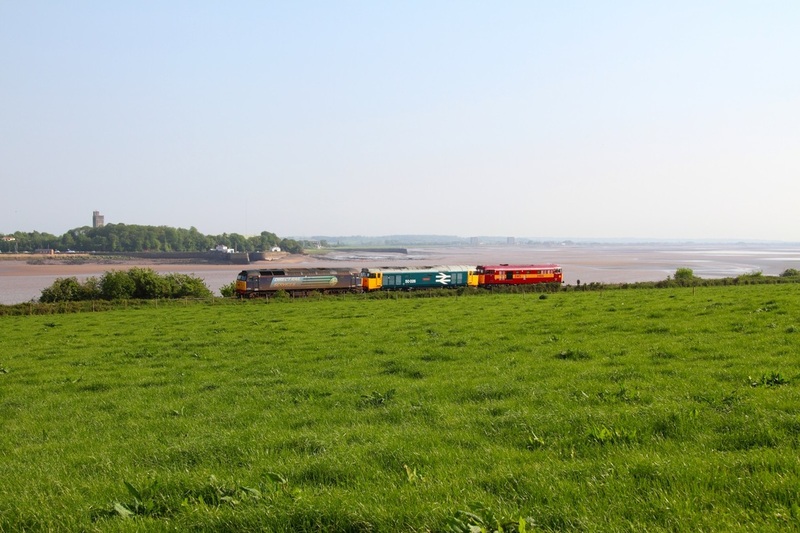 On the 25th May 2012, DCR 56311 works the 6Z56 Shipley to Cardiff Tidal loaded scrap at Purton in the last of the day's sunshine. 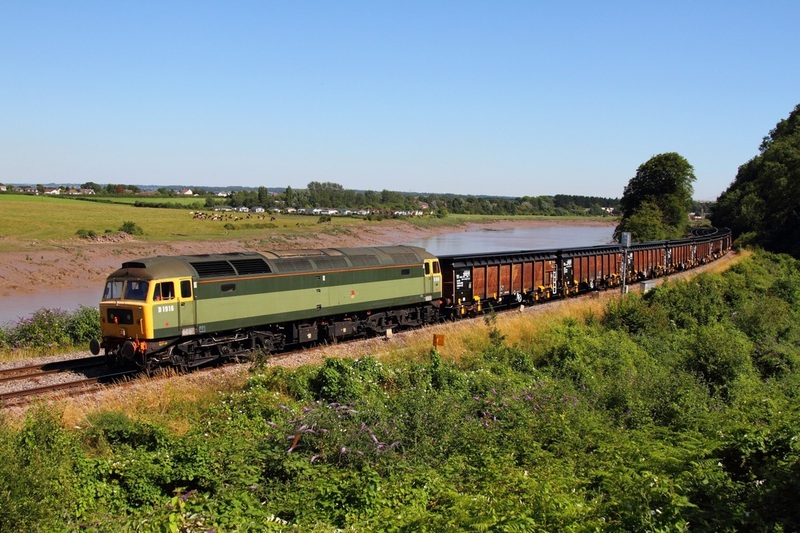 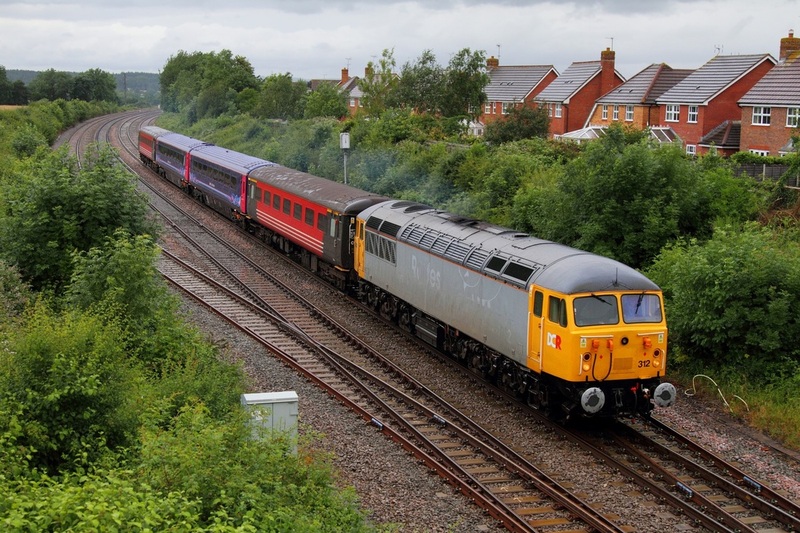 On the 25th May 2012, West Coast Railway Company's 47854 leads 47851 hauling the 5Z93 Carnforth to Bristol Temple Meads at Goytre. 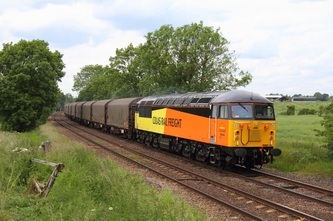 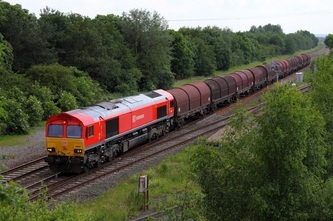 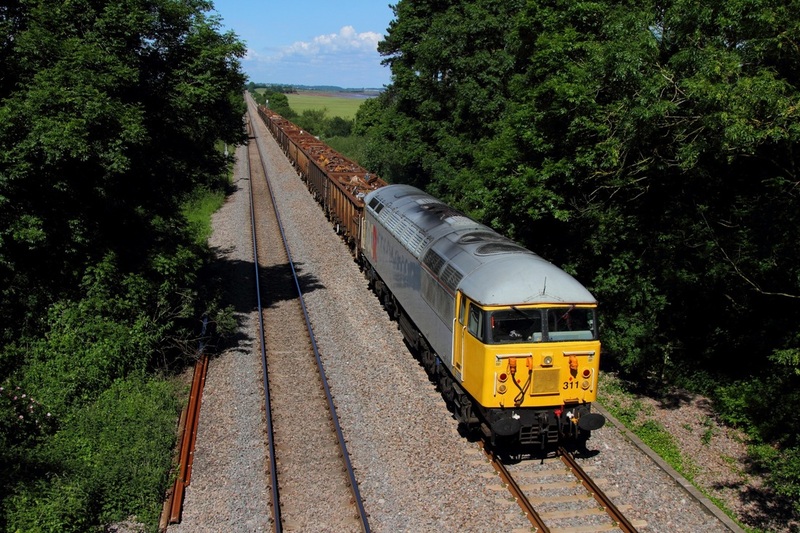 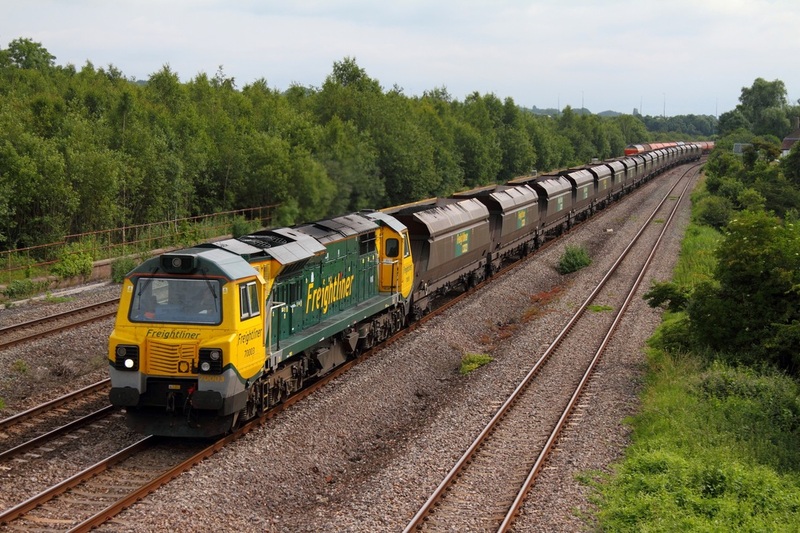 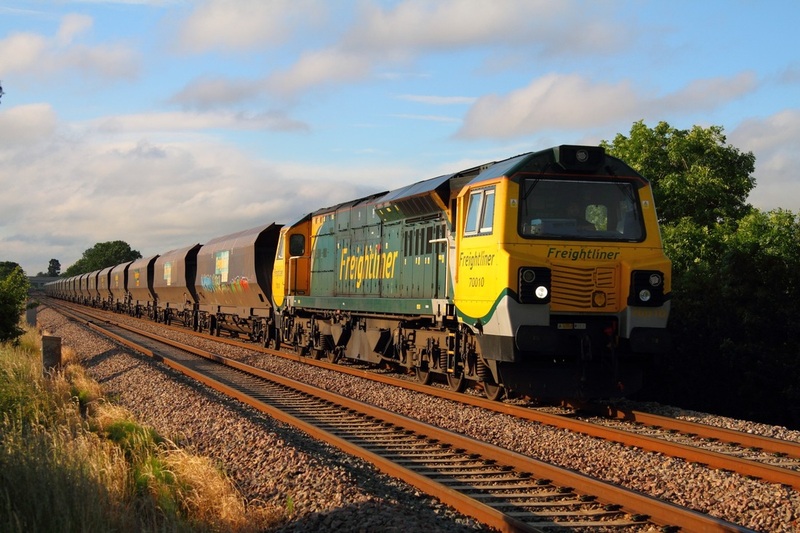 On the 24th May 2012, Malcolm liveried 66434 hauled a rather late 4V38 Daventry to Wentloog at Thornwell. 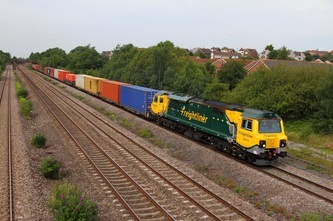 Colas Rail freight liveried 66850 powers the 6Z51 Baglan Bay to Teigngrace loaded timber at Ponthir on the 22nd May 2012. 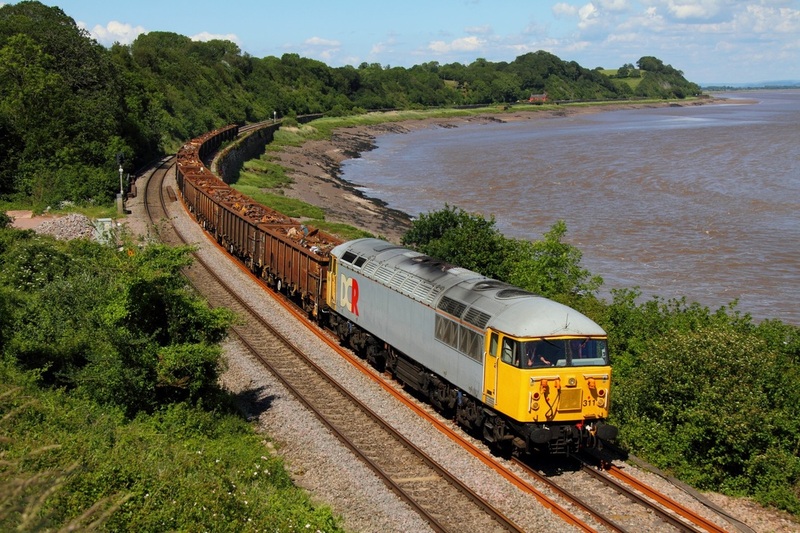 This was the first timber working from Baglan. 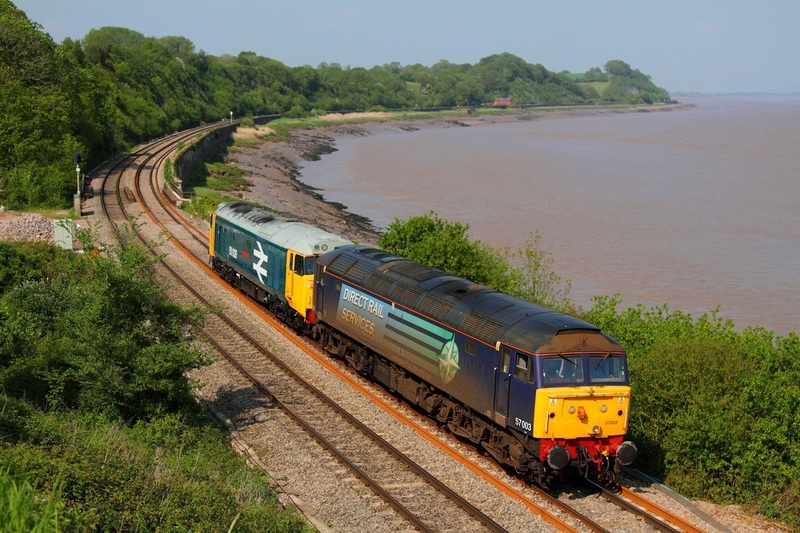 On the 23rd May 2012, DRS 57003 hauls Large Logo blue 50026 and EWS liveried 31466 at Purton working as the 0Z77 Lydney to Burton. 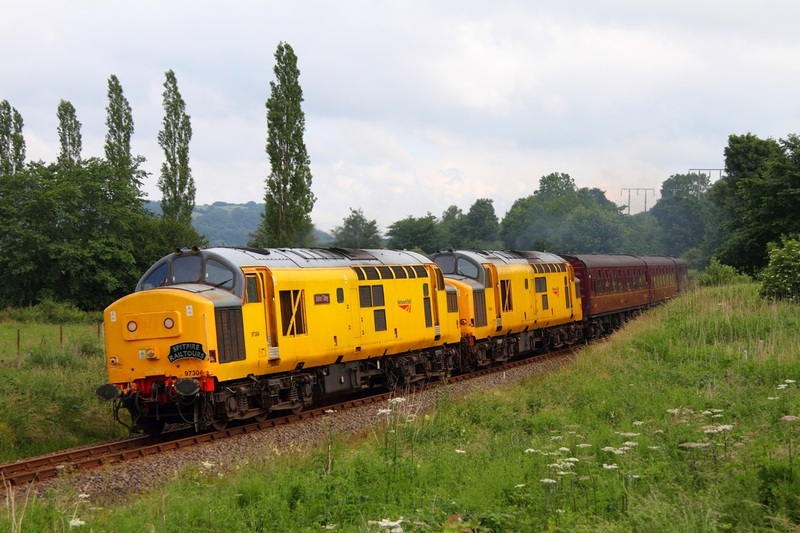 The convoy was picking up 33103 from Burton and all locomotives are going to the Keighley and Worth Valley Railway for their upcoming diesel gala. 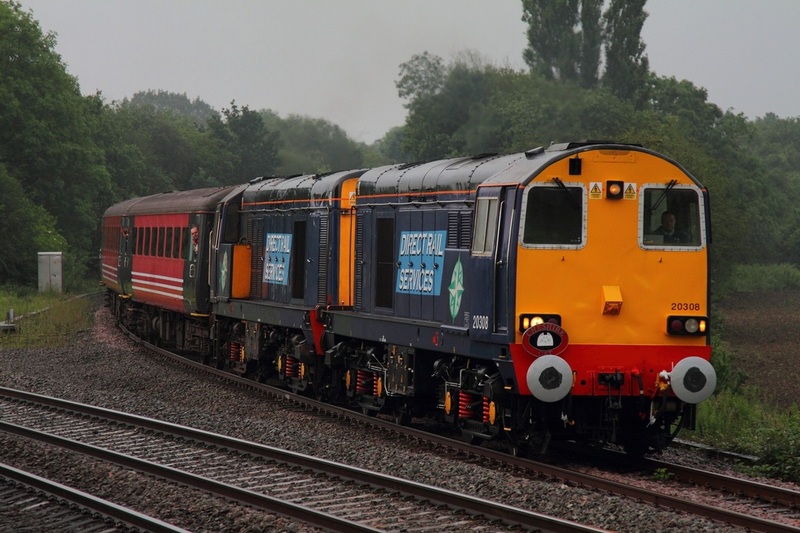 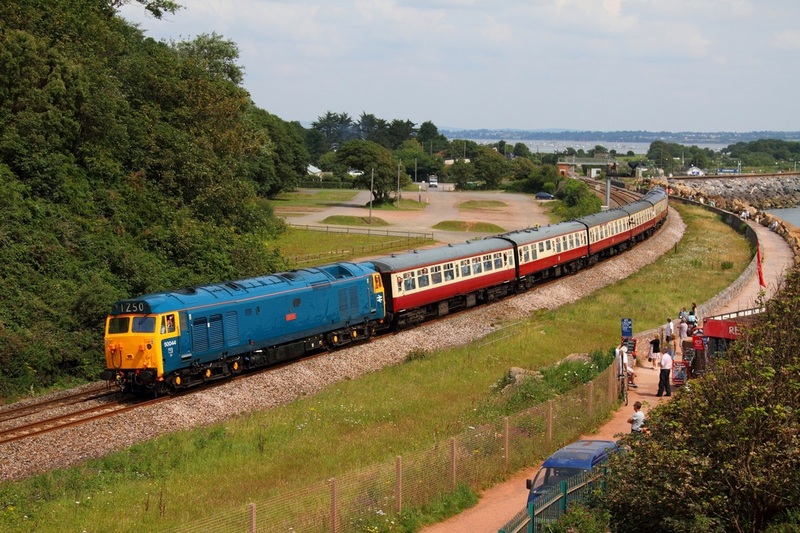 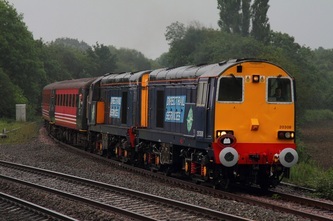 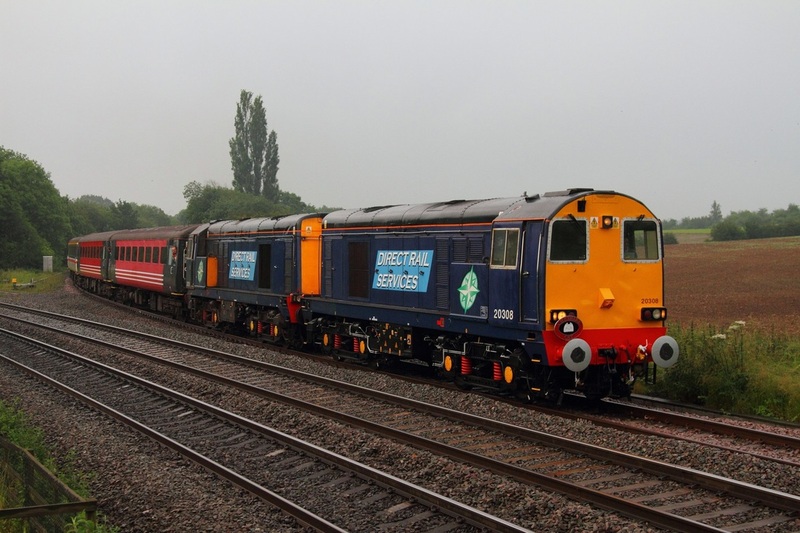 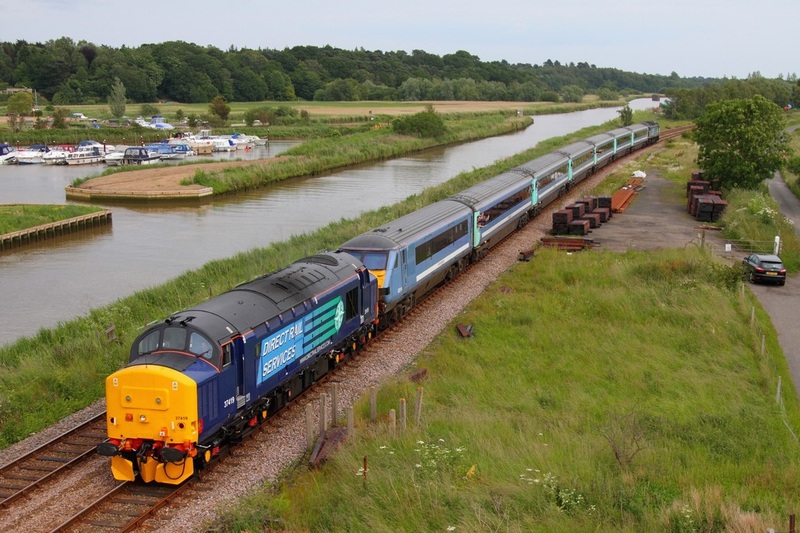 On the 23rd May 2012, DRS 57003 leads Br Large Logo blue 50026 at Purton whilst powering the 0Z76 Eastleigh to Lydney to pick up the Dean Forest Railway's 31466. 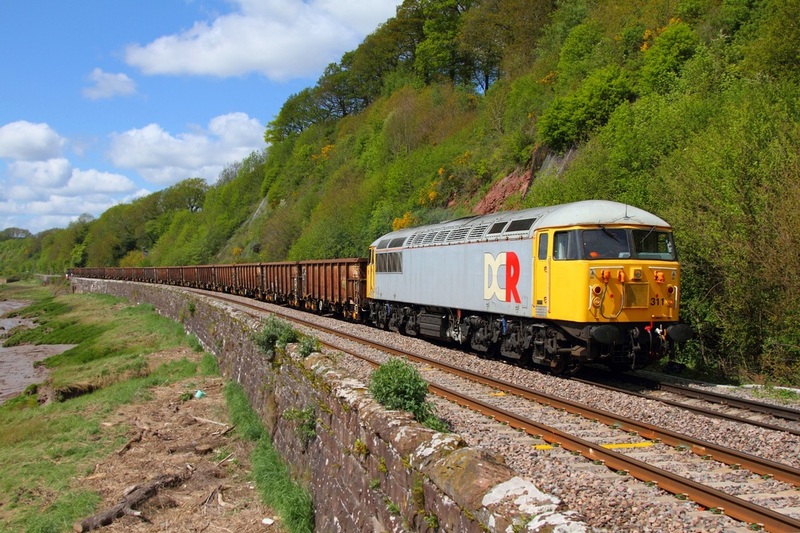 DCR 56311 makes a fine sight as it hauls the 6Z56 Cardiff Tidal to Chaddesdon empty scrap at Gatcombe on the 12th May 2012. 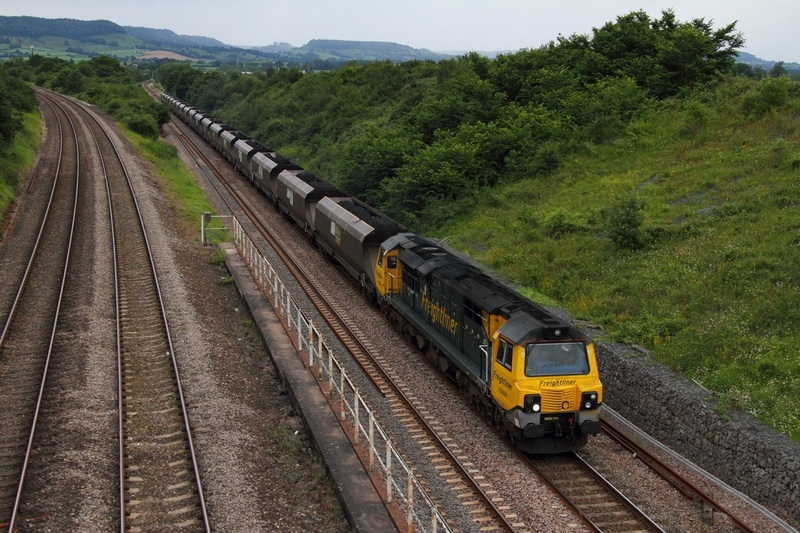 EWS liveried 66061 powers the 7W32 Westbury to Cardiff Central via Margam consisting of new colas cranes DR78235 and DR78226 at Coedkernew on the 12th May 2012. DRS 37603 leads 37605 south at Pandy whilst powering the usually booked NMT, 1Q88 Crewe CS to Derby RTC via Newport South Wales test train on the 18th May 2012. 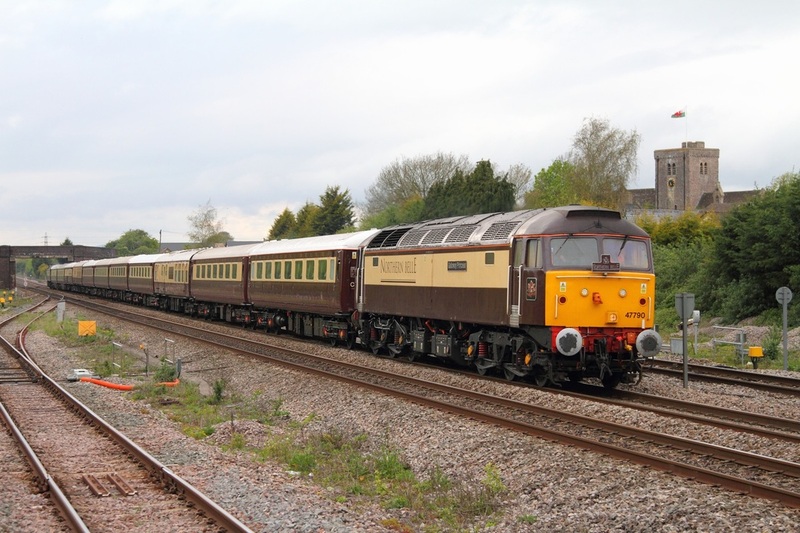 West Coast Railway's Company 47826 sporting "Scarborough Spa Express" adverting branding leads the 5Z77 Bristol Temple Meads to Carnforth at Liswerry on the 19th May 2012. 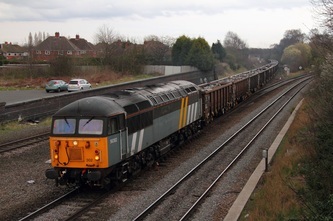 47804 was on the rear. 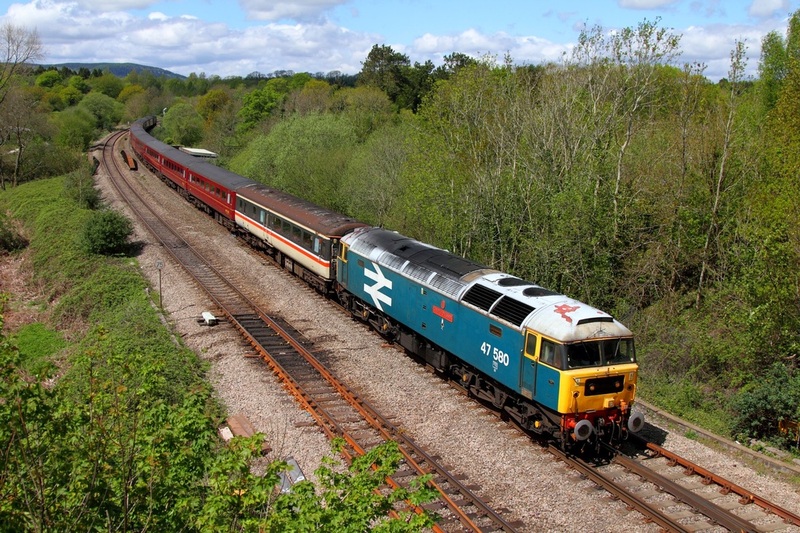 Br Large Logo Blue 47580 looking very nostalgic sweeps through Miskin east of Pontyclun powering the 1Z42 05:13 Dunfries to Cardiff Central 'The Heart of Wales Scenic Rambler' Compass Tours at Miskin on the 11th May 2012. 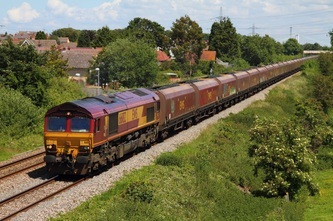 WCRC 47851 was on the rear. 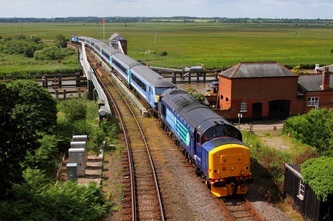 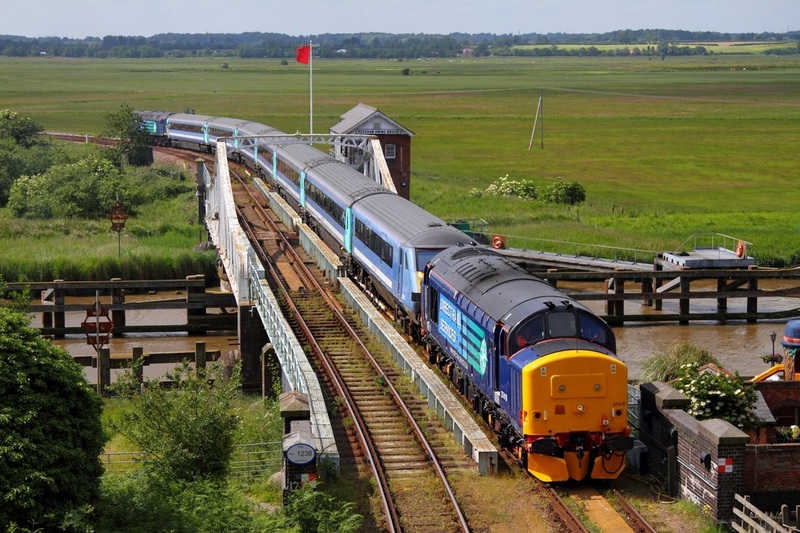 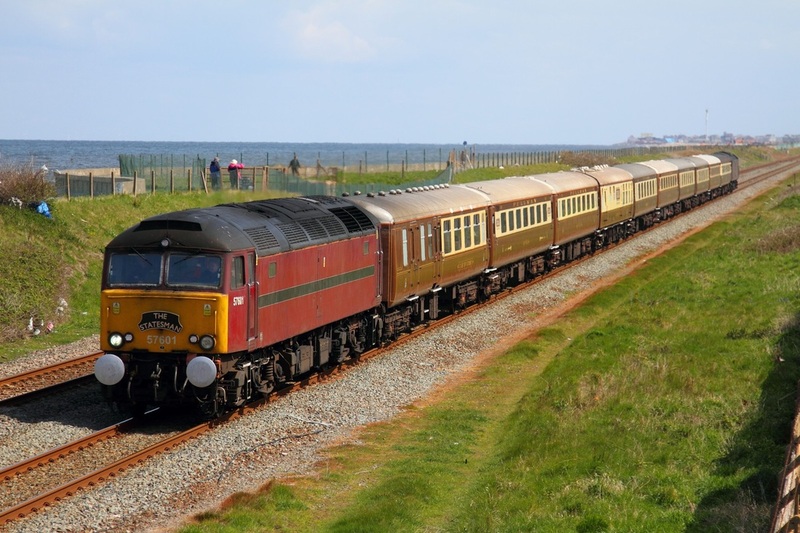 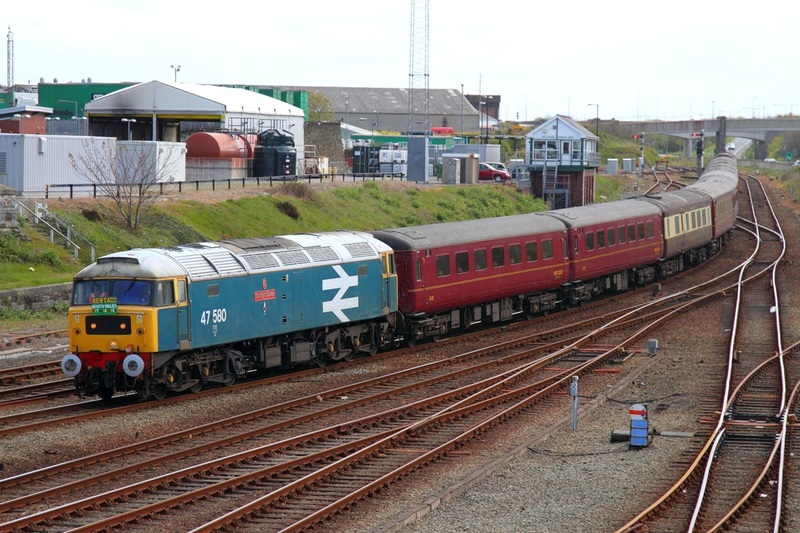 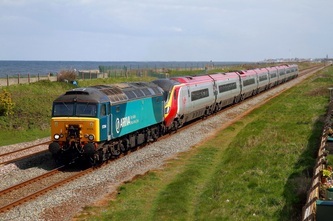 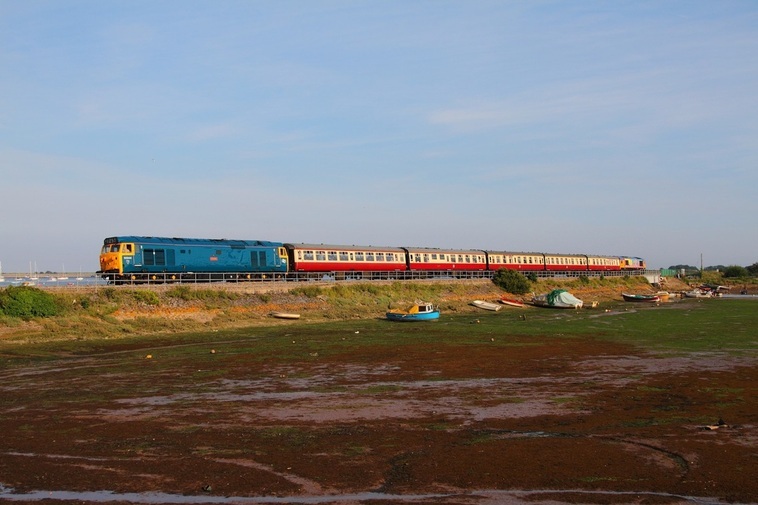 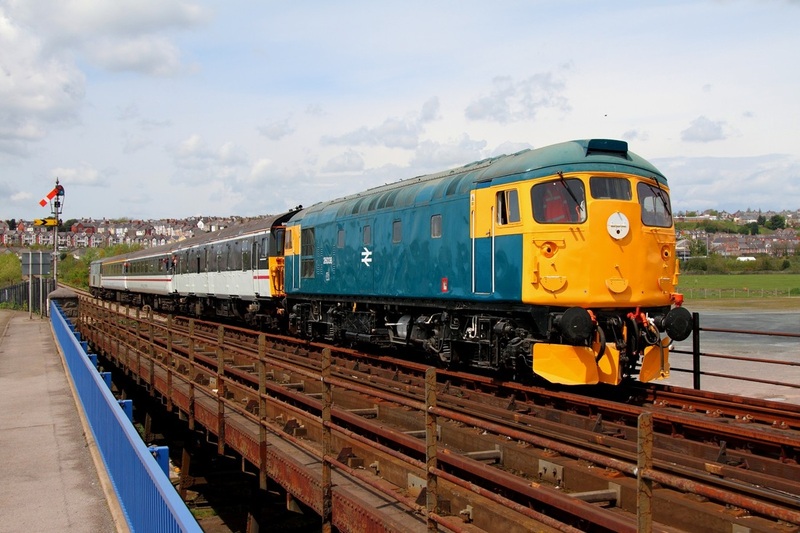 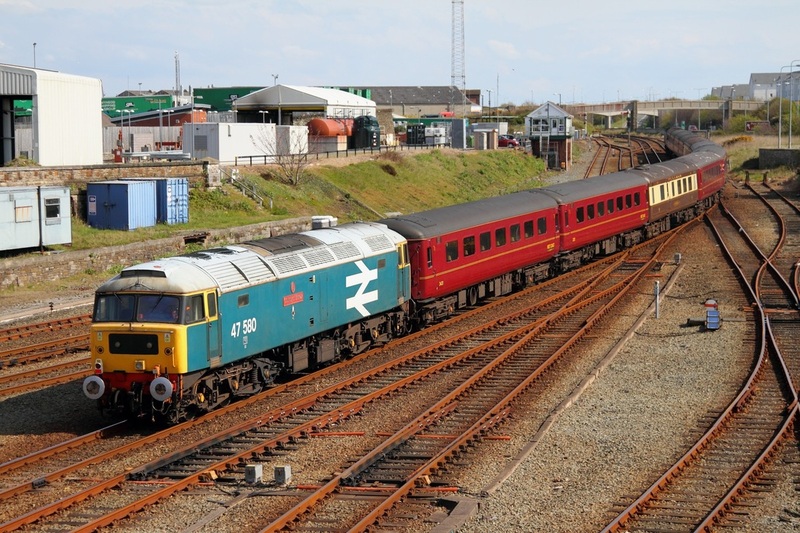 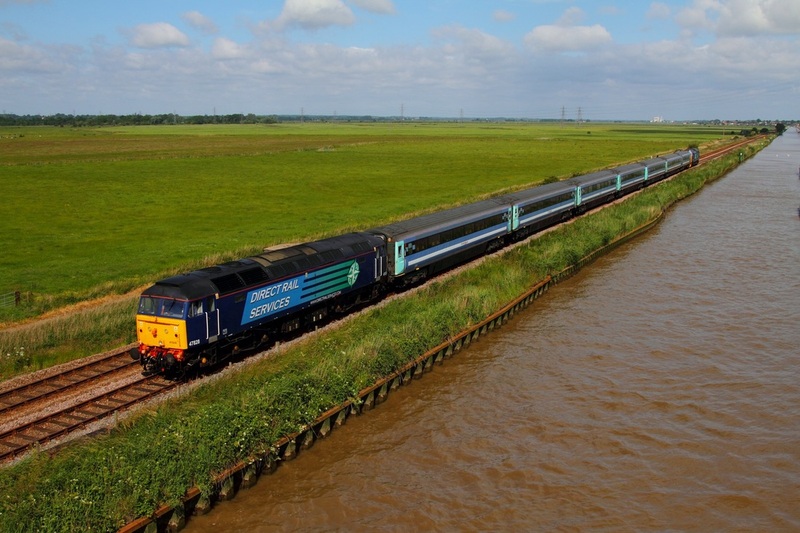 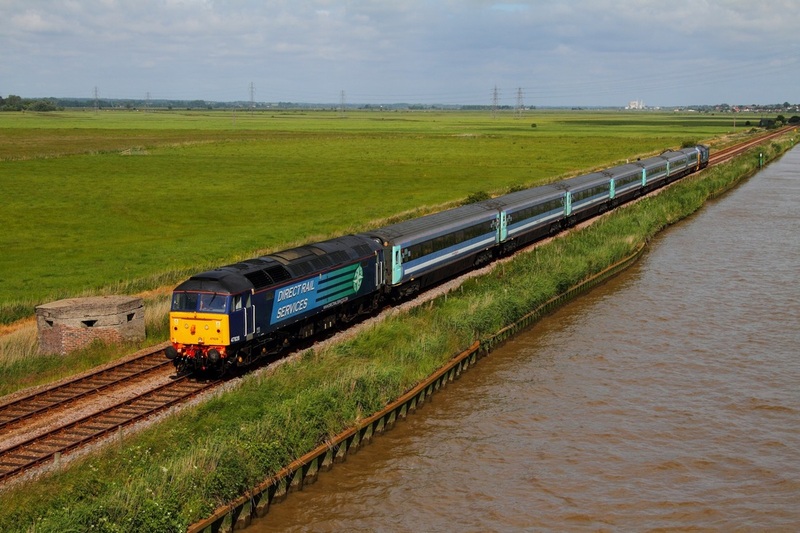 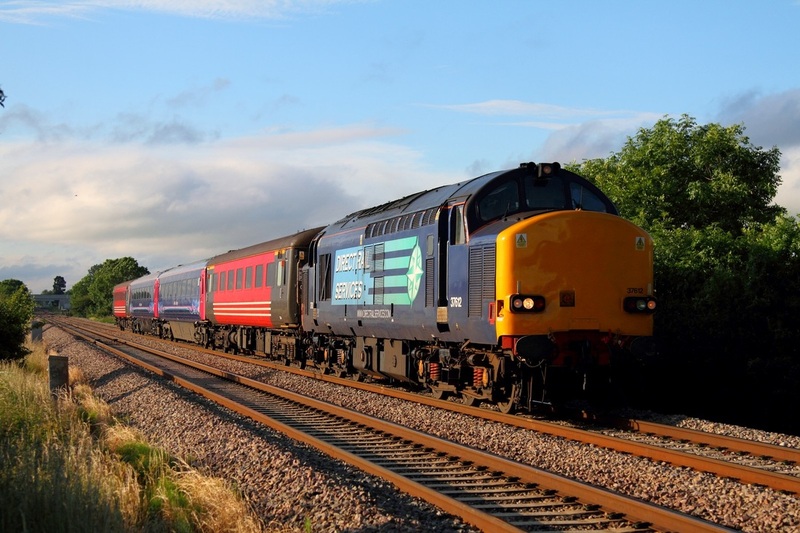 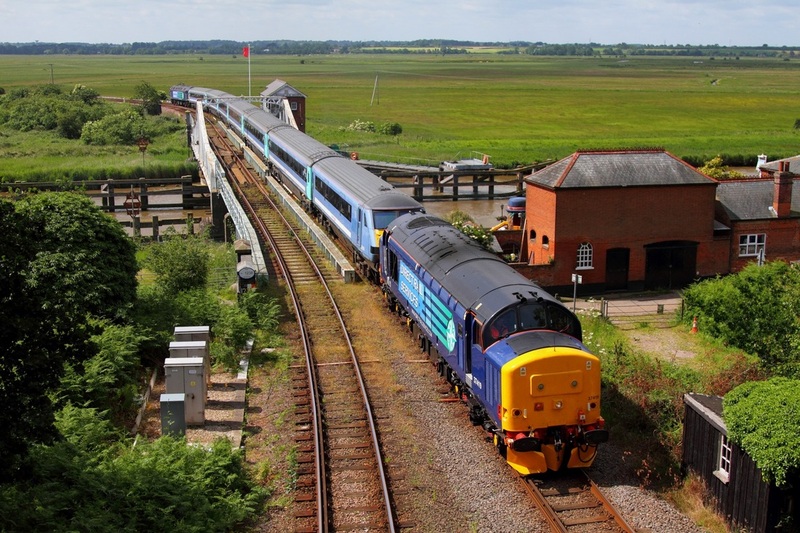 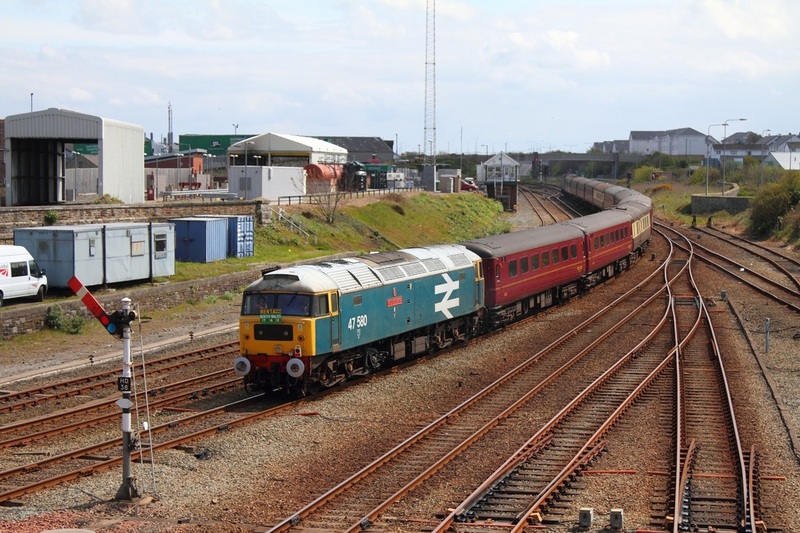 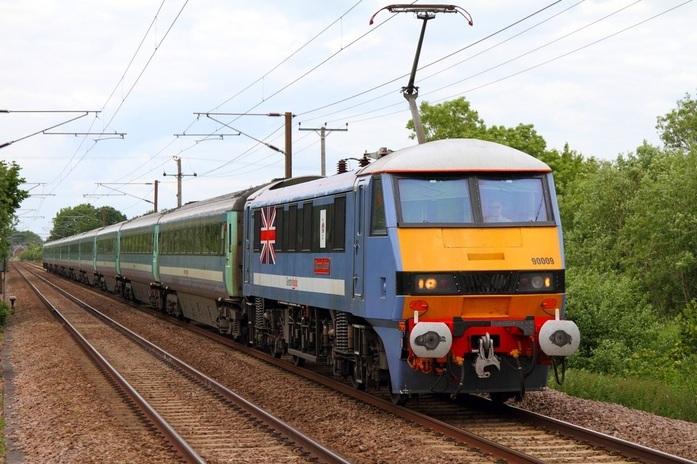 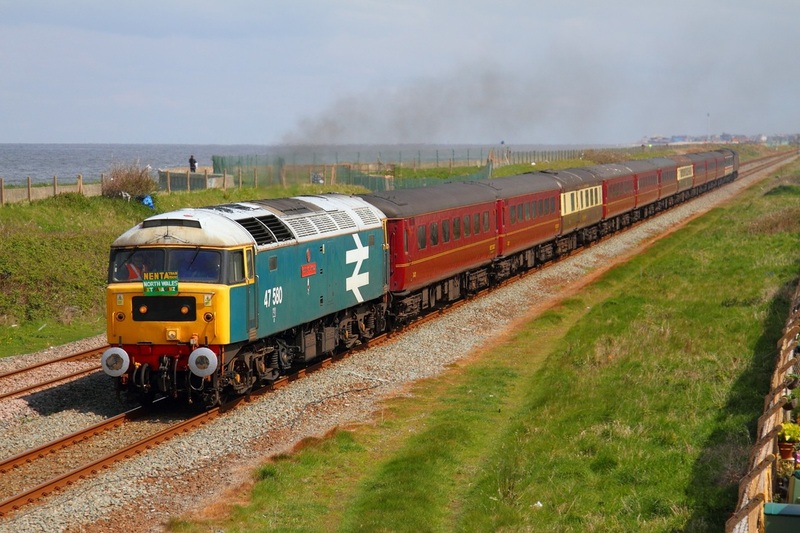 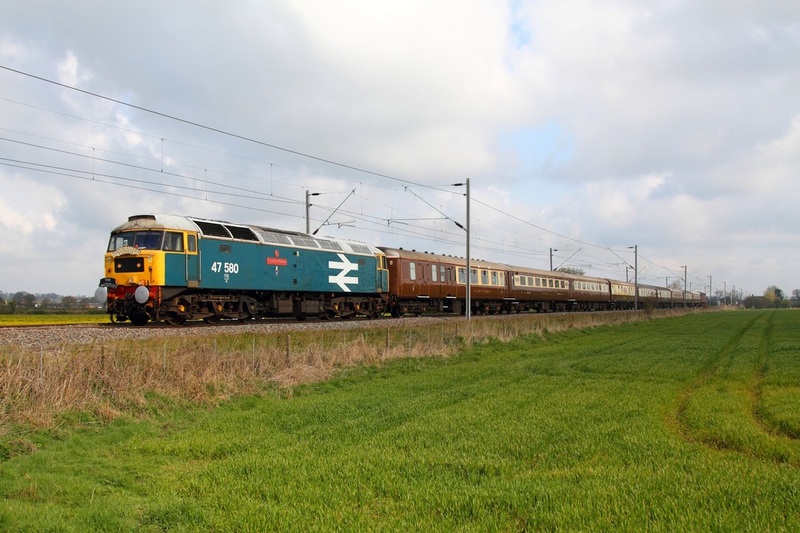 In connection with the Llandudno Festival, Nenta tours operated a 1Z35 Norwich to Holyhead railtour on the 5th May 2012 with Large Logo Blue liveried 47580 'County of Essex' a favourite with rail enthusiasts at the helm and WCRC 47851 on the rear. 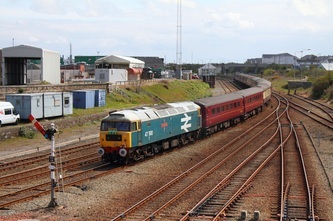 The tour hurries through Penmaenmawr on the North Wales coast. 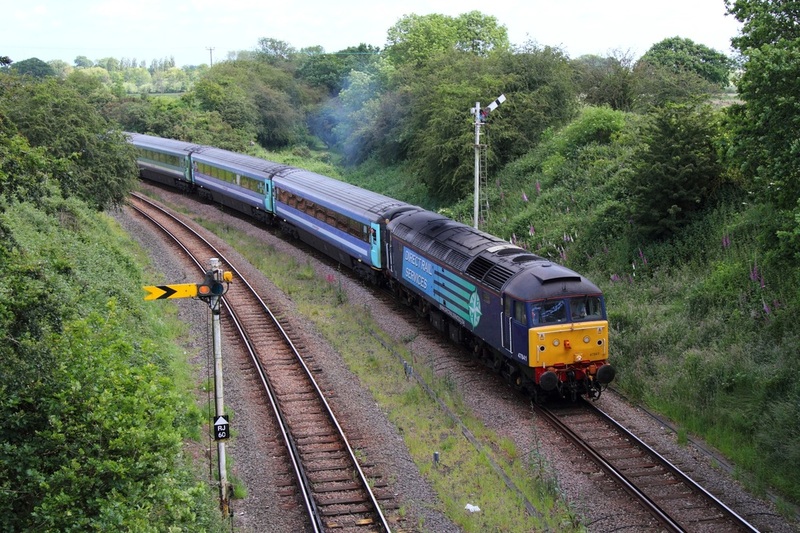 Nenta tours operated a 1Z35 Norwich to Holyhead railtour on the 5th May 2012 with Large Logo Blue liveried 47580 'County of Essex' a favourite with rail enthusiasts at the helm and WCRC 47851 on the rear. 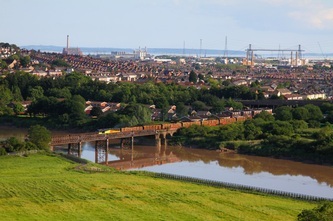 The tour hurries through Abergele on the North Wales coast. 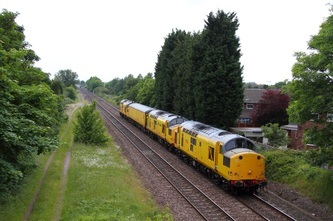 West Coast Railway's Company 47851 leads the returning 1Z36 Holyhead to Norwich Nenta tour at Valley with 47580 on the rear. 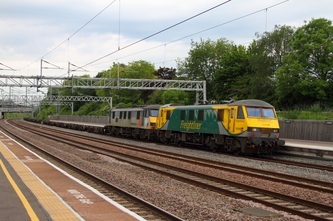 The tour passes 4965 and 5043 on the Valley triangle on the 5th May 2012. 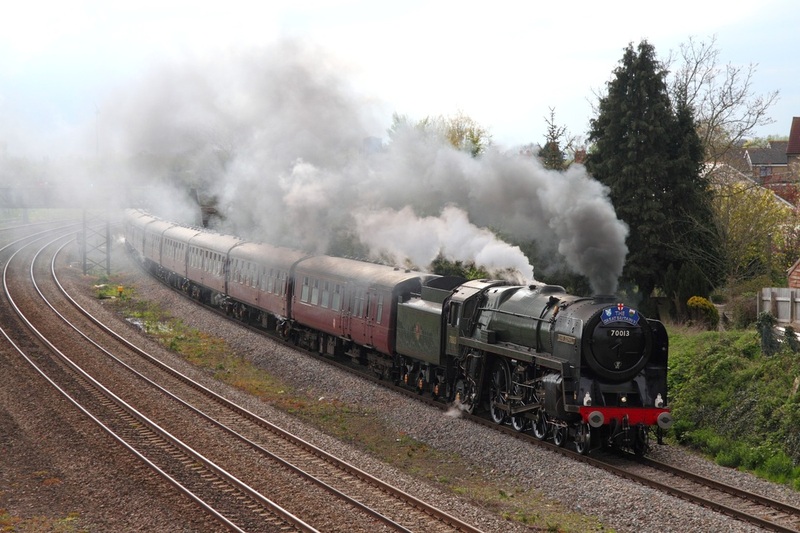 On the 5th May 2012, GWR Hall Class 4-6-0 no 4965 Rood Ashton Hall leads GWR Castle Class 4-6-0 no 5043 Earl of Mount Edgcumbe powering the 1Z33 Tyseley Warwick Road to Llandudno "The Llandudno Victorian Festival Special" at Dunston. 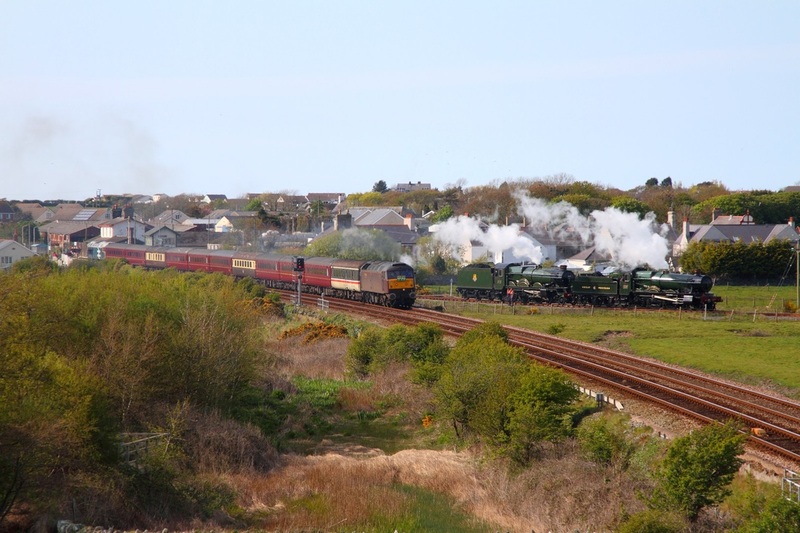 On the 5th May 2012, GWR Hall Class 4-6-0 no 4965 Rood Ashton Hall leads GWR Castle Class 4-6-0 no 5043 Earl of Mount Edgcumbe powering the 1Z33 Tyseley Warwick Road to Llandudno "The Llandudno Victorian Festival Special" at Abergele. 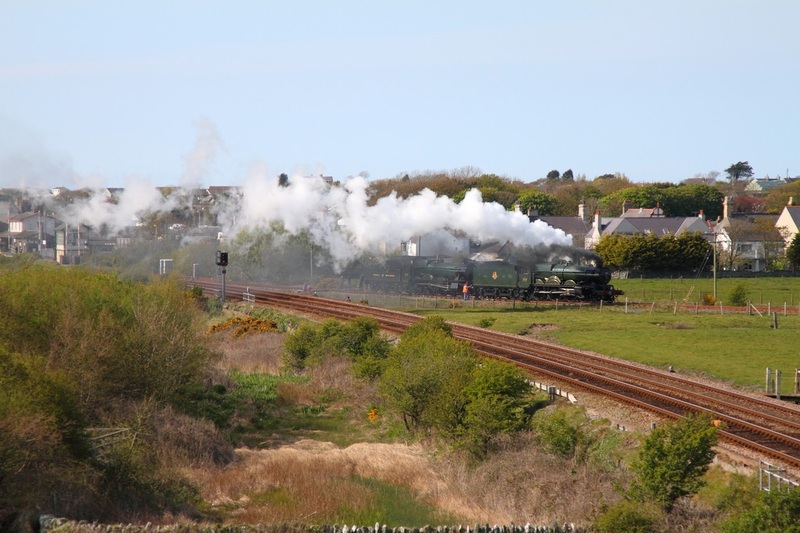 On the 5th May 2012, GWR Hall Class 4-6-0 no 4965 Rood Ashton Hall leads GWR Castle Class 4-6-0 no 5043 Earl of Mount Edgcumbe powering the 0Z33 Llandudno junction to Llandudno junction via Valley and the Valley triangle for turning and water. 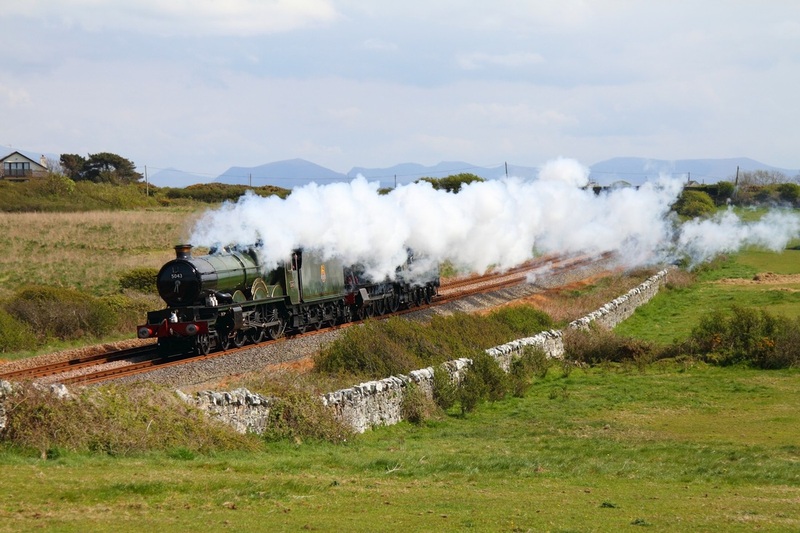 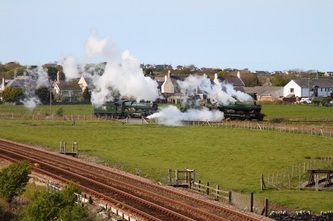 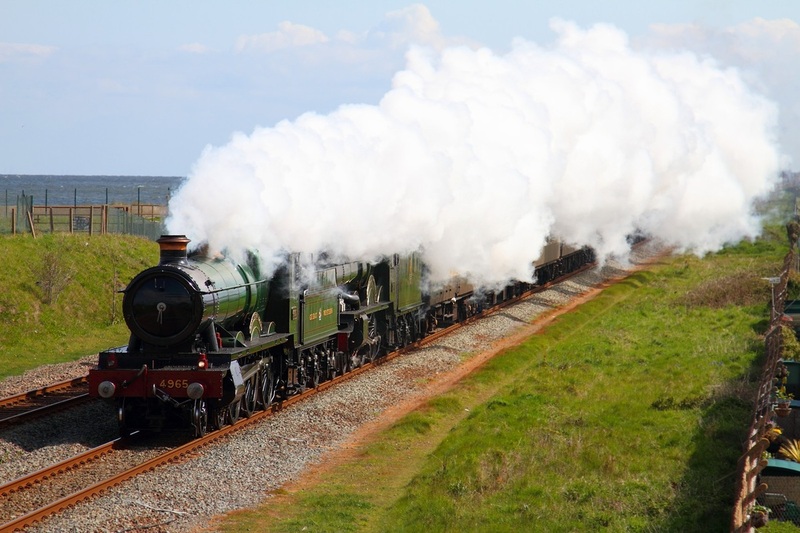 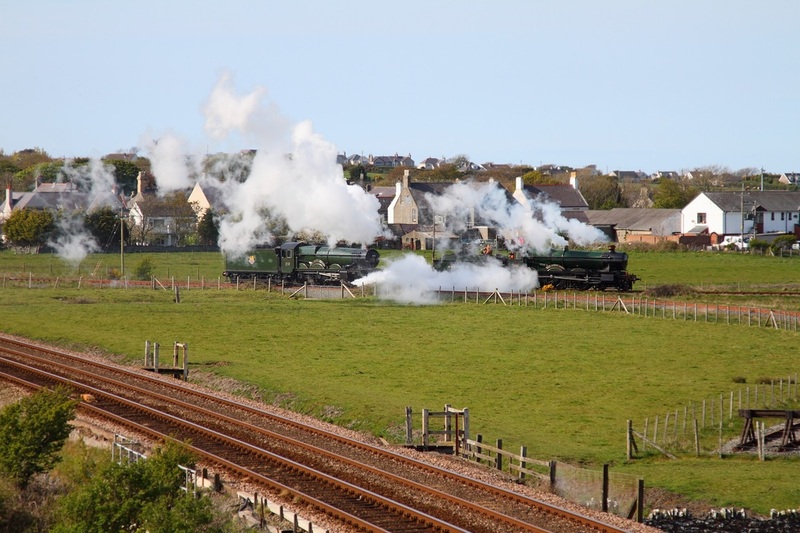 The steamy pair pass through Rhosneigr. 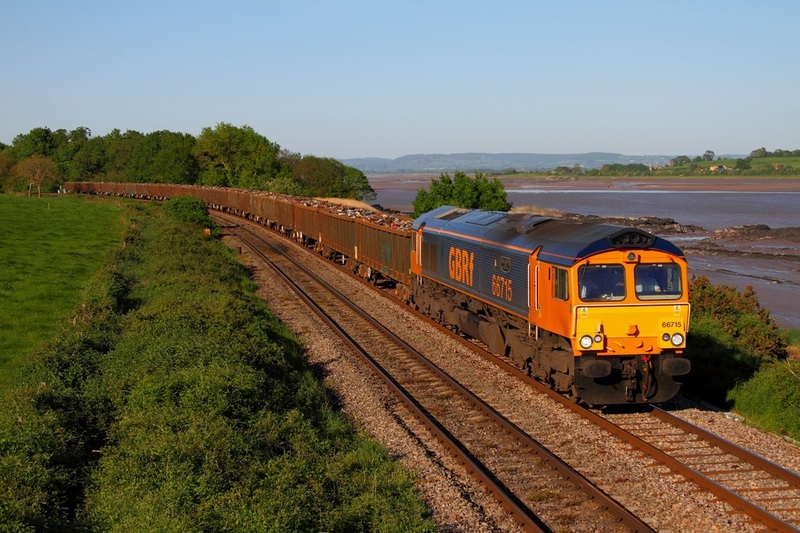 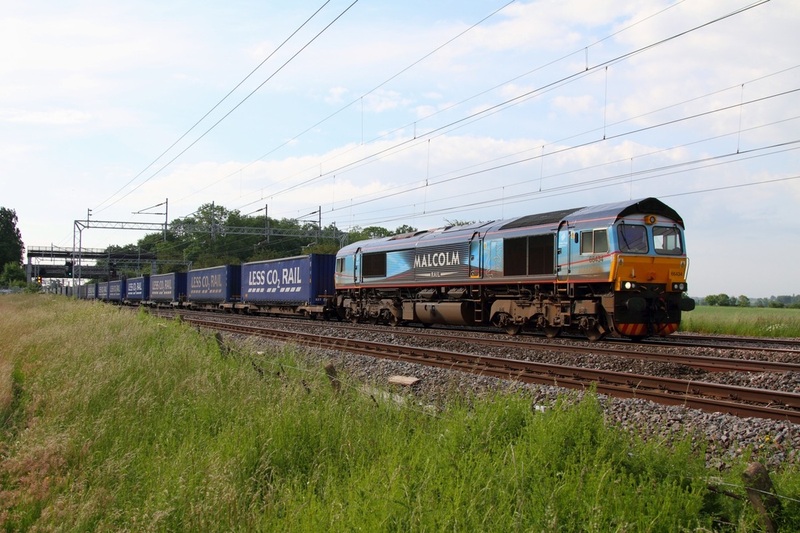 GBRF 66710 'Phil Packer BRIT' hauls the 6Z60 Doncaster Robert Roads sidings to Cardiff Tidal consisting of six empty scrap box wagons off the M48 Severn Bridge on the 1st May 2012. 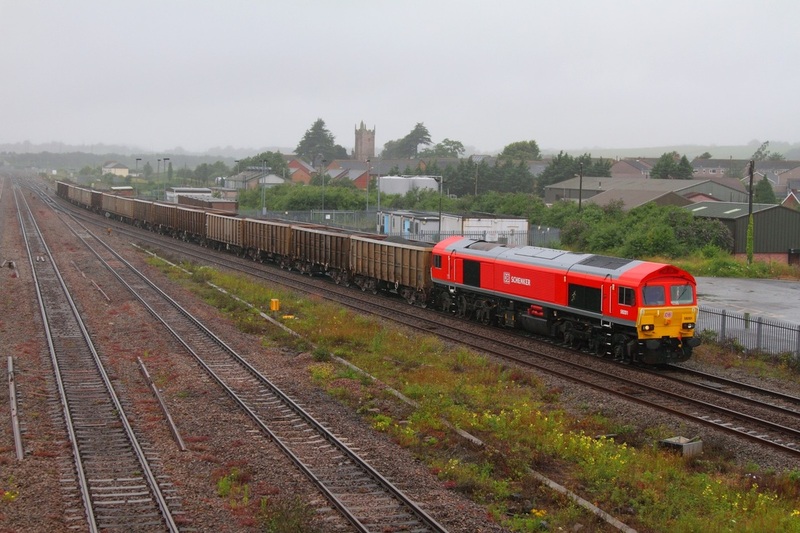 GBRF 66710 'Phil Packer BRIT' hauls the 6Z60 Doncaster Robert Roads sidings to Cardiff Tidal consisting of six empty scrap box wagons at Coedkernow on the 1st May 2012. 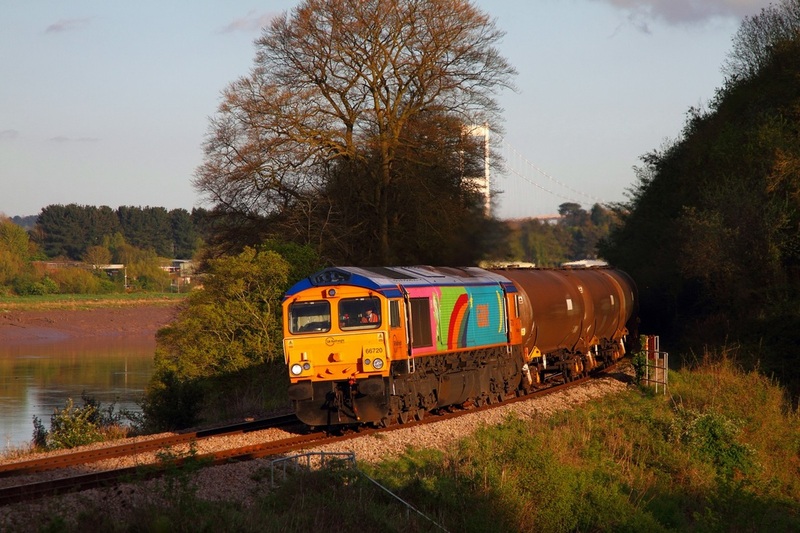 GBRF's Rainbow liveried 66720 (night version) curves the bend at Duffryn whilst powering the 6E01 Cardiff Tidal to Lindsey tanks on the 1st May 2012. GBRF's Rainbow liveried 66720 (night version) curves the bend at Thornwell whilst powering the 6E01 Cardiff Tidal to Lindsey tanks on the 1st May 2012. 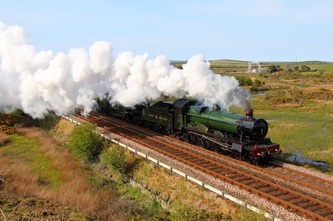 BR Britannia Class 7MT 4-6-2 no. 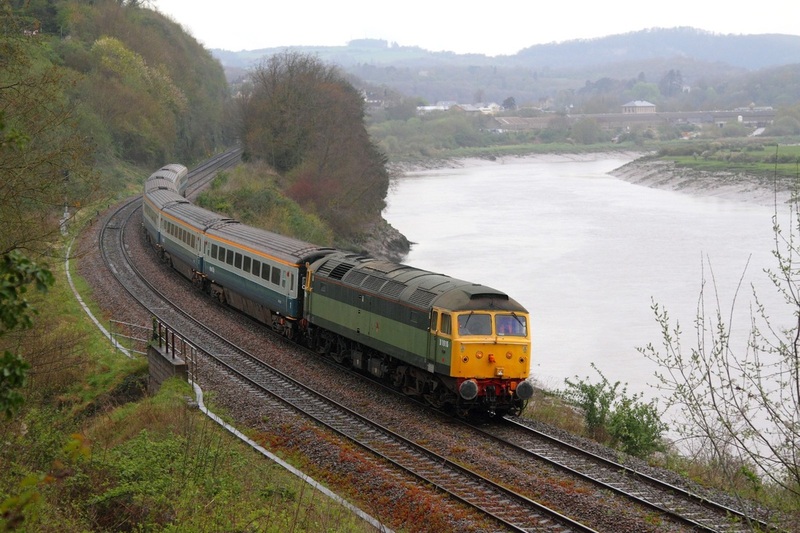 70013 Oliver Cromwell hauls the 1Z59 10:56 Preston to Bristol Temple Meads 'The Great Britain V' railtour takes on water at the old station site of Magor which closed in November 1964 although the freight yards remained open until 1965 for freight traffic such as cement in connection with the construction of the M4 motorway. 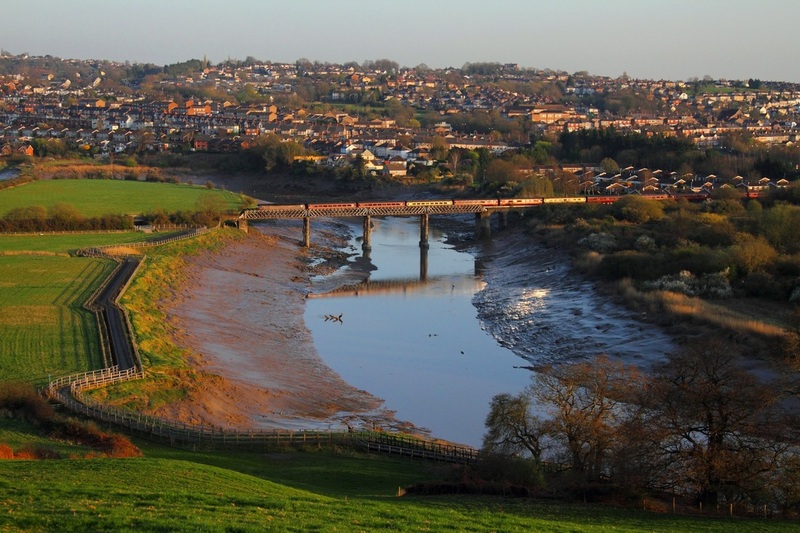 In the right corner of the frame, is St Marys Church a grade 1 listed building as of 3rd January 1963. 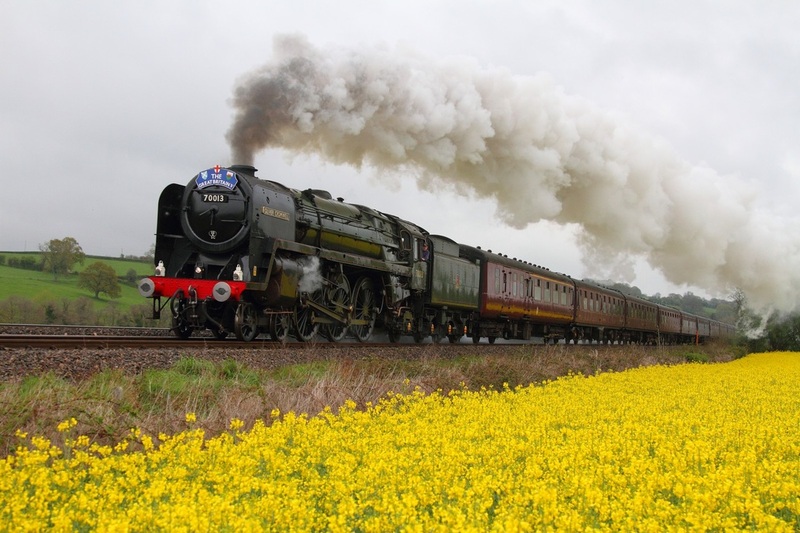 BR Britannia Class 7MT 4-6-2 no. 70013 Oliver Cromwell hauls the 1Z59 10:56 Preston to Bristol Temple Meads 'The Great Britain V' railtour at Pandy just north of Abergavenny on the 27th April 2012. 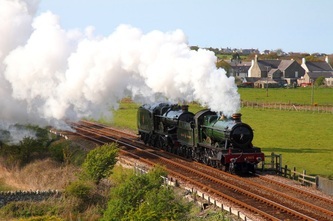 BR Britannia Class 7MT 4-6-2 no. 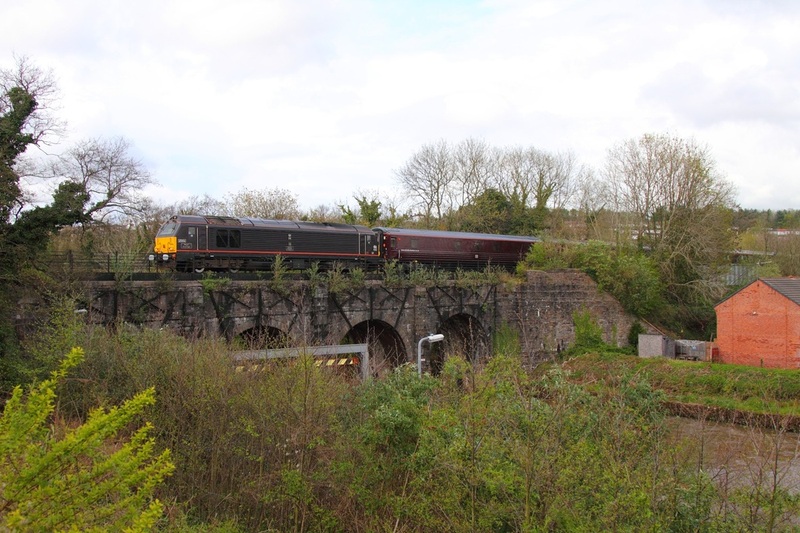 70013 Oliver Cromwell hauls the 1Z59 10:56 Preston to Bristol Temple Meads 'The Great Britain V' railtour at the old site of Undy halt station shortly after a water stop in Magor on the 27th April 2012. The loco would pair up tomorrow with 34067 Tangmere for a long trip to Penzance. 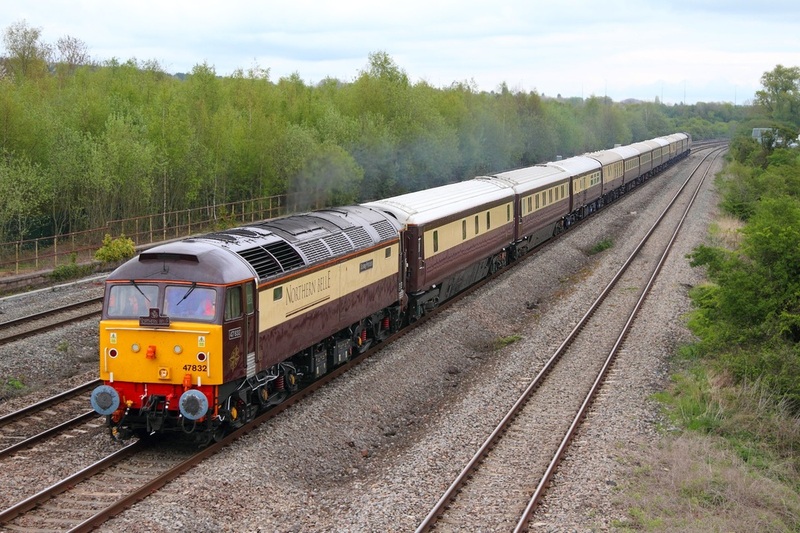 Northern Belle liveried 47832 ex-47560 'Solway Princess' top-and-tailed with class mate 47790 ex-47673 'Galloway Princess' leads the luxurious Northern Belle train as the 5Z40 12:20 Bath to Cardiff Pengam sidings at Undy on the 27th April 2012. 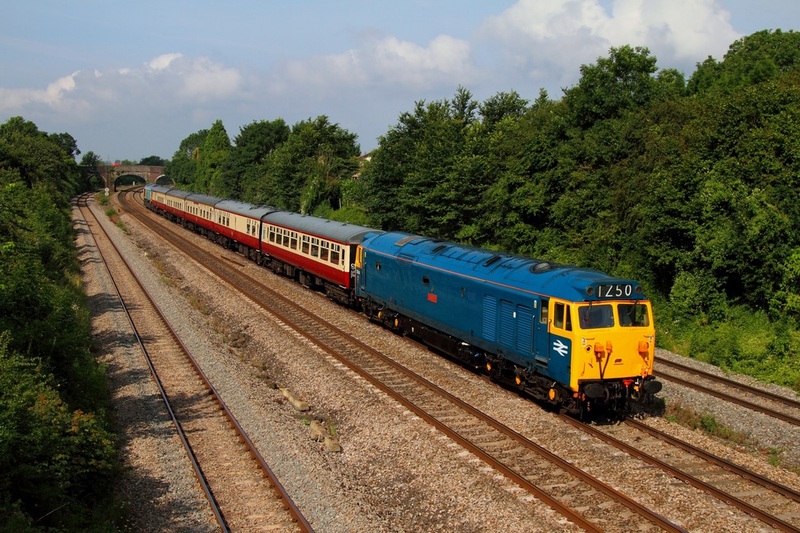 The Excursion had operated from Norwich to Bath and the Empty coaches were going to Pengam for stabling. 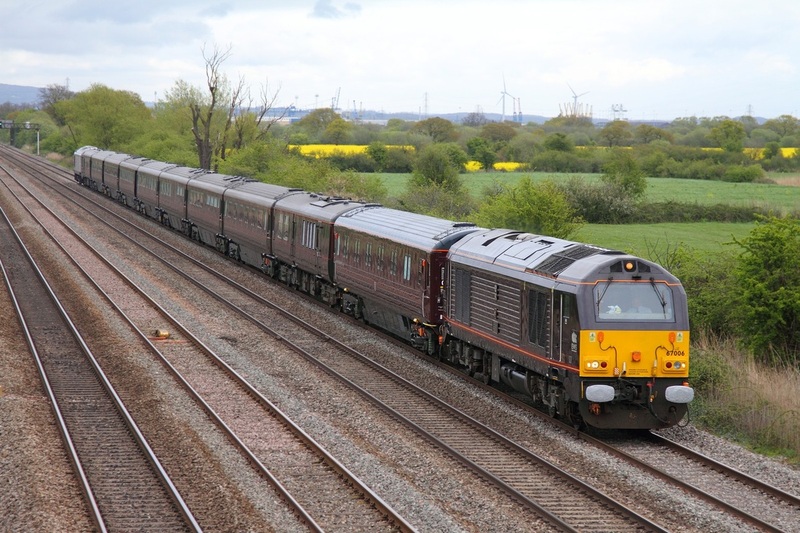 Northern Belle 47790 Galloway Princess and 47832 Solway Princess return the Northern Belle ECS as the 5Z41 16:50 Cardiff Pengam to Bath at Magor on the 27th April 2012. 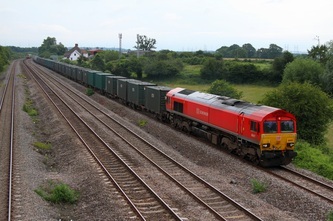 This is the site of the old Magor station which closed in November 1964 although the freight yards remained open until 1965 for freight traffic such as cement in connection with the construction of the M4 motorway. In the right corner of the frame, is St Marys Church a grade 1 listed building as of 3rd January 1963. Devon and Cornwall Railways 56311 rounds the curve at Thornwell on the 27th April 2012, powering the 6Z56 Cardiff Tidal to Chaddesden empty scrap train. 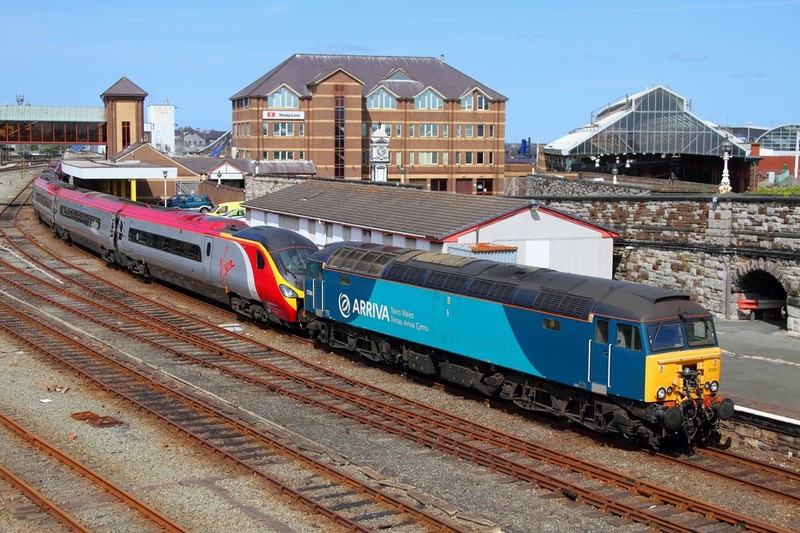 The earlier working, the 6Z34 11:00 from Cardiff Tidal was cancelled due to no train crew, although there was a Class 150 parked infront of the Grid at Cardiff Central blocking the loco from running light to Tidal initially to collect its train. 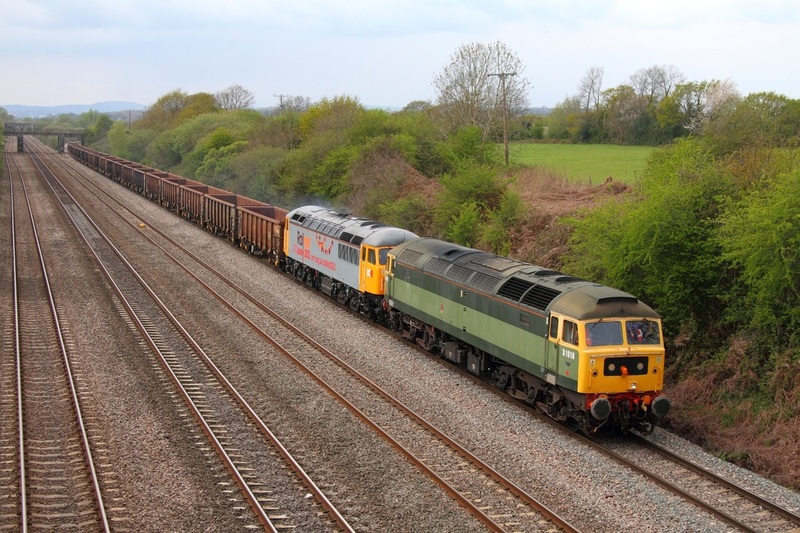 Devon and Cornwall Railways 56311 crawls pass the old station site at Magor on the 27th April 2012, powering the 6Z56 Cardiff Tidal to Chaddesden empty scrap train. 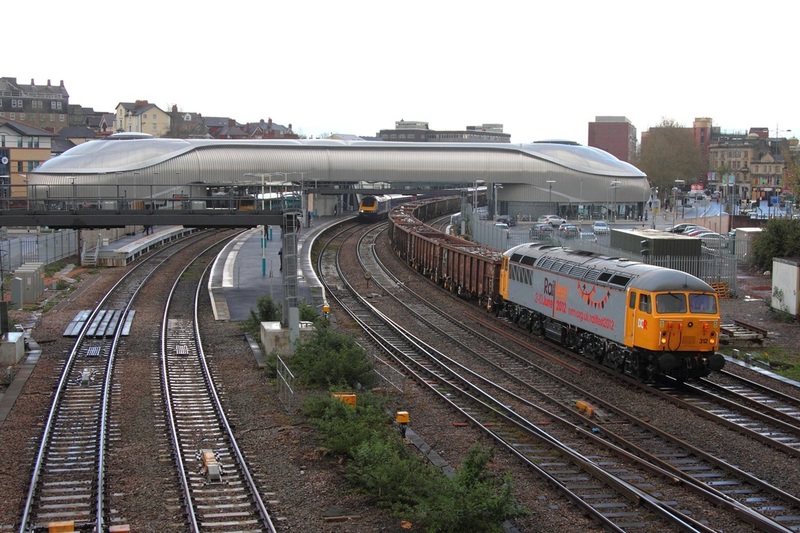 The earlier working, the 6Z34 11:00 from Cardiff Tidal was cancelled due to no train crew, although there was a Class 150 parked infront of the Grid at Cardiff Central blocking the loco from running light to Tidal initially to collect its train. 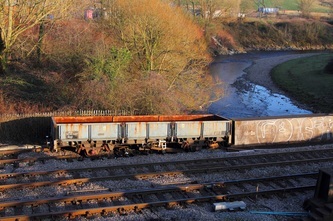 This is the site of the old Magor station which closed in November 1964 although the freight yards remained open until 1965 for freight traffic such as cement in connection with the construction of the M4 motorway. 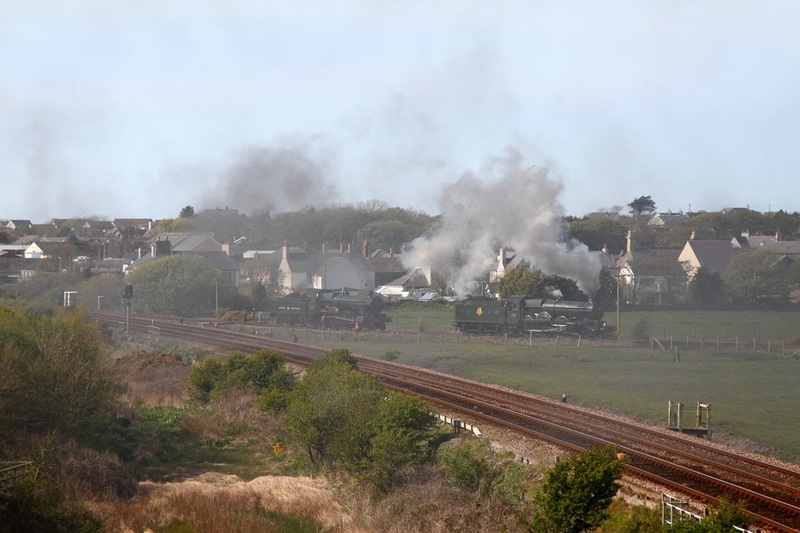 In the right corner of the frame, is St Marys Church a grade 1 listed building as of 3rd January 1963. Ex-Fastline DRS 66305 hauls the 4V38 Daventry to Wentloog Tesco Express at Undy running over 100minutes late on the 27th April 2012. 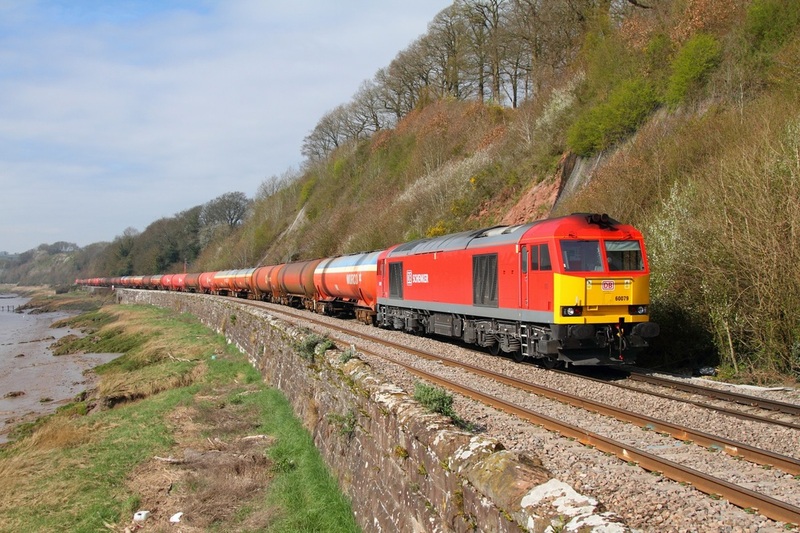 On the 21st April 2012, DB Schenker's Sky Blue 60074 'Teenage Spirit' powers the 6E41 Westerleigh to Lindsey tanks at Wickwar. On the 20th April 2012, in terrible photographic conditions, Grey with yellow cab ends, DCR branding and Railfest Advertisements 56312 leds Ex-Fastline liveried 56302 whilst powering the mighty 6Z34 Cardiff Tidal to Chaddesden empty scrap train at Ashchurch. 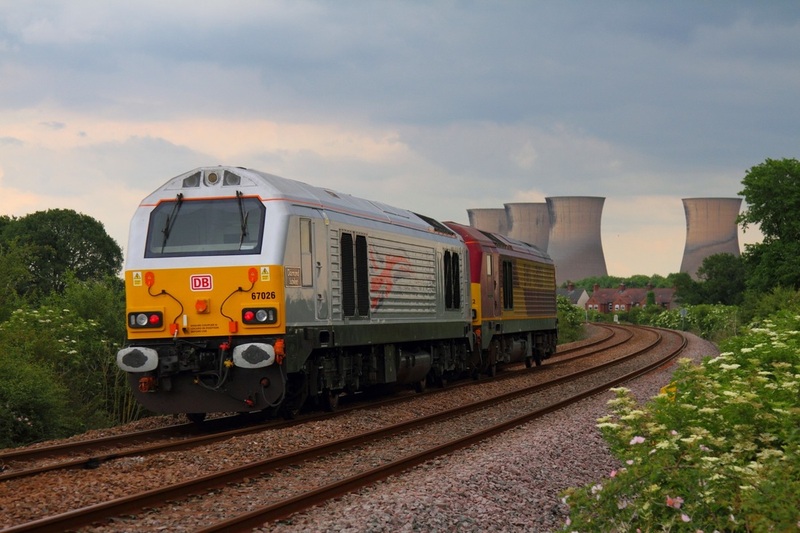 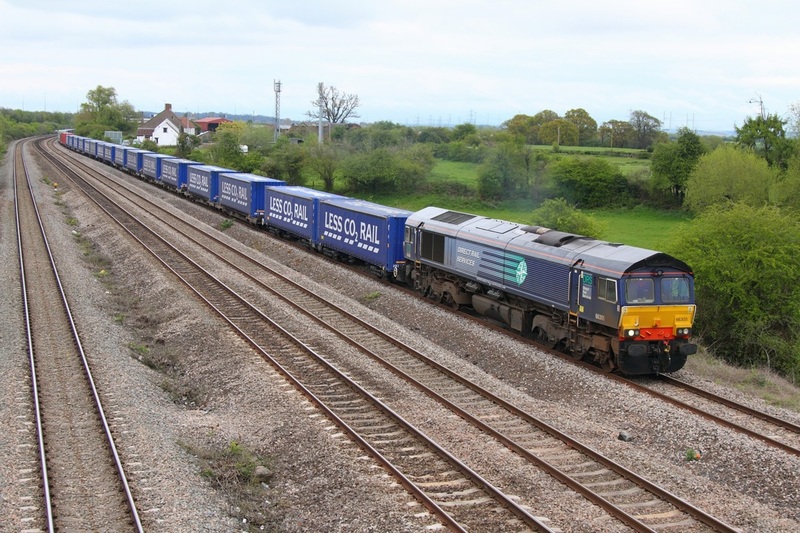 On the 20th April 202, I went to Ansty and photographed DB Schenker's EWS 67025 Western Star hauling the 5Z90 12:00 Wolverton Centre Sidings to Crewe and return Royal Train ECS adjacent to the Oxford Canal. 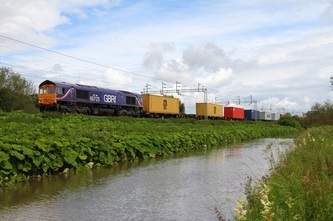 The Royal train coaches were being tested hence the ECS move. 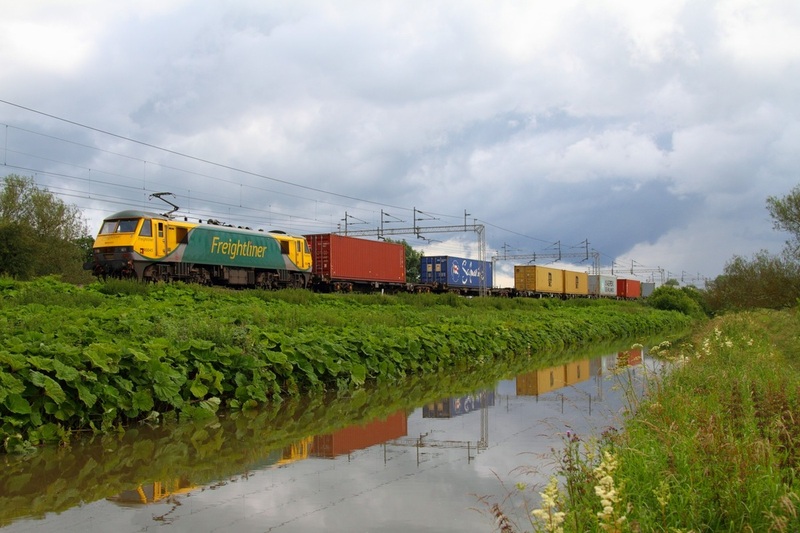 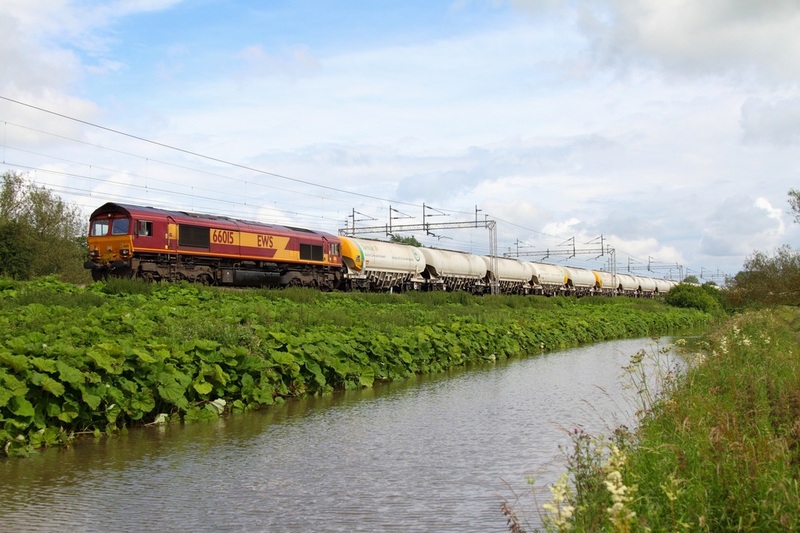 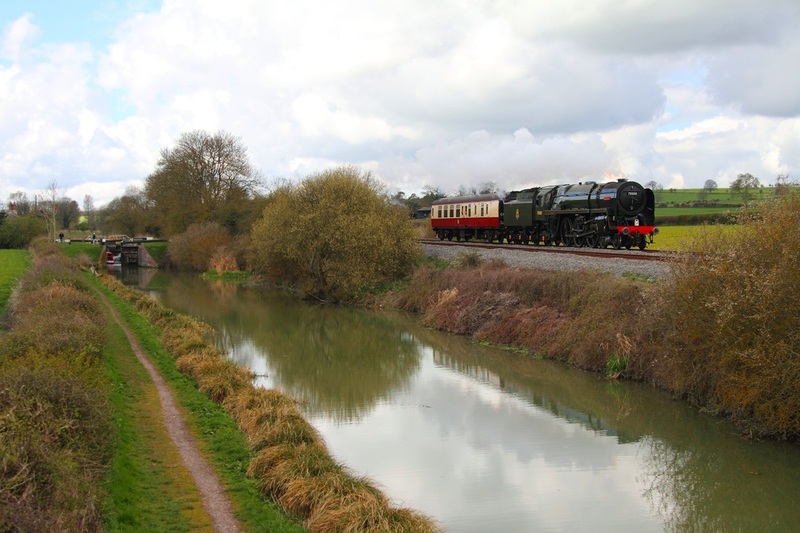 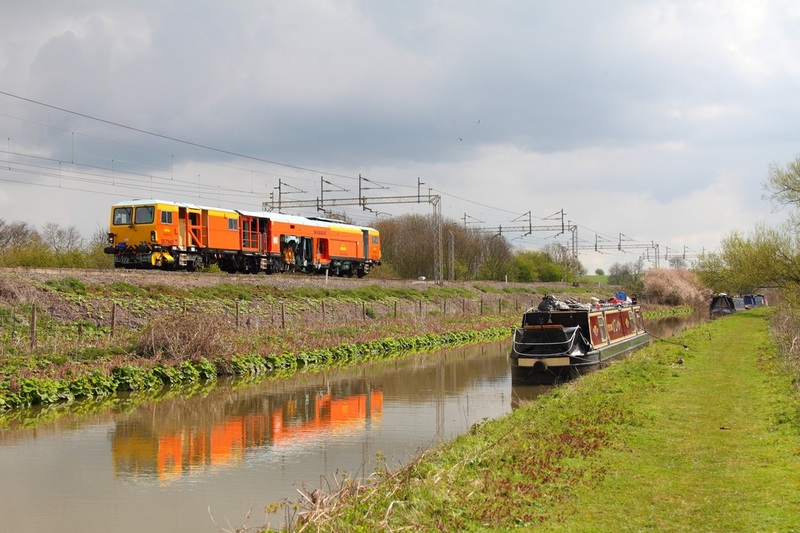 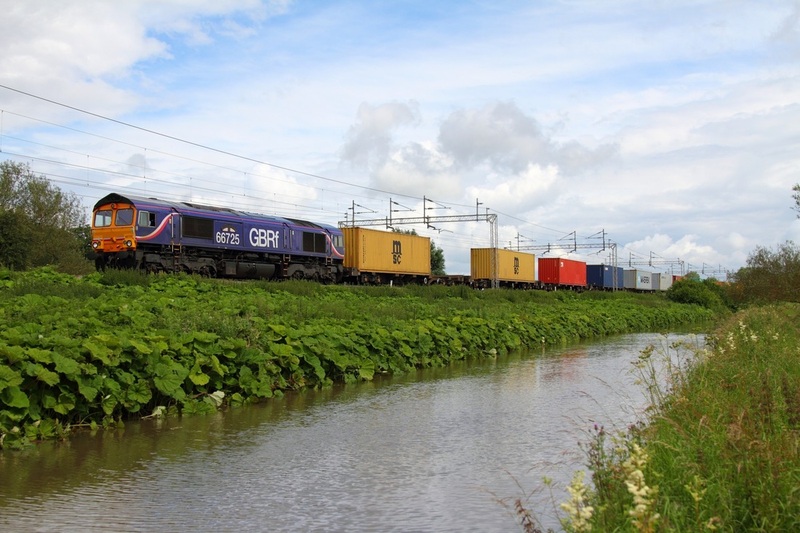 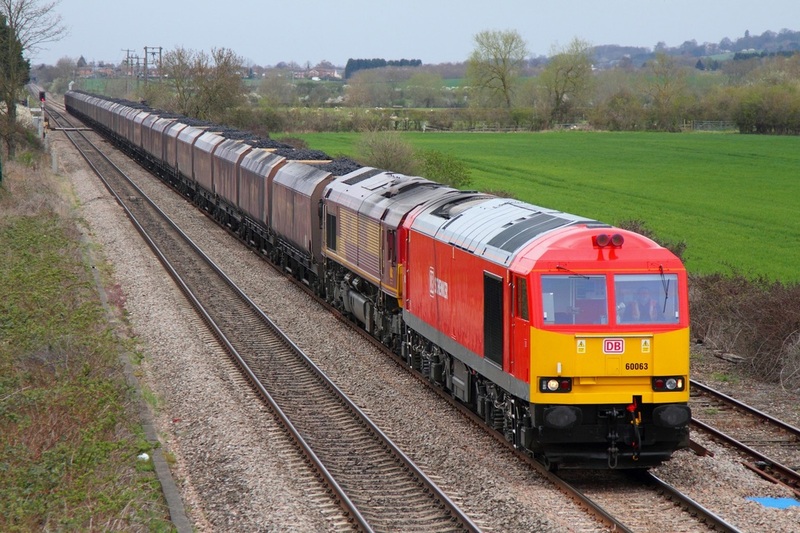 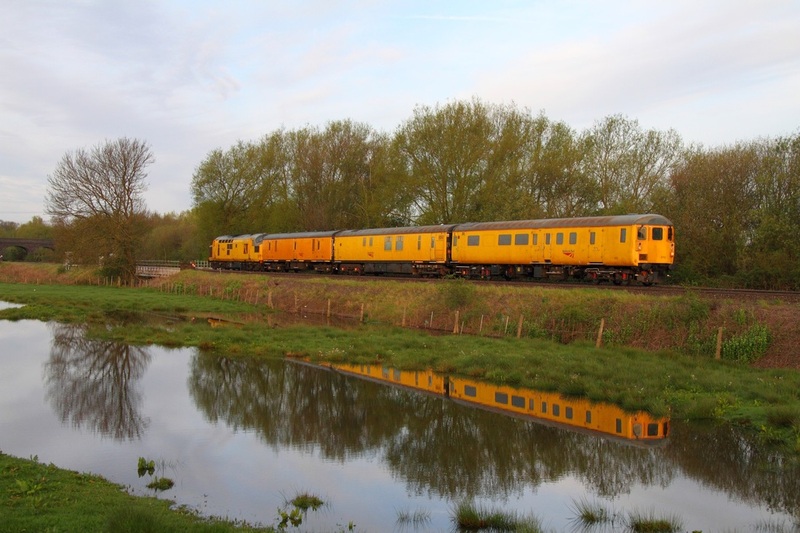 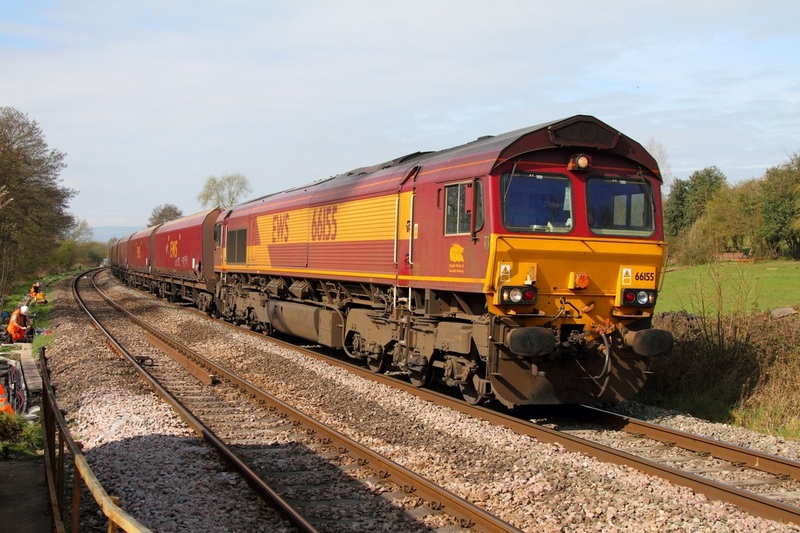 Prior to the ECS move, I photographed Colas Rail DR73942 heading north towards Nuneaton at Ansty adjacent to the picturesque Oxford Canal on the 20th April 2012. On the 20th April 2012. 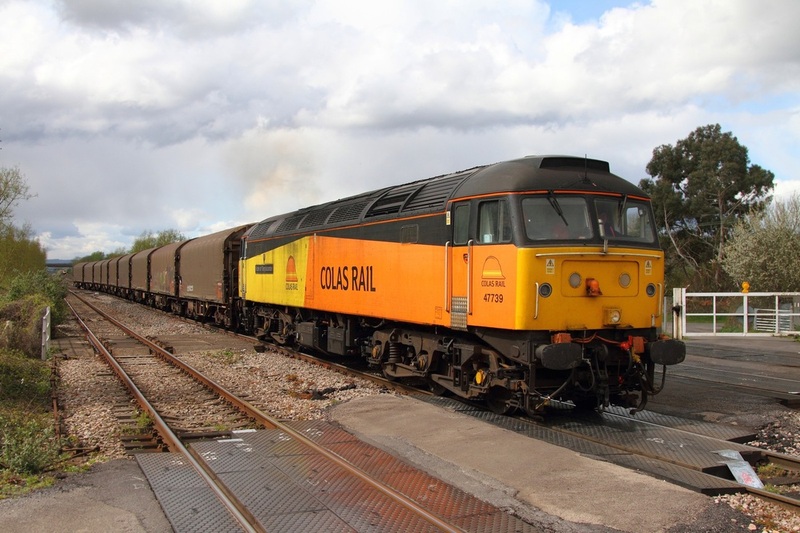 Colas Rail 66847 went light engine as the 0Z47 Washwood Heath to Crewe DMD to pick up DB stored locomotives - 56051, 56065, 56078 and 56049 which all still carry faded Fertis livery. 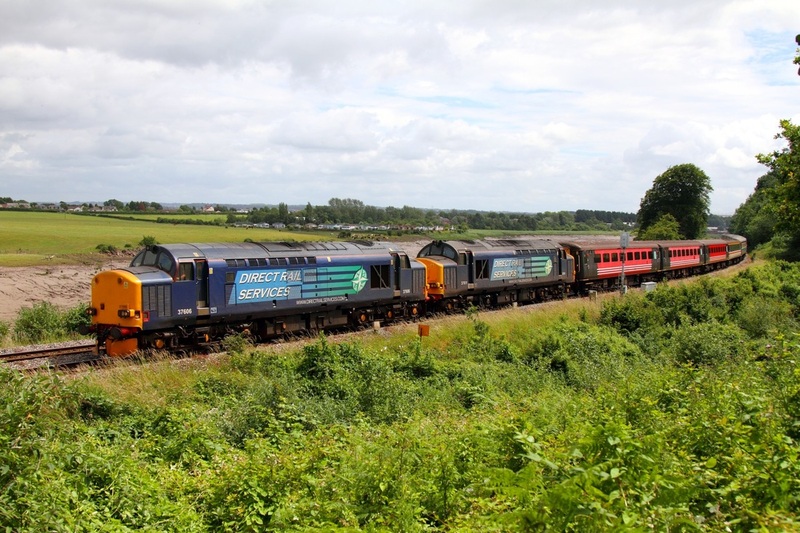 The colourful combination is illustrated here at Dunston south of Stafford with 66847 leading Four Grids as the 0Z56 09:33 Crewe to Kingsbury. 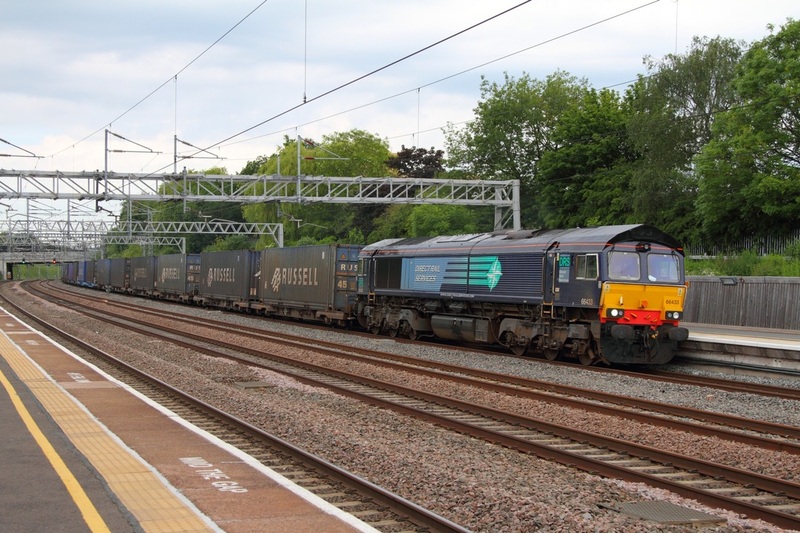 56065 and 56051 would then be taken forward by 66847 to Burton Nemesis Rail as the 0Z57 whilst 56078 and 56049 would be dumped at Kingsbury. 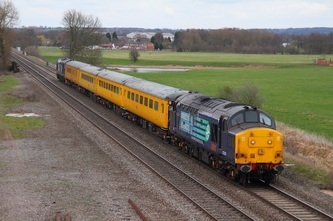 Br Large Logo Blue liveried 47580 leads WCRC 57601 on the 1Z42 06:17 Lancaster to Penzance Statesman railtour at Dunston south of Stafford on the 20th April 2012. 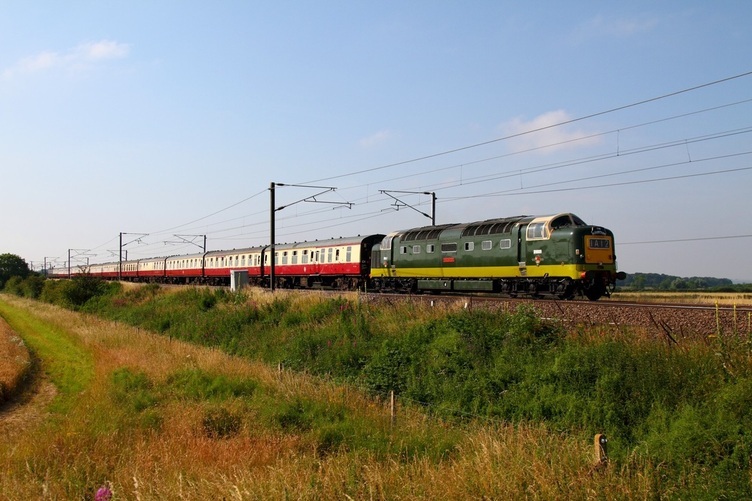 On the 20th April 2012, Two-Ex Celebrity '47s' in their final days of Virgin both now sporting the WCRC house colours, 47851 (ex-Br Two Tone Green) led 47826 (ex-Inter City) top-and-tailed on the 1Z91 06:27 Kidderminster to Carlisle via the Settle and Carlisle Compass railtours. 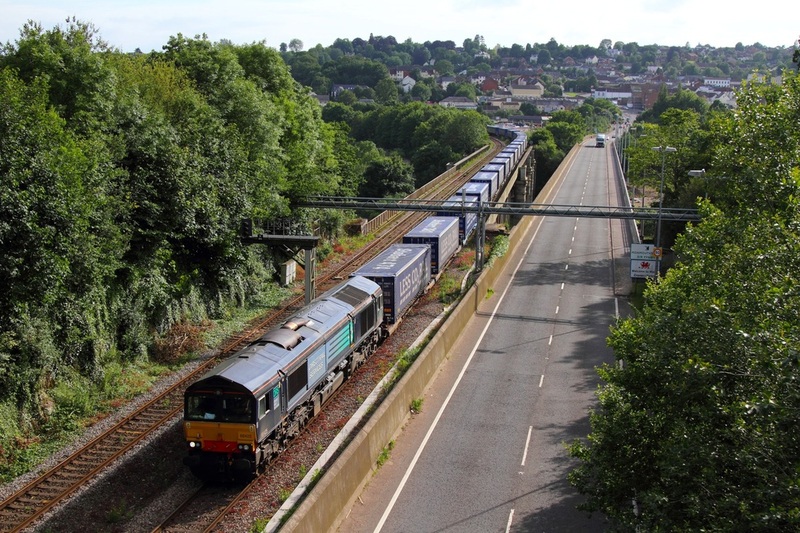 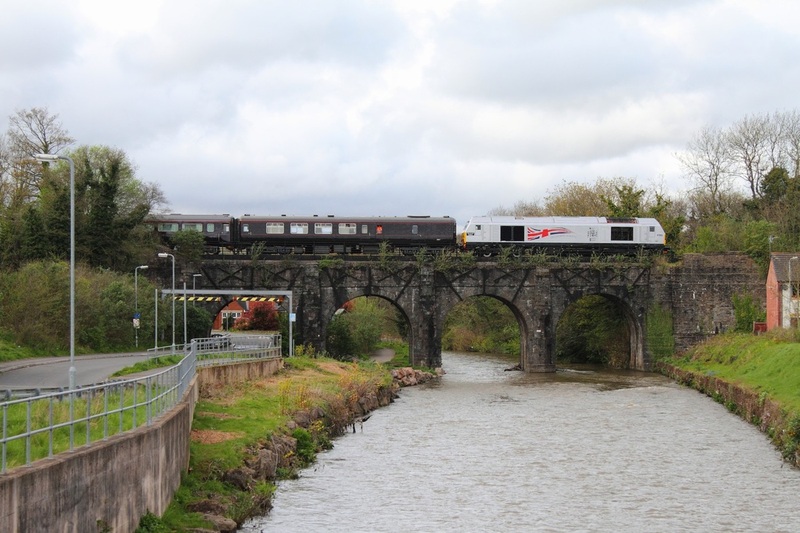 The train was delayed due to a signal failure resulting in the ECS movement from Worcester leaving over 90 minutes late which ultimately led to the train departing Kidderminster just over an hour late, I photographed the tour flying through Norton Bridge. 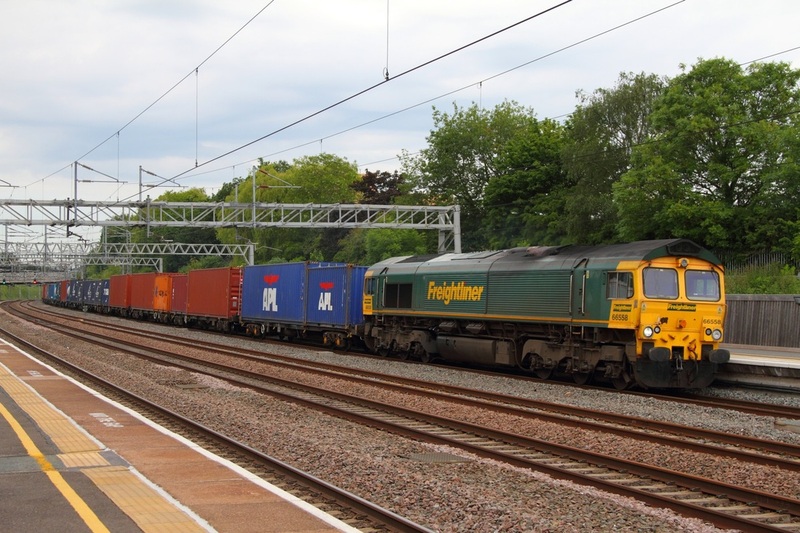 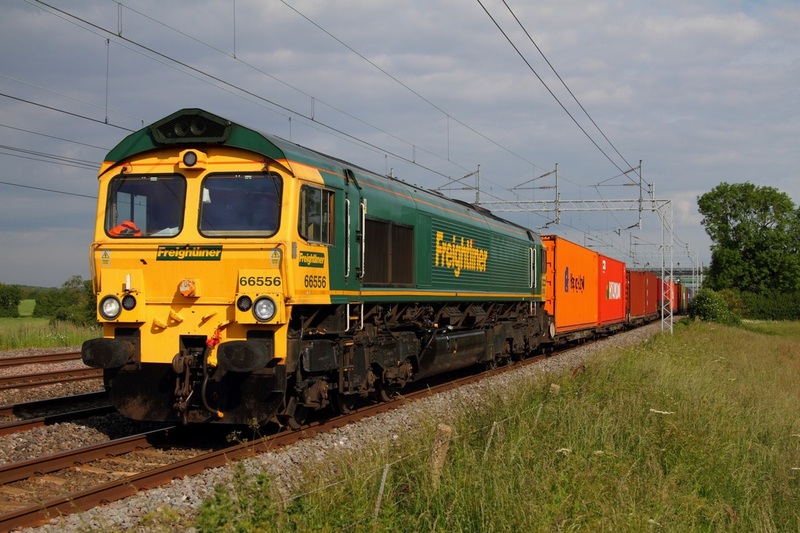 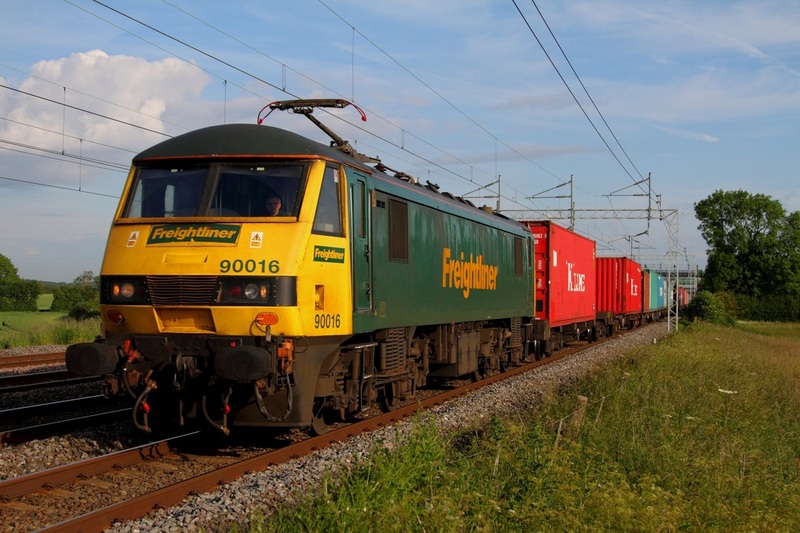 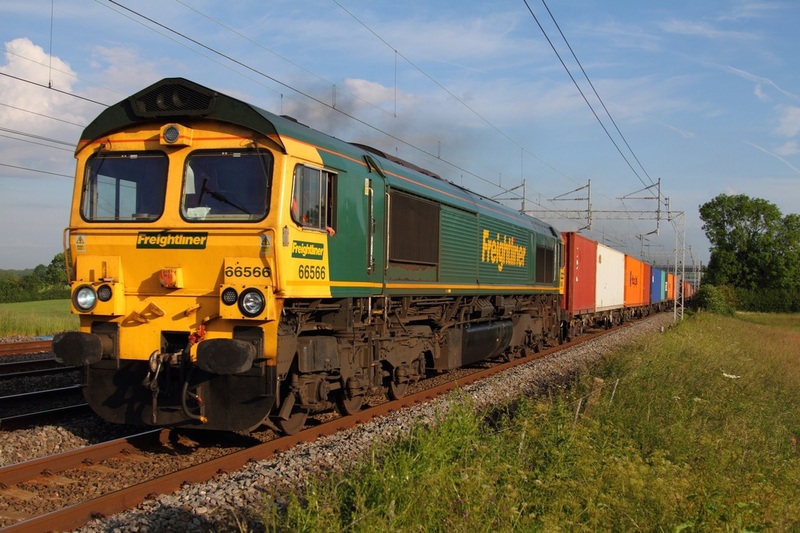 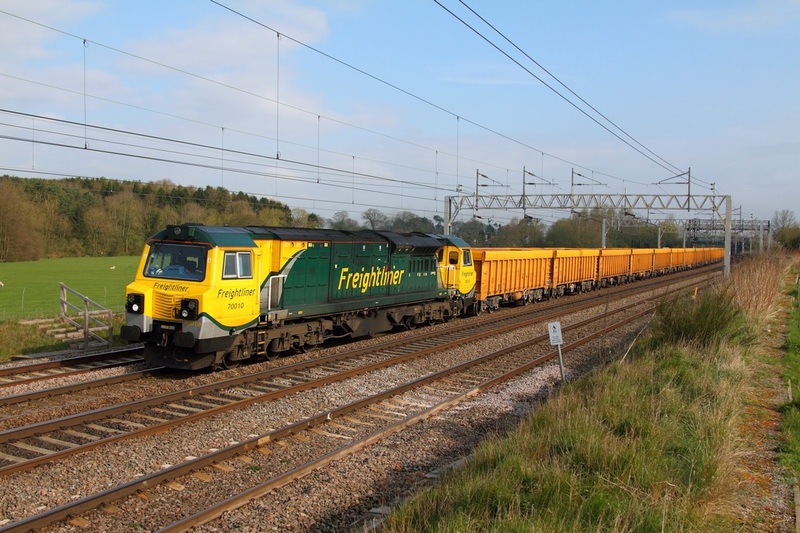 On the 20th April 2012, Freightliner's 70010 powering the 6U76 Crewe Basford Hall to Mountsorrel Network Rail Yellow ballast boxes at Norton Bridge. 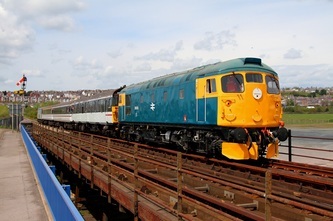 On the 20th April 2012. DB Schenker branded Silver 67029 powering the DB Management train with DVT 82146 trailing at Marston Green nearing Birmingham International with the 5Z05 07:45 Bescot to Birmingham International. 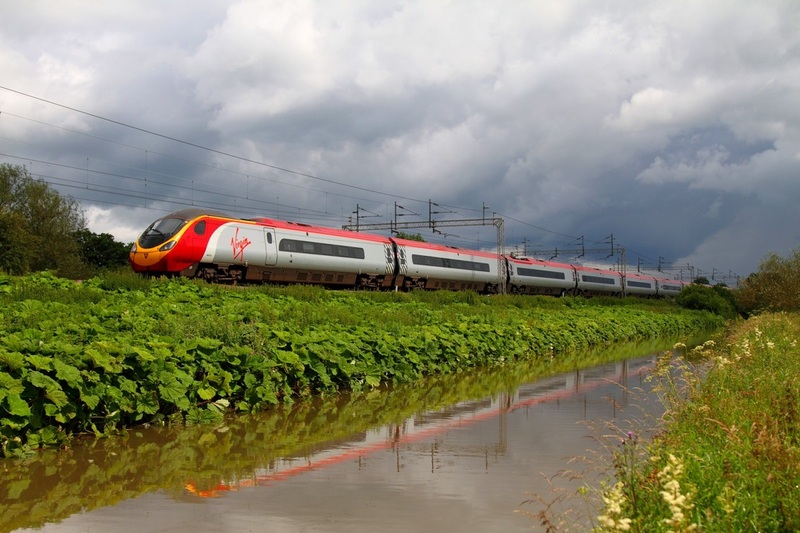 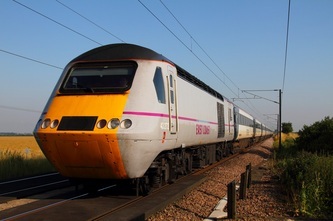 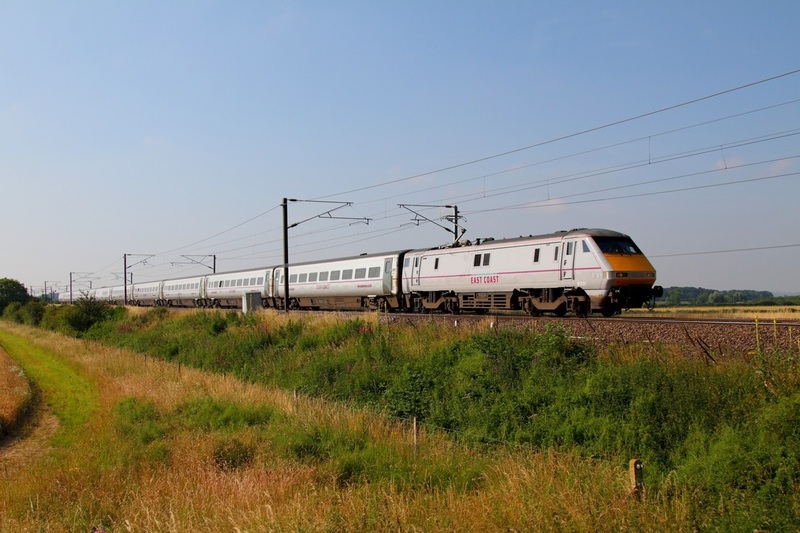 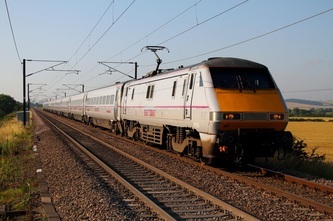 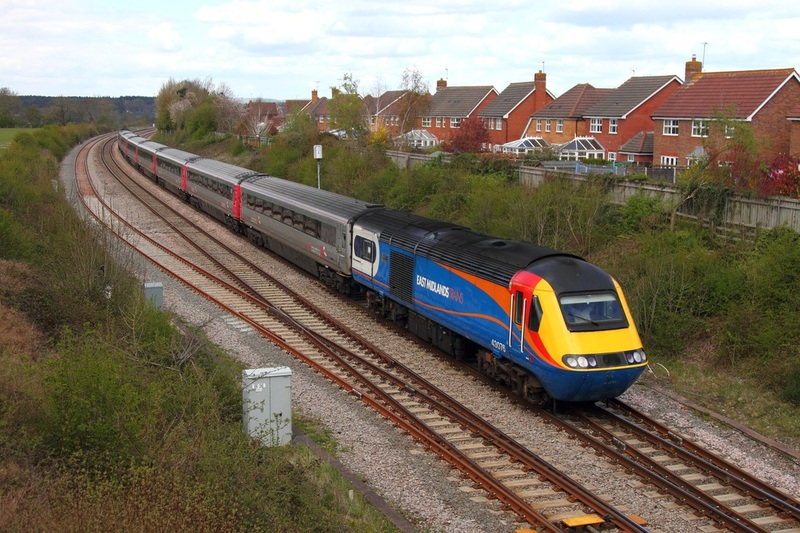 The unique train would then visit Dagenham and London Paddington before returning to Toton. 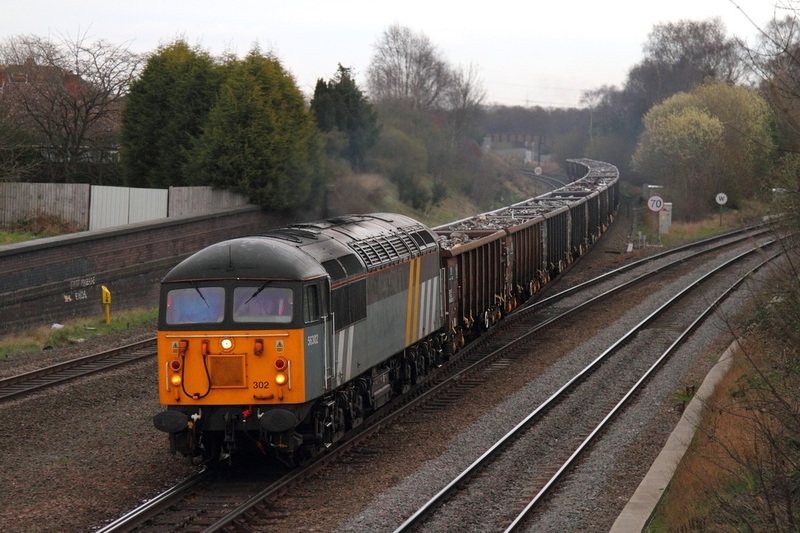 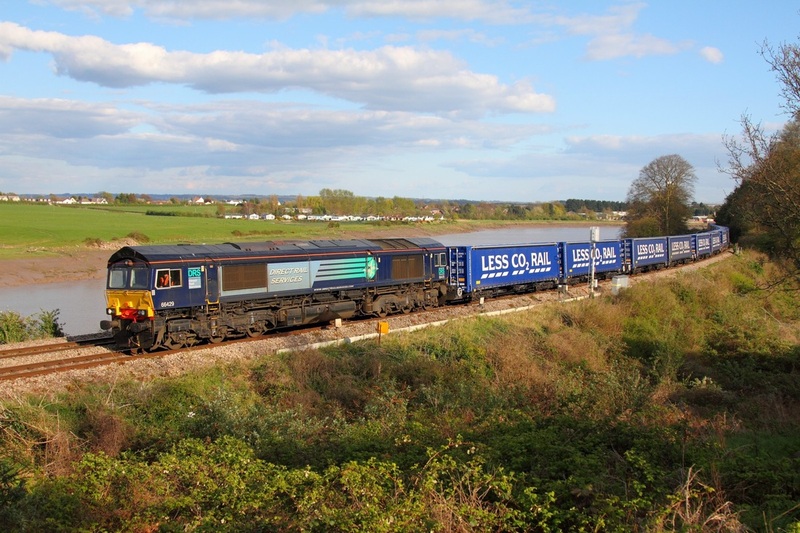 On the 15th April 2012, DRS 66429 leads the 4M36 Wentloog to Daventry Tesco Express at Thornwell. 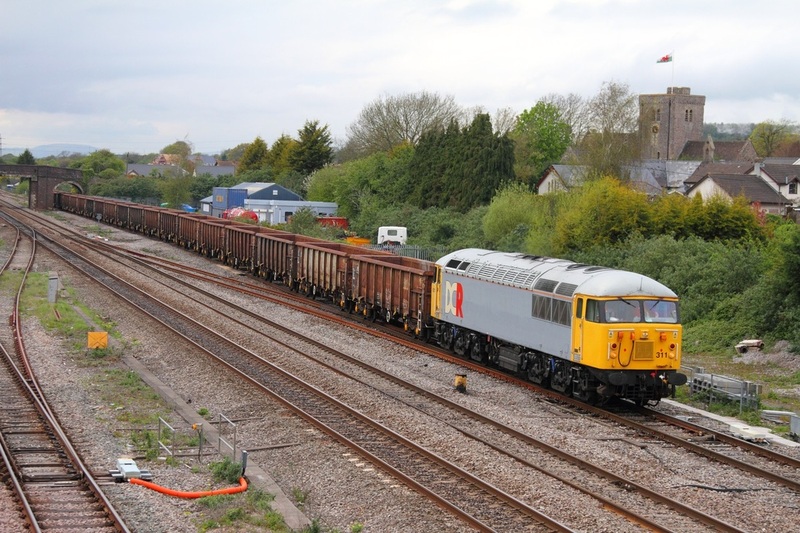 70000 'Britannia' creeps through Crofton powering the 5Z31 Bishops Lydeard to Southall Support coach move on the 11th April 2012. 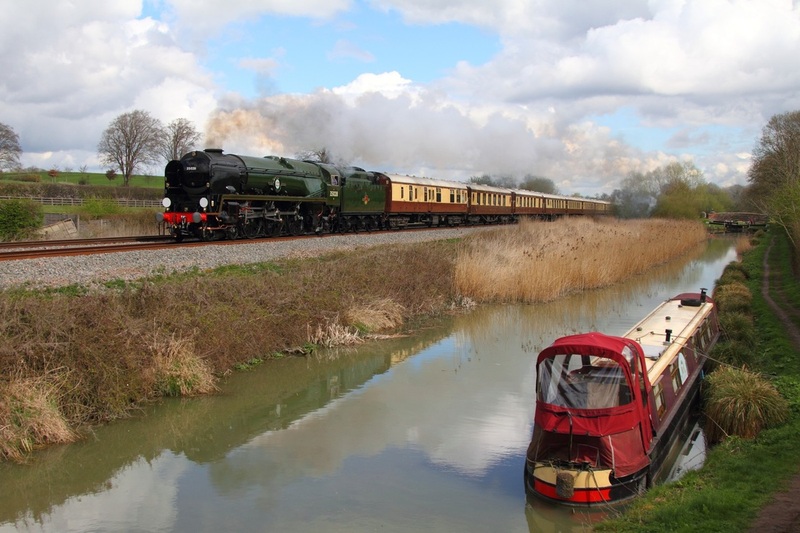 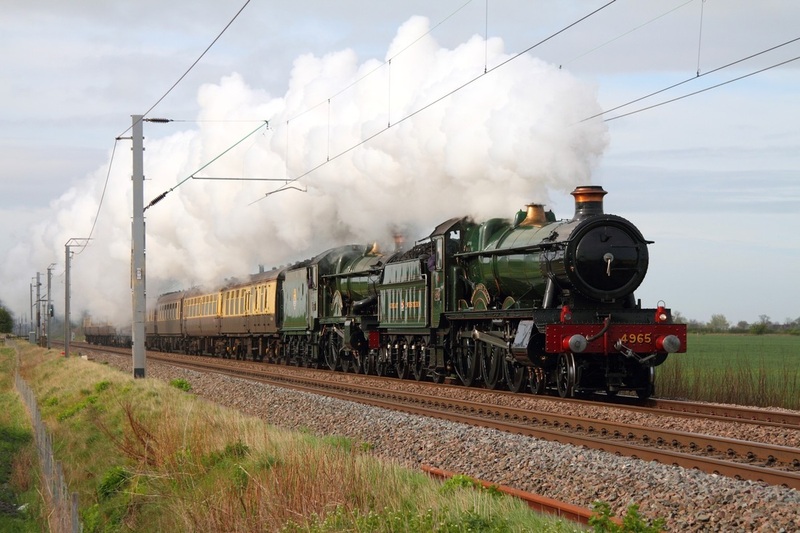 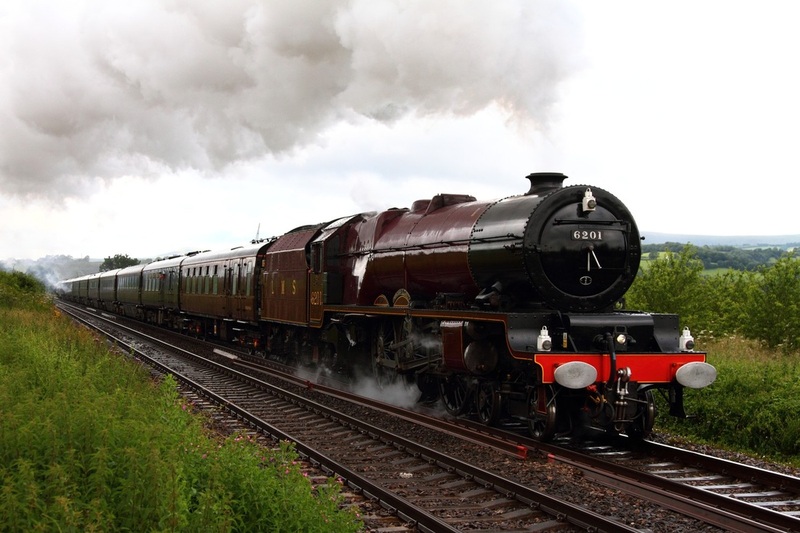 The steam loco will work tomorrows Cathedral Express from London Victoria to Bristol Temple Meads tomorrow. 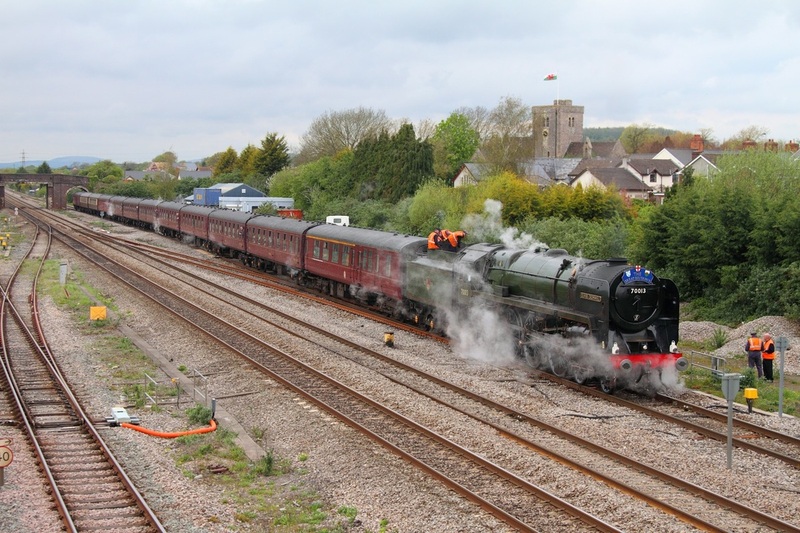 35028 Clan Line glides through Crofton powering the 1Z95 London Victoria to Bristol Temple Meads VSon the 11th April 2012. 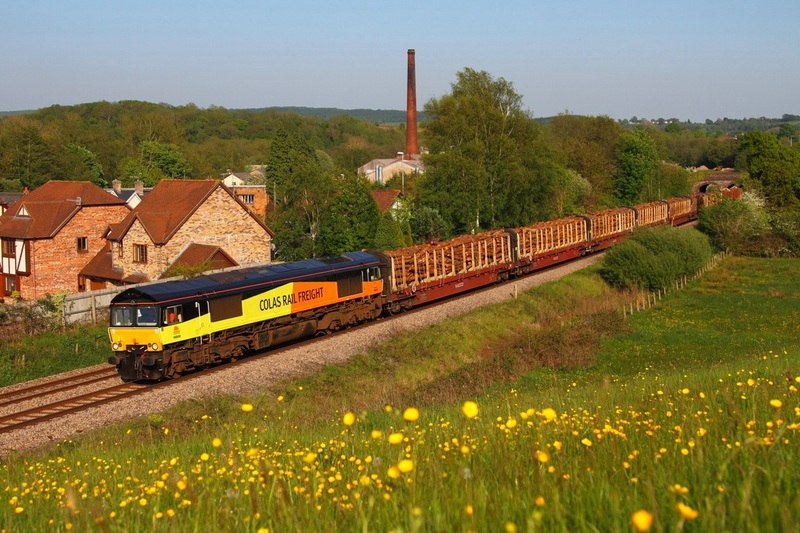 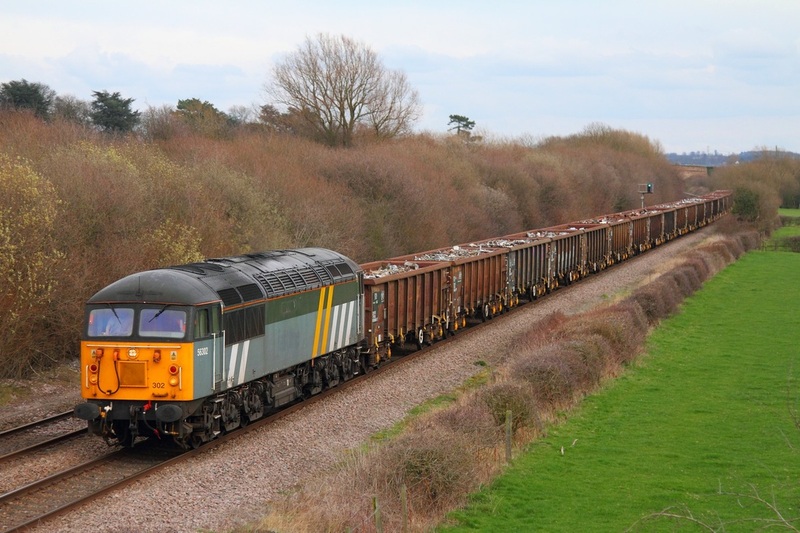 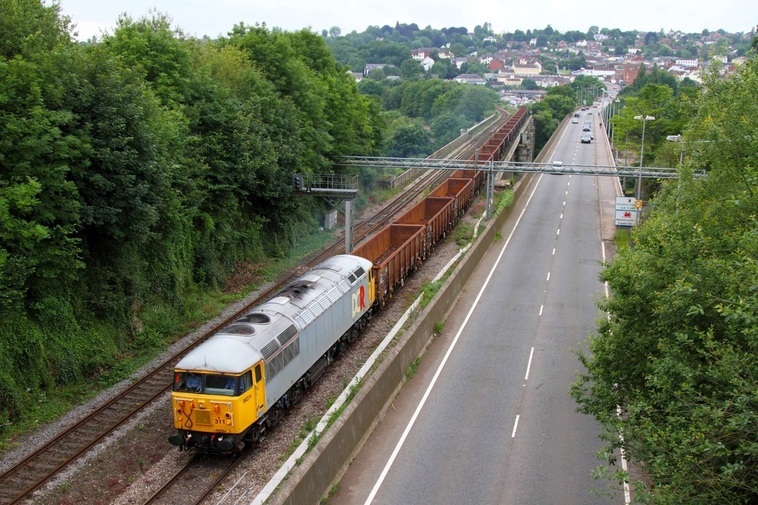 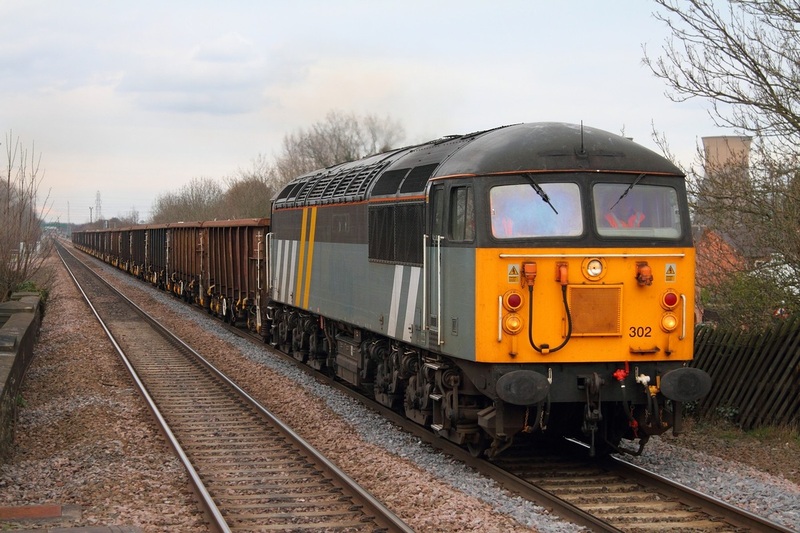 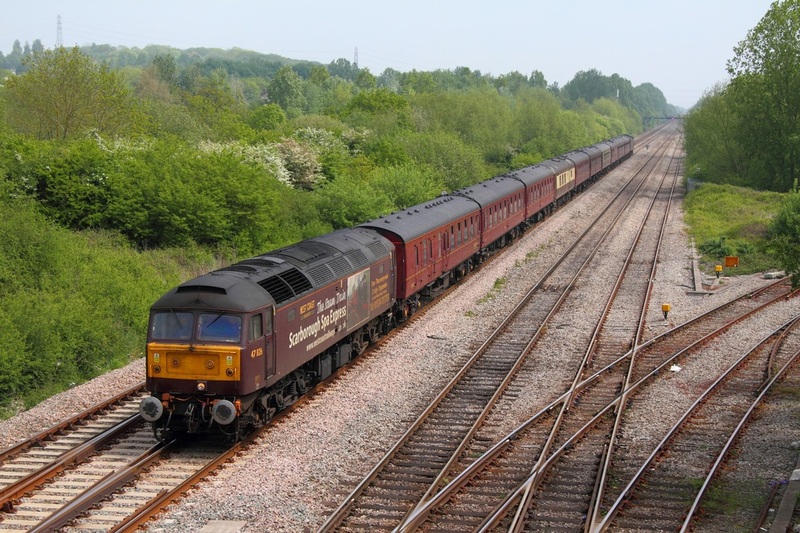 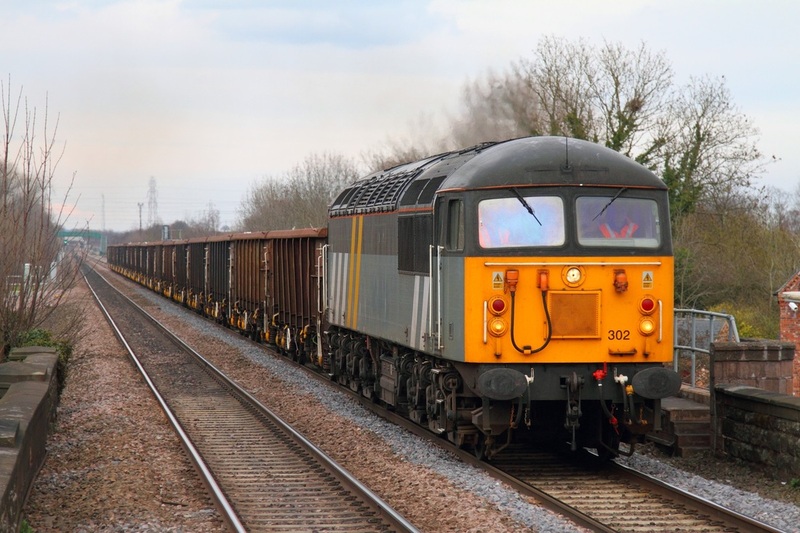 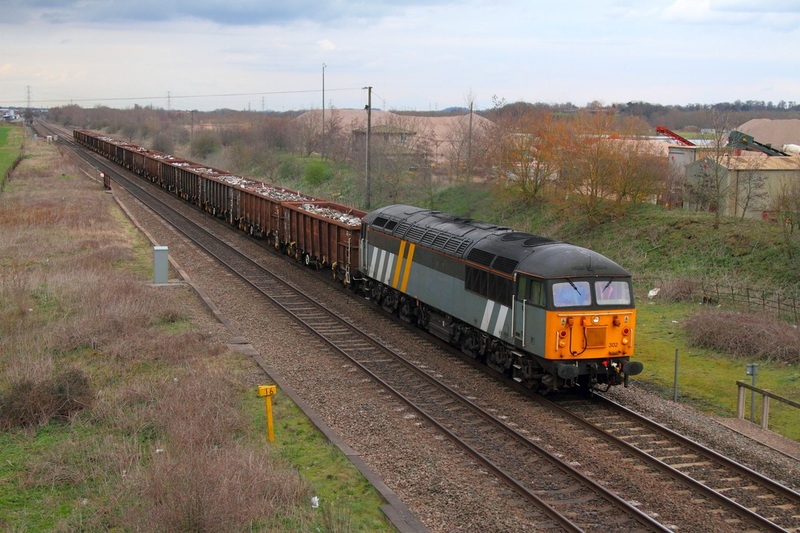 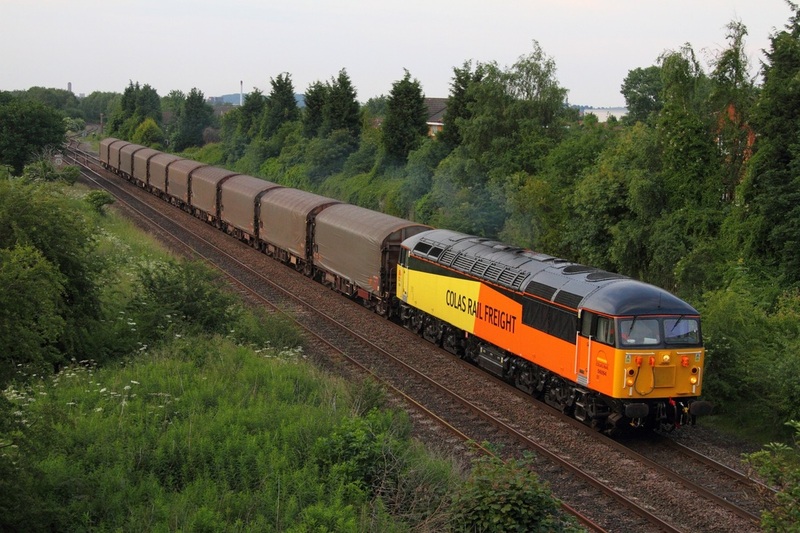 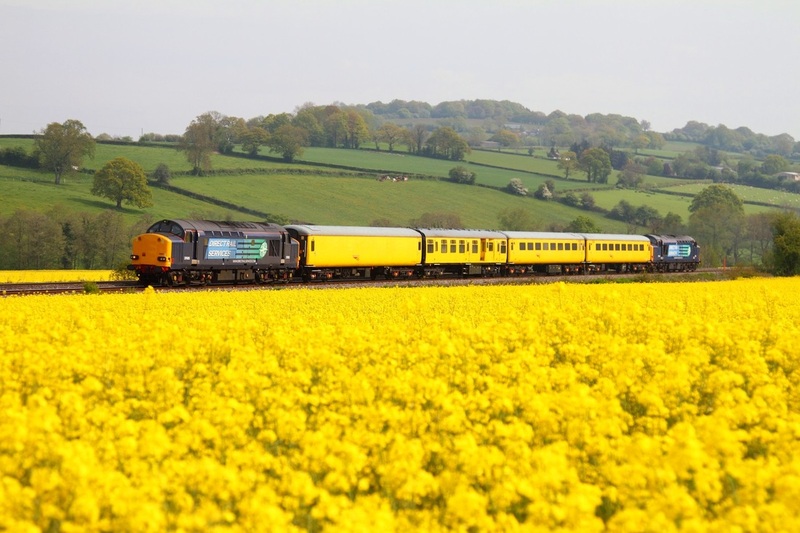 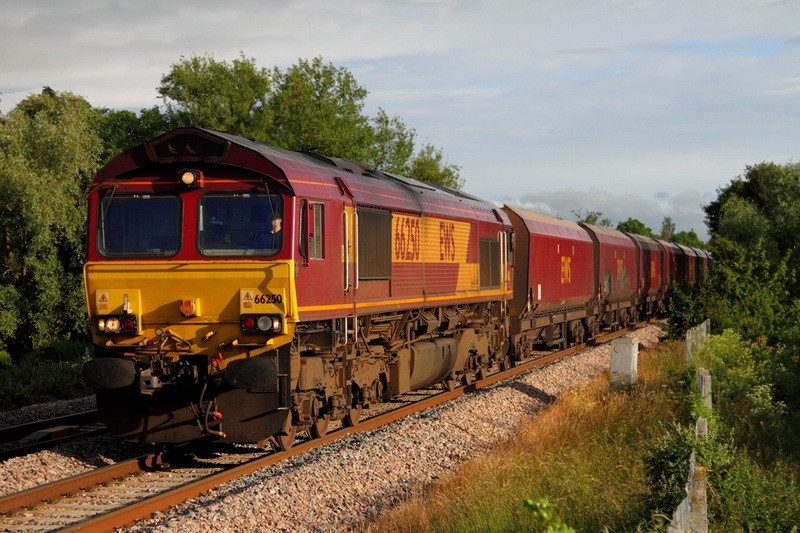 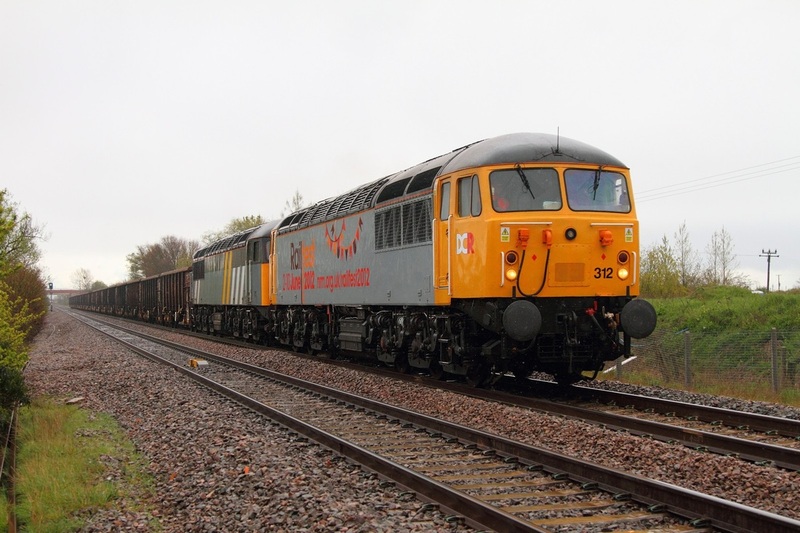 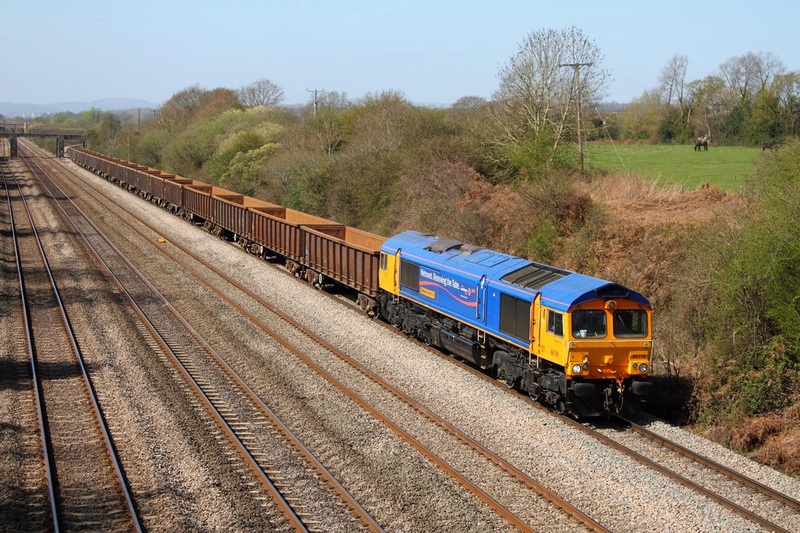 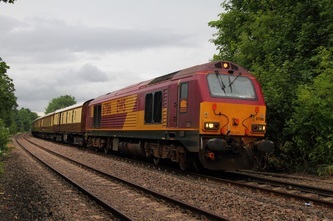 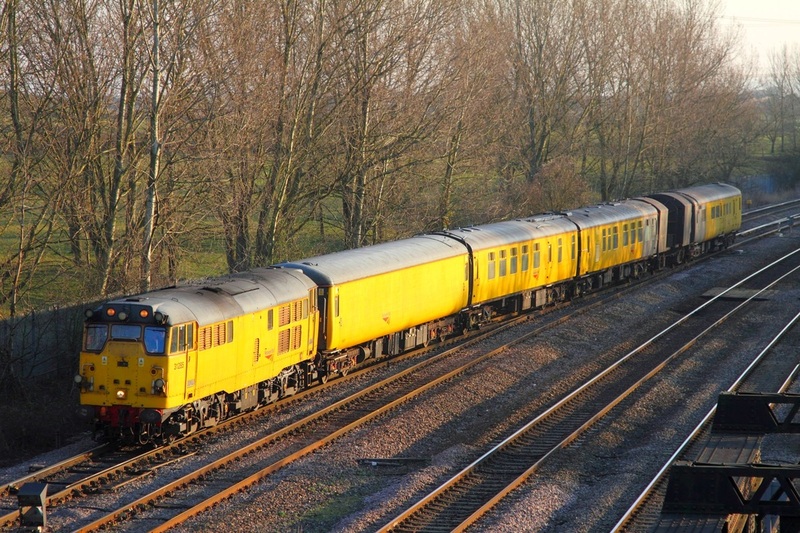 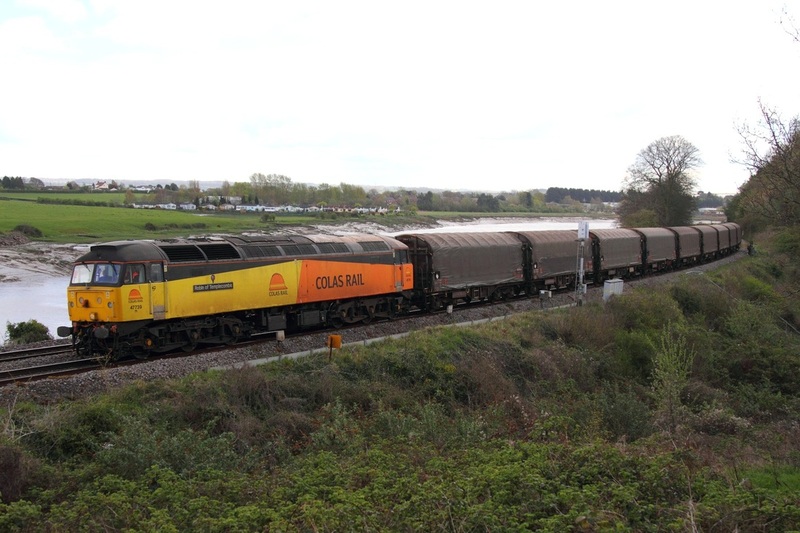 On the 11th April 2012, Colas Rail's 47739 Robin of Templecombe went light engine as the 0Z47 ex-Washwood Heath to Llanwern exchange sidings to pick up nine covered steel wagons. 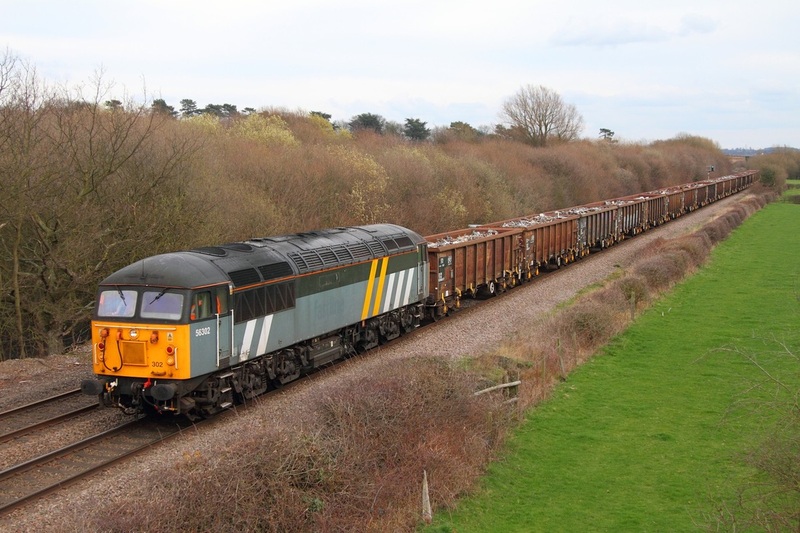 I photographed 47739 departing Llanwern at Bishton hauling the 6Z47 14:14 Llanwern to Washwood Heath. 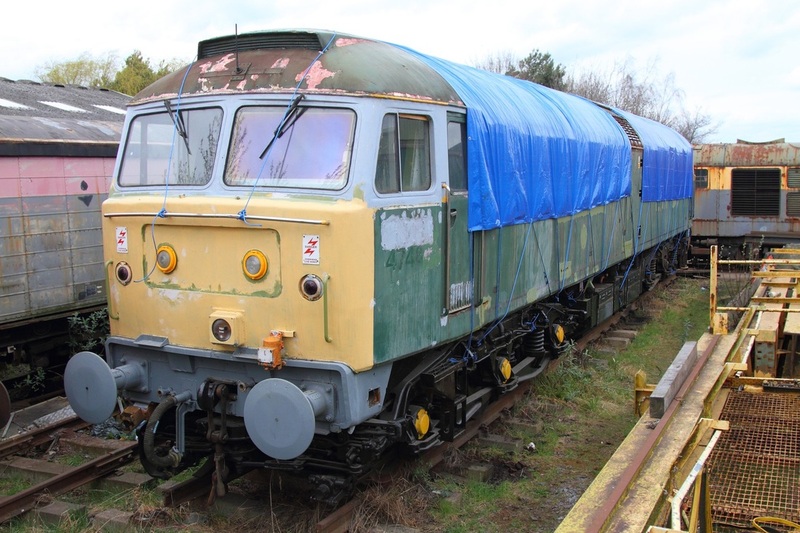 The Brush type 4 will take the wagons tomorrow to Long Marston for storage. 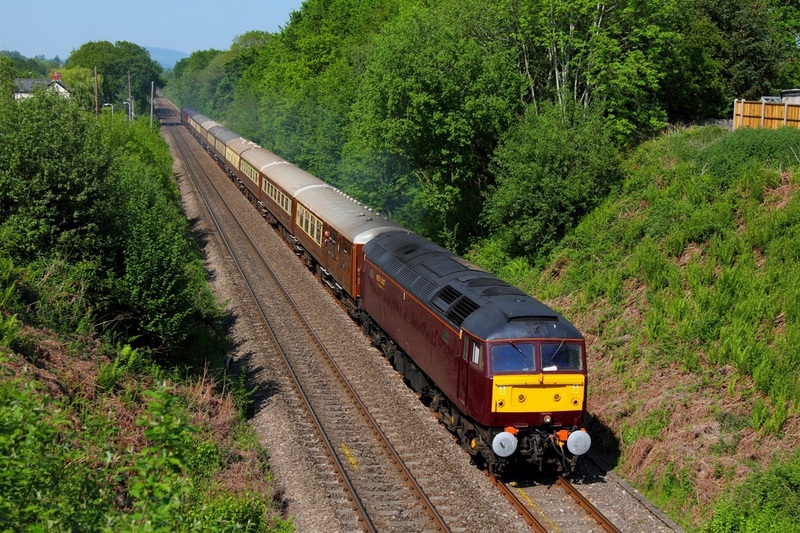 I also photographed the nostalgic consist at Thornwell near Chepstow. 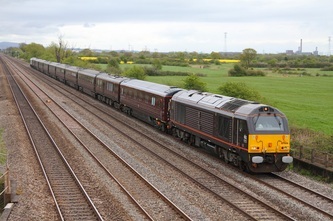 Europorte GBRf liveried 66733 leads GBRf liveried 66701 hauling the 4V94 Doncaster to Portbury Biomass train at Charfield on the 6th April 2012. DRS 66424 powers the 4V38 Daventry to Wentloog LESS CO2 Tesco Express at Thormwell on the 6th April 2012. 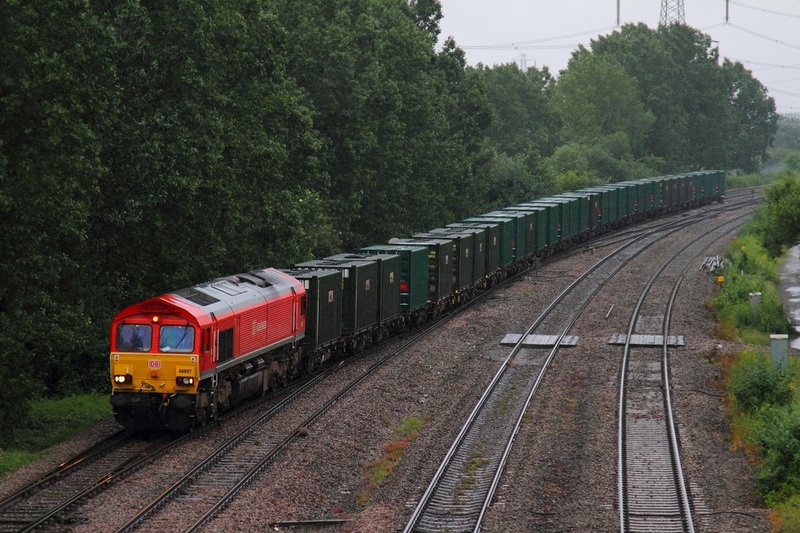 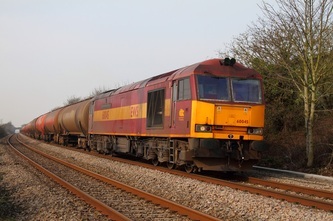 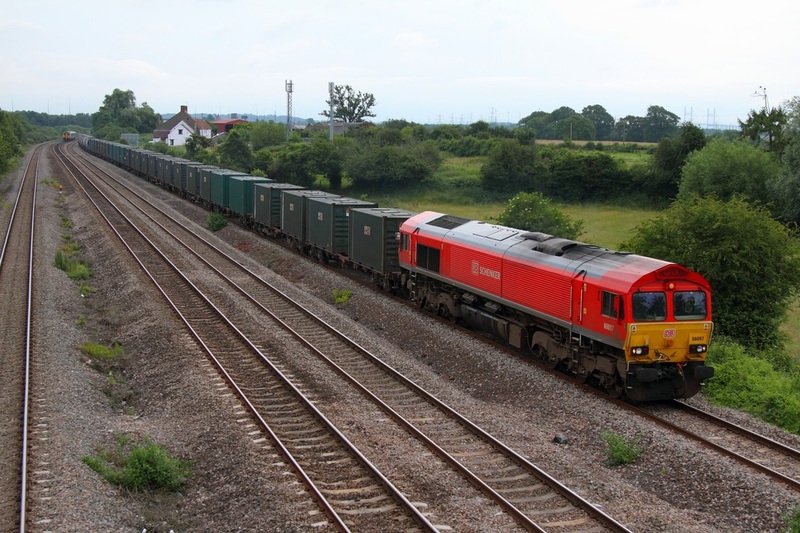 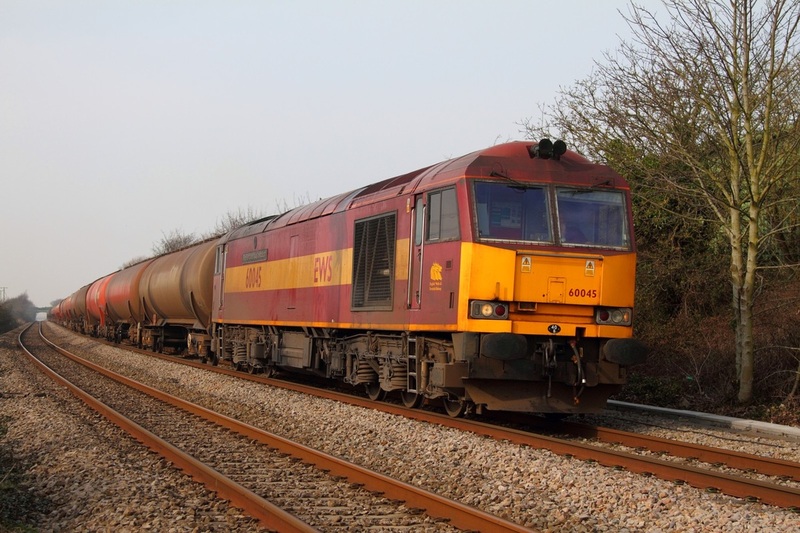 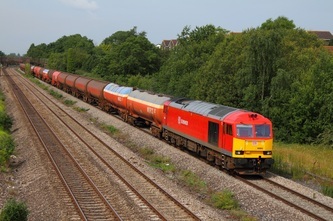 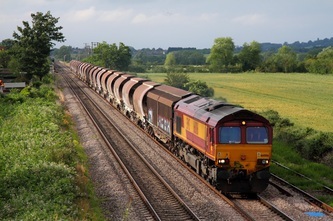 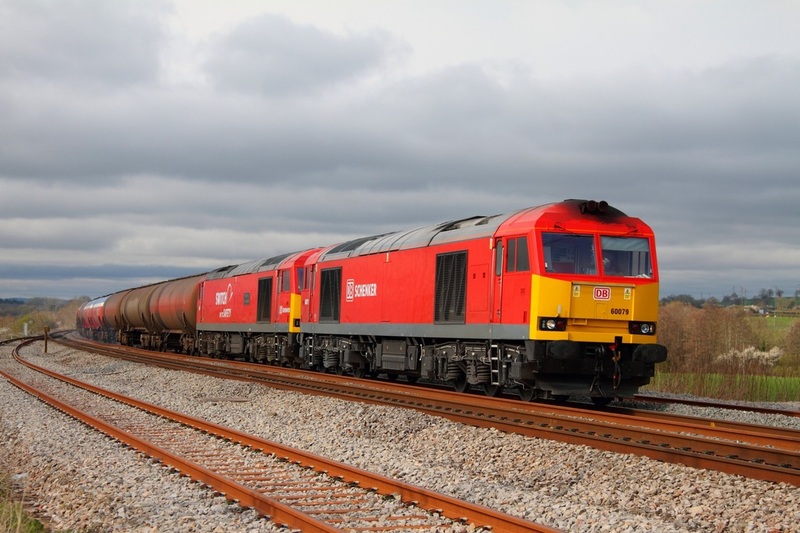 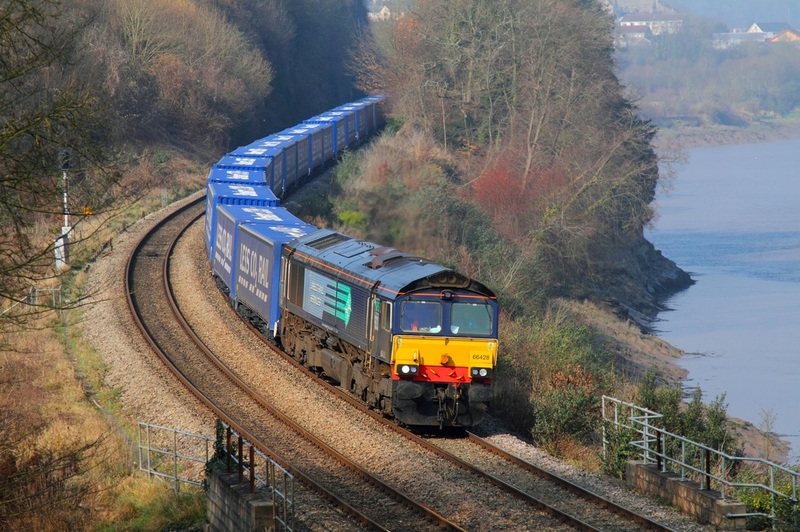 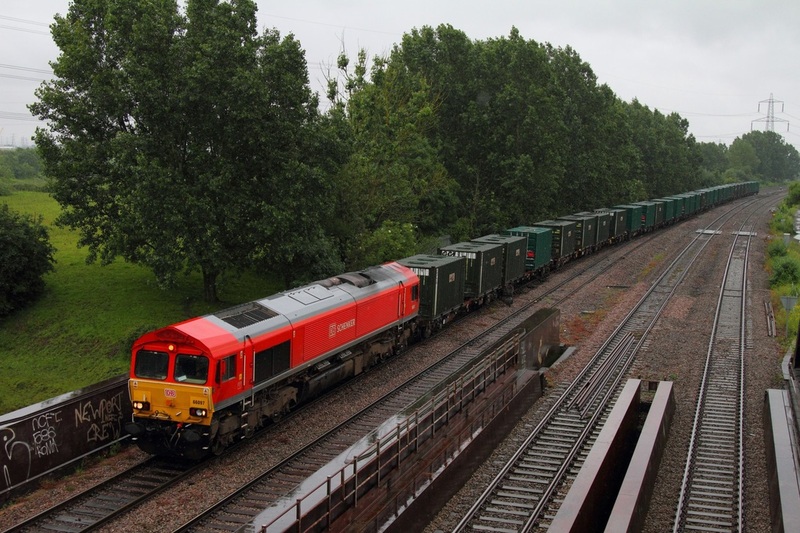 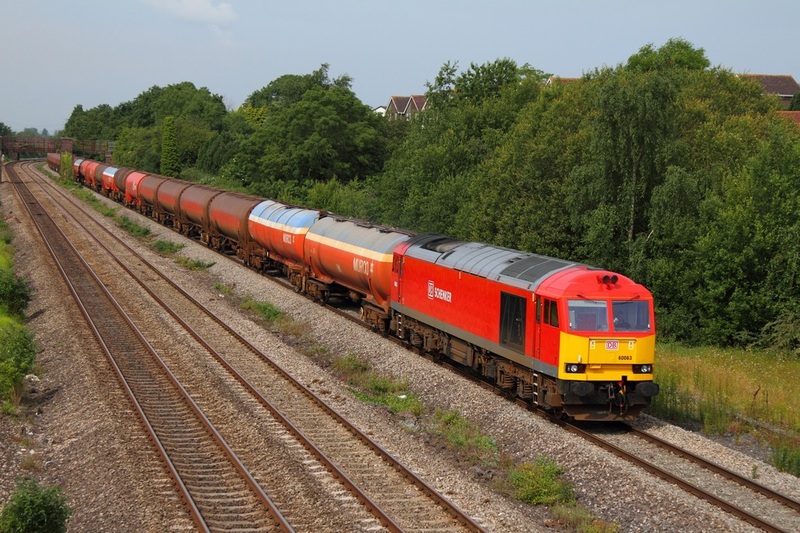 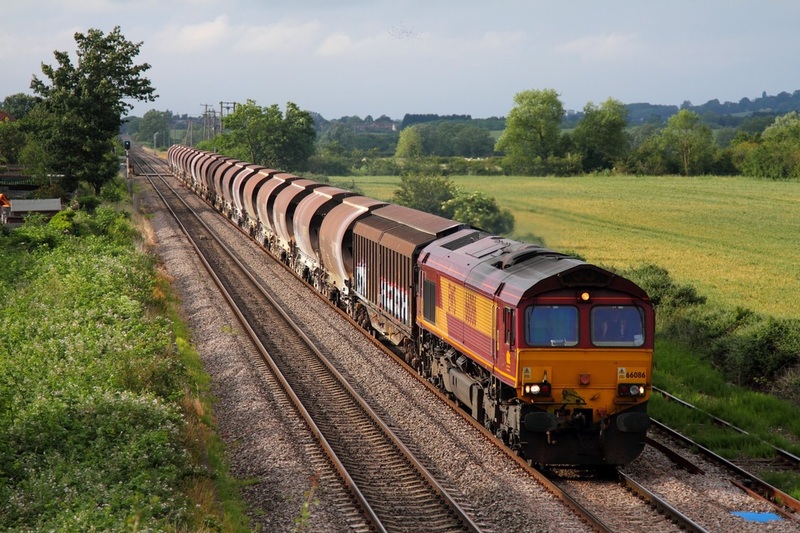 On the 6th April 2012, DB Schenker's EWS 66155 powers the 4E66 Margam to Redcar loaded coke at Naas Crossing, Lydney. 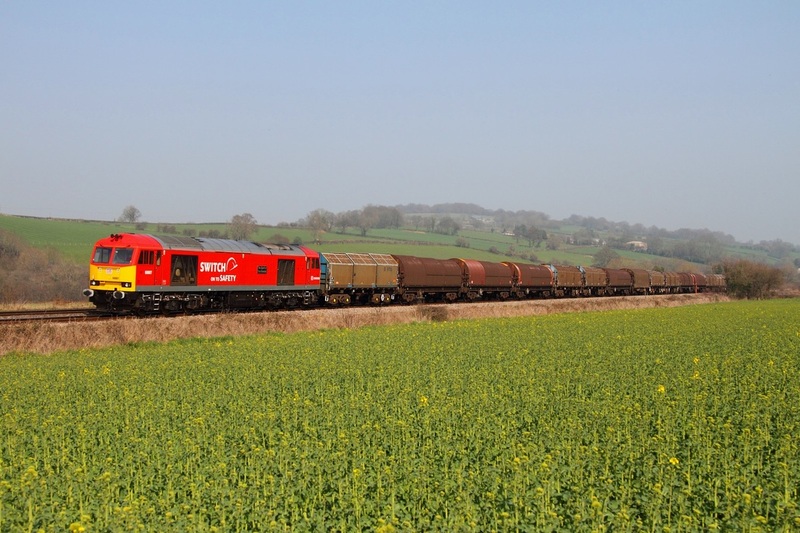 DB Schenker's 60079 rounds the curve at Gatcombe powering the 6B13 Robeston to Westerleigh loaded murco bogie tanks on the 6th April 2012. 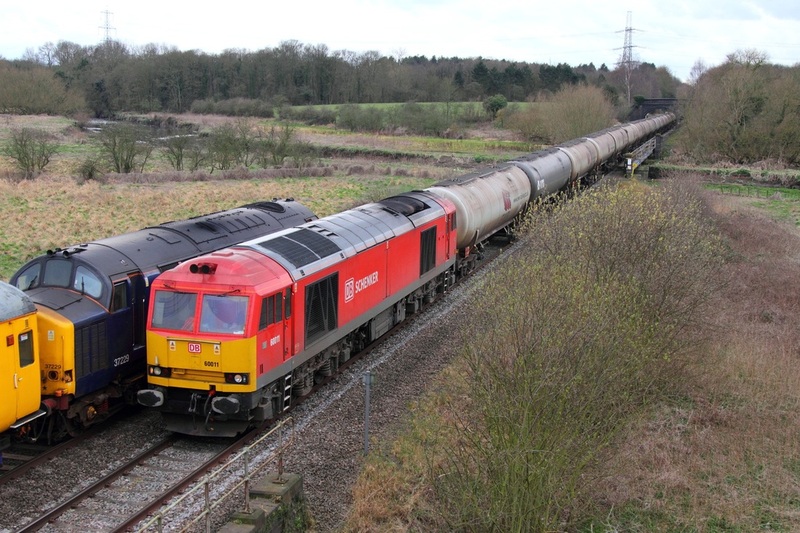 On the 4th April 2012, DB Schenker's 60063 made a rare appearance on the 6V67 Redcar to Margam loaded Coke due to the failure of 66086 which had failed near Broadholme, Derby whilst working the train. 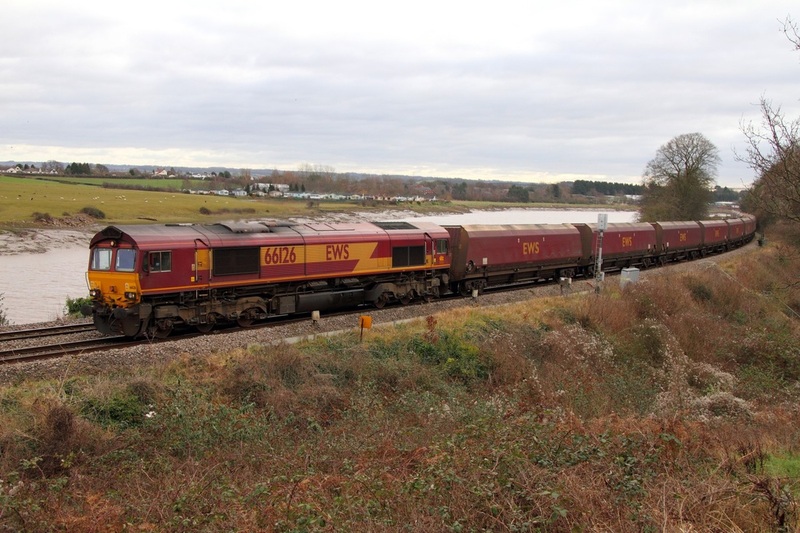 60063 was sent to rescue the train and led the shed dead in train and the consist all the way to South Wales. The eye-catching consist is photographed at Duffryn near Newport. 60079 was sent as the 1Z99 Llanwern to Gloucester to rescue failed 60007 which was typically hauling the 6B13 Robeston to Westerleigh loaded murco bogie tanks. 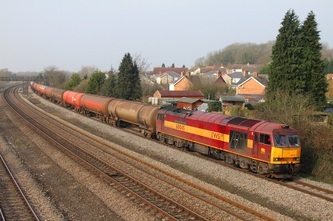 The Tug had been experiencing power problems since Pontyclun and eventually failed with a loss of power at Gloucester. 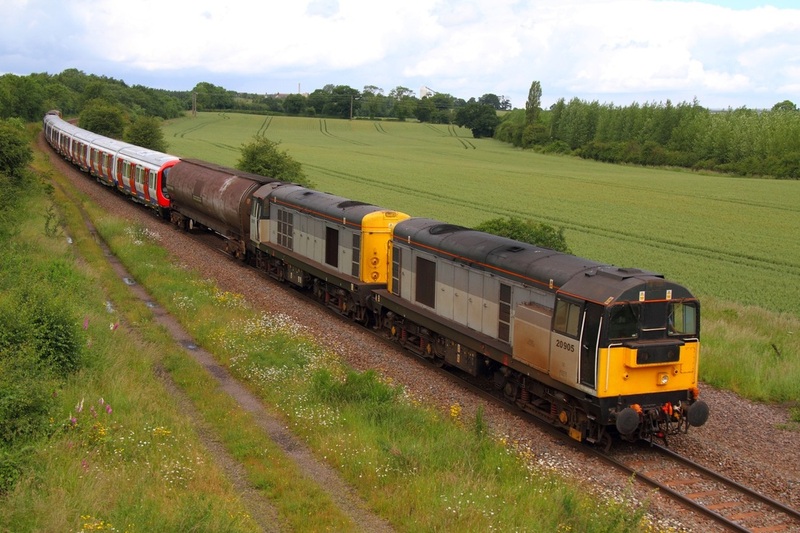 I photographed the double-headed '60s' at Charfield with 60079 leading 60007 and running about 213minutes late. 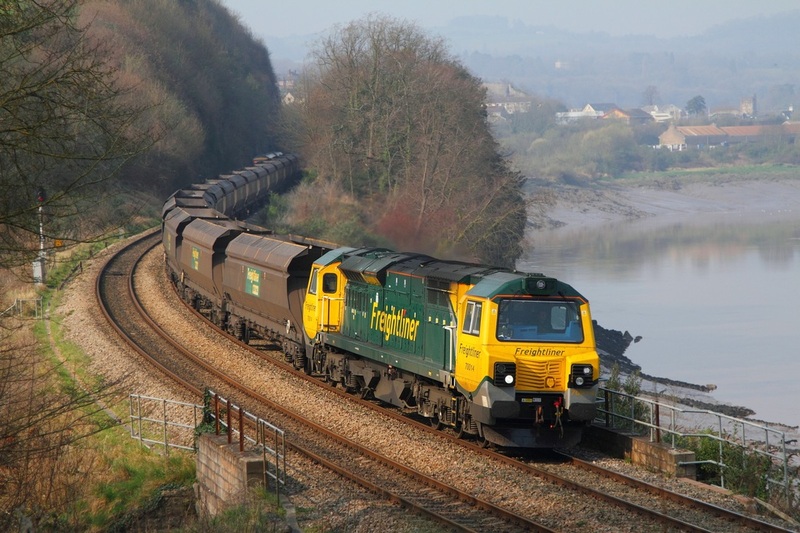 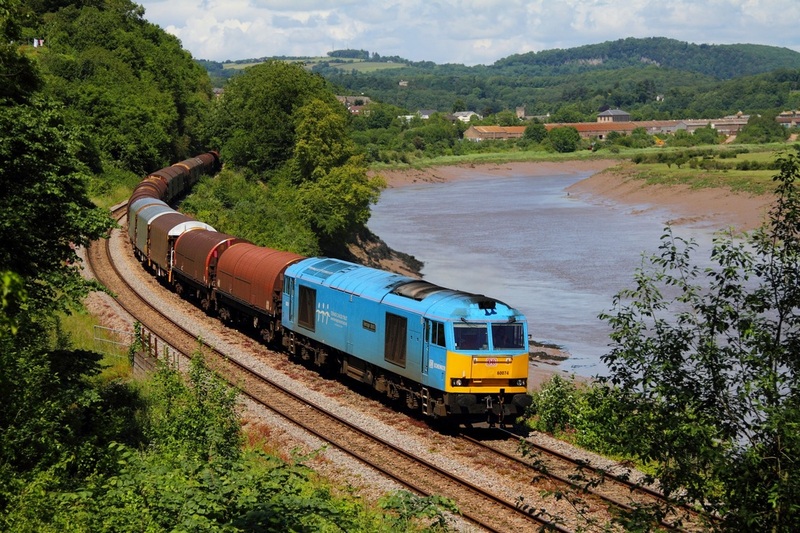 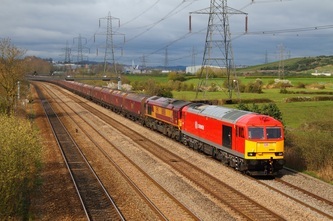 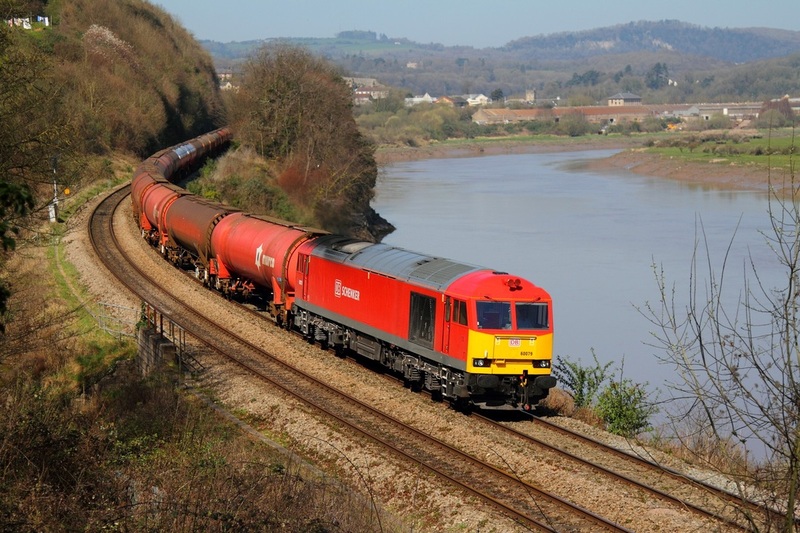 On the 2nd April 2012, DRS 66433 leads the 4Z38 Daventry to Wentloog off the M48 Severn Bridge near Chepstow. 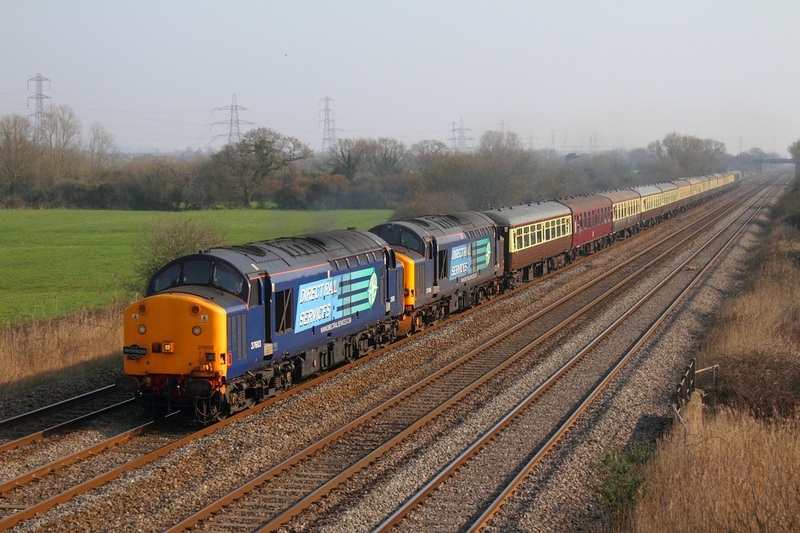 A fatality in the rugby area led to the cancellation of the 4V38 and the creation of the later timed 4Z38. 66431 was originally working the 4V38 but only got as far as Rugby before being dragged back to Daventry by another '66' due to the farce. 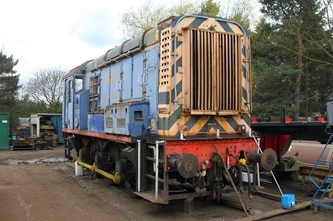 4Z38 was later worked by 66433. 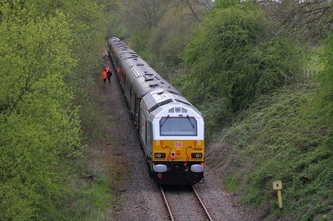 Due to the closure of the Lydney line, the Tesco Express was diverted via the Severn Tunnel to Wentloog and diverted via the marches on return on the 1st April 2012, although the train runs via the marches mondays-fridays anyways, the earlier sunday timings presented a golden opportunity to photograph the train on the marches route in daylight. 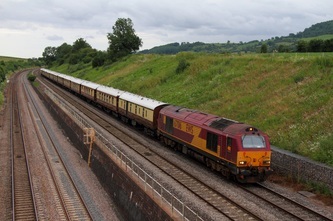 DRS' ex-fastline 66304 speeds through Ponthir powering the 4M36 Wentloog to Daventry Tesco Express. 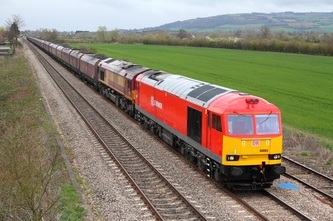 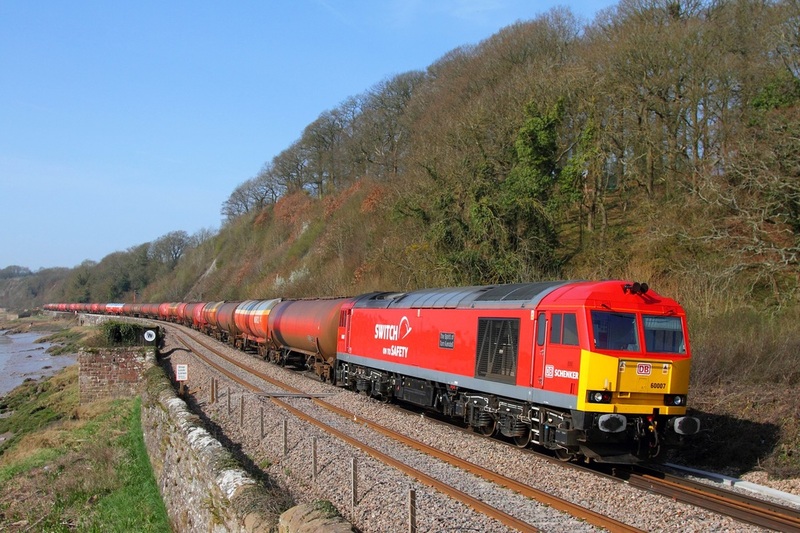 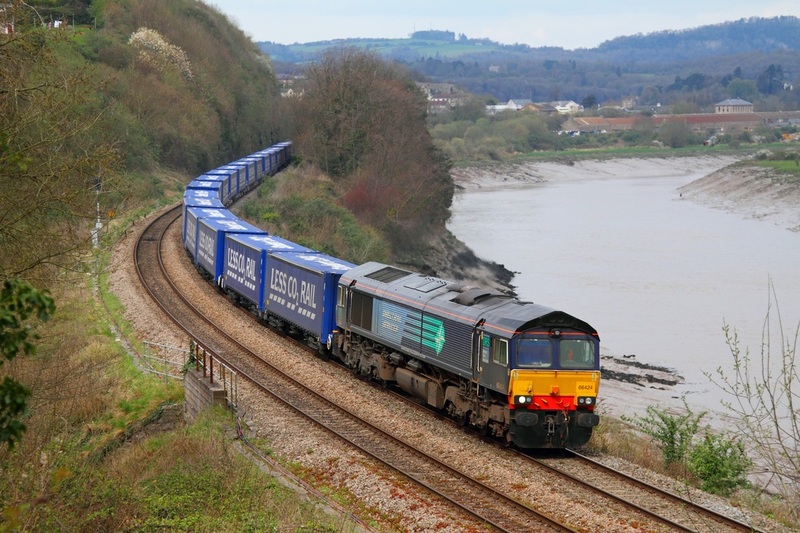 GBRF's Metronet liveried 66718 powers the 6Z33 Cardiff Tidal to Hexthorpe empty box wagons at Llandevenny on the 1st April 2012. 56312 carrying Railfest Advertisements powers the 6Z56 Cardiff Tidal to Shipley empty scrap wagons at Llandevenny on the 29th March 2012. 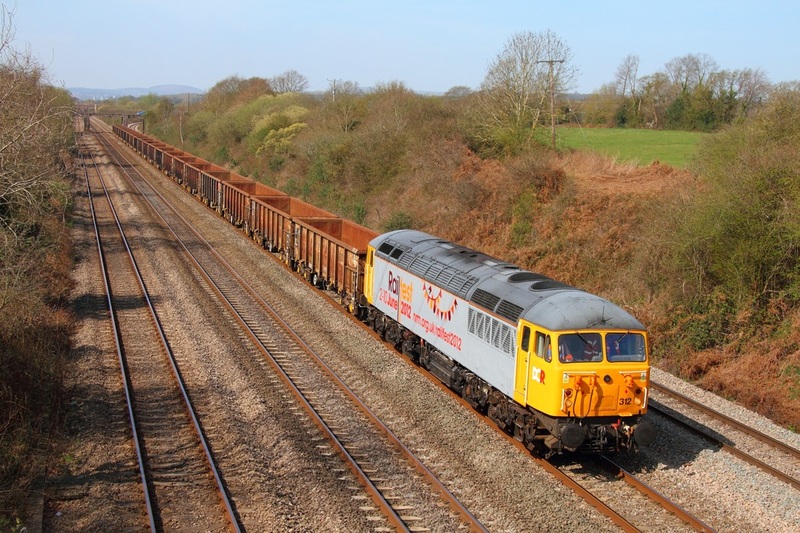 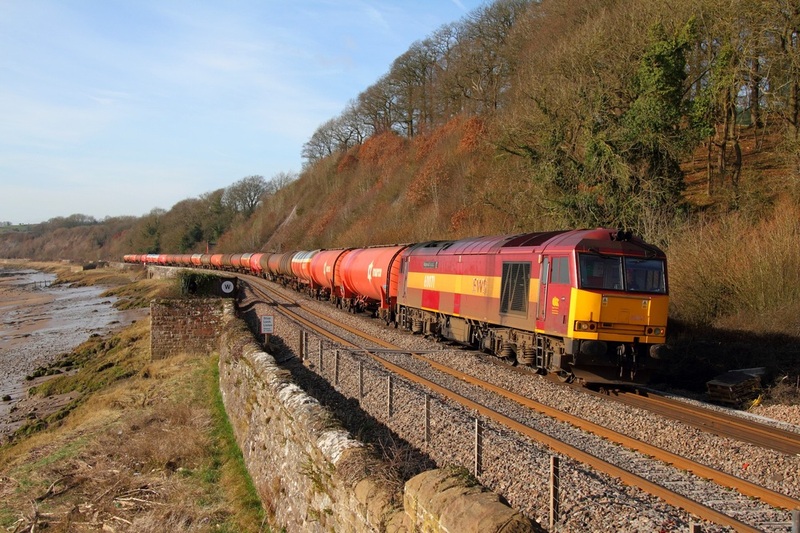 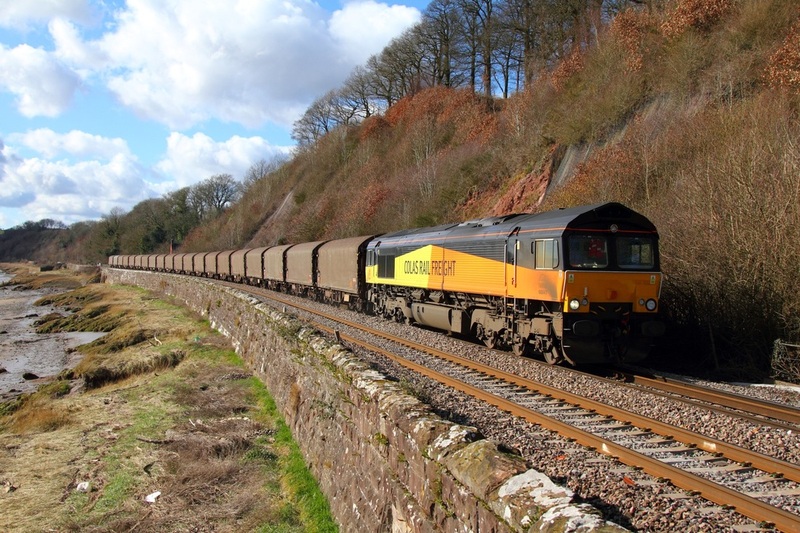 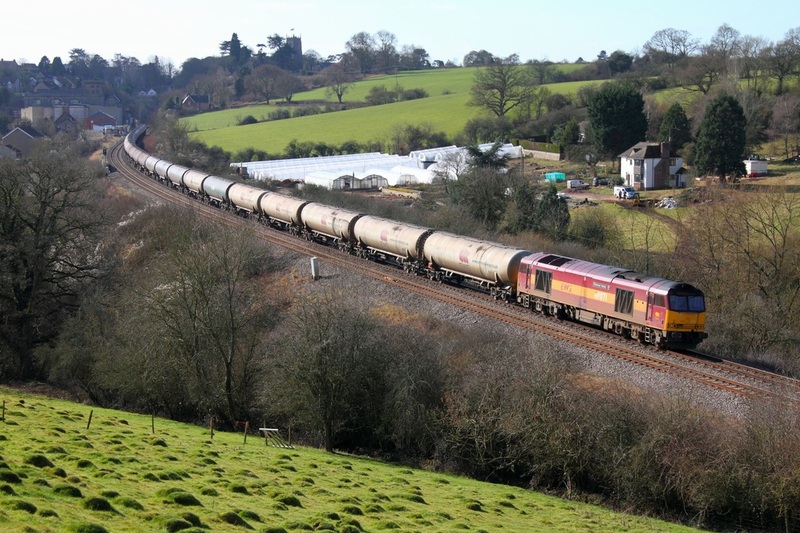 On the 28th March 2012, Colas Rail 66745 powers the 6Z51 Teigngrace to Chirk loaded logs at Caerleon. 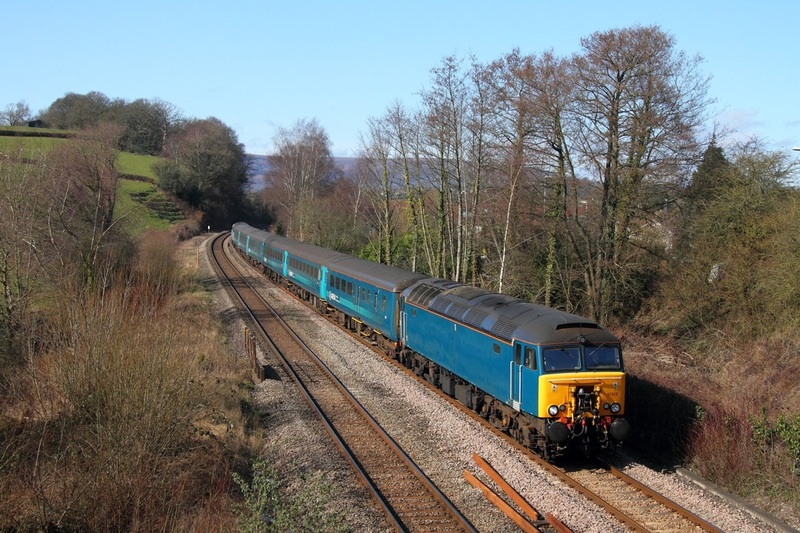 On the 28th March 2012, WCRC 47786 leads 57601 at Caerleon whilst powering the 1Z39 Cardiff Central to Huddersfield Statesman railtour. 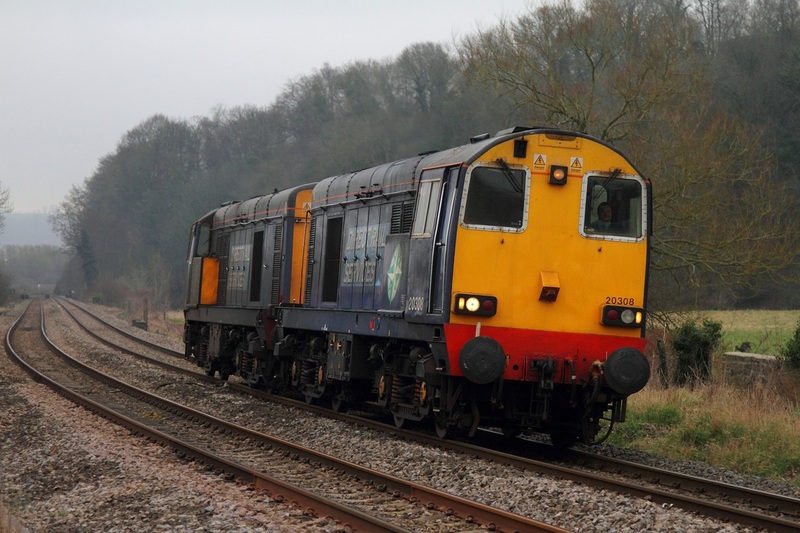 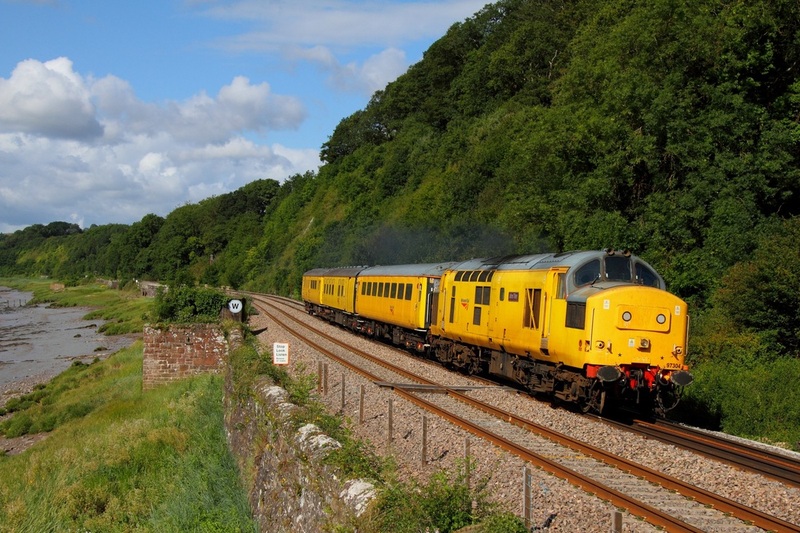 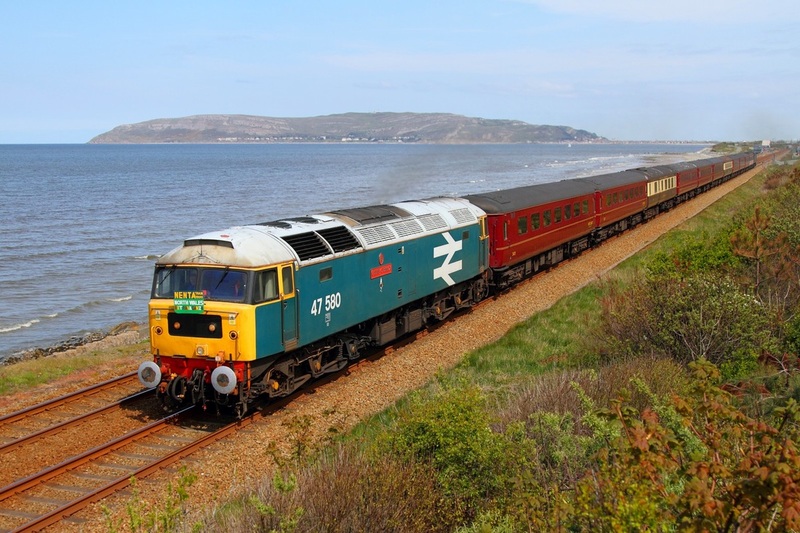 The pair had previously worked the 1Z38 to Cardiff Central via the scenic Central Wales line. 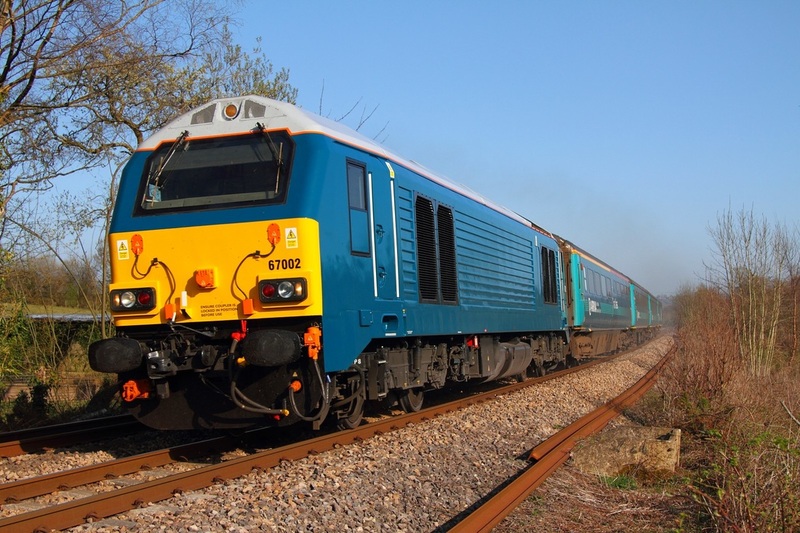 On the 28th March 2012, Arriva Train Wales 67002 speeds through Llanfrechfa with a delayed 1W91 Cardiff Central to Holyhead WAG Express. 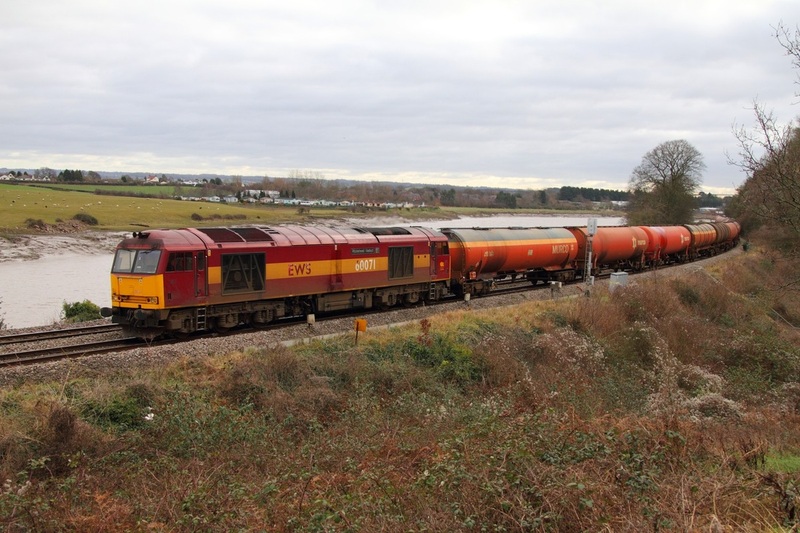 The Wednesdays-only 6B25 Westerleigh to Robeston empty murco bogie tanks was left in the hands of recently arrived in South Wales, DB Schenker 60079 which was sent as a straight-replacement for 60074 which required an exam whilst 60007 continued inevitably on the 6B13/6B47 diagram. On the 28th March 2012, 60079 rounds the curve at Thornwell running 25minutes late with the 6B25 in tow. 57316 was the last class '57' locomotive to work the 1W91 Cardiff Central to Holyhead on the 23rd March 2012 and the 1V31 Holyhead to Cardiff Central on the 26th March 2012. 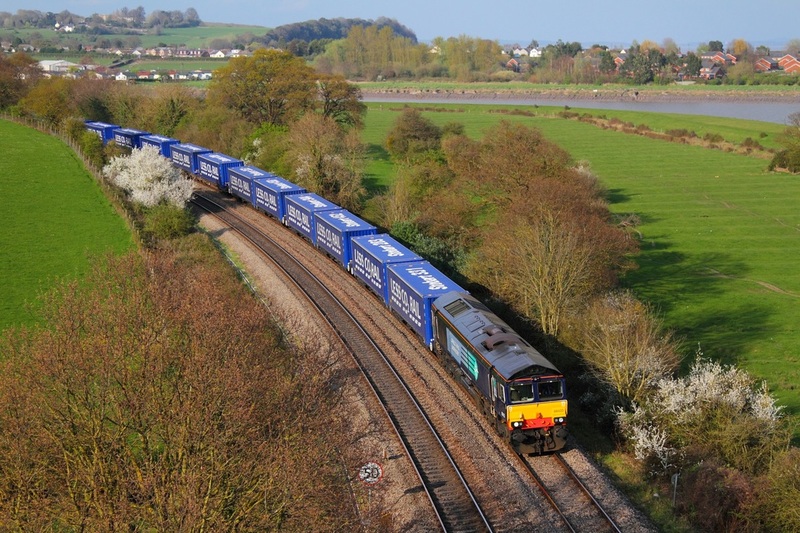 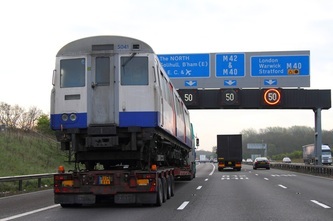 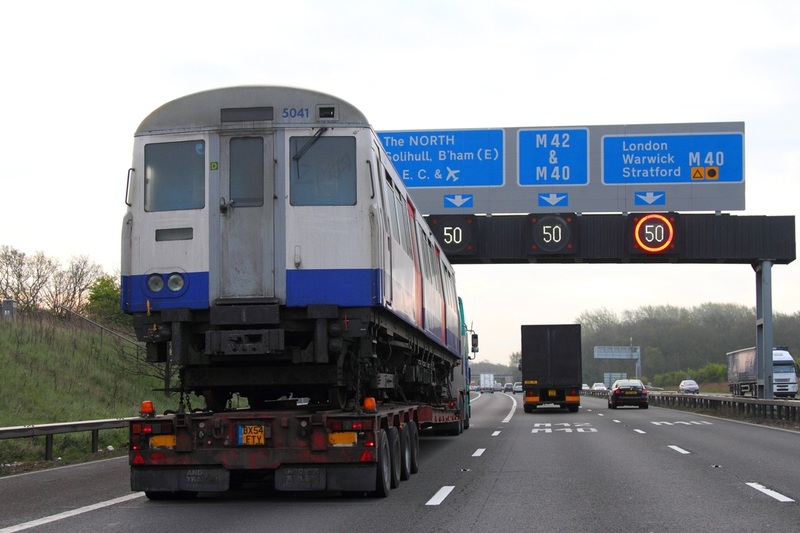 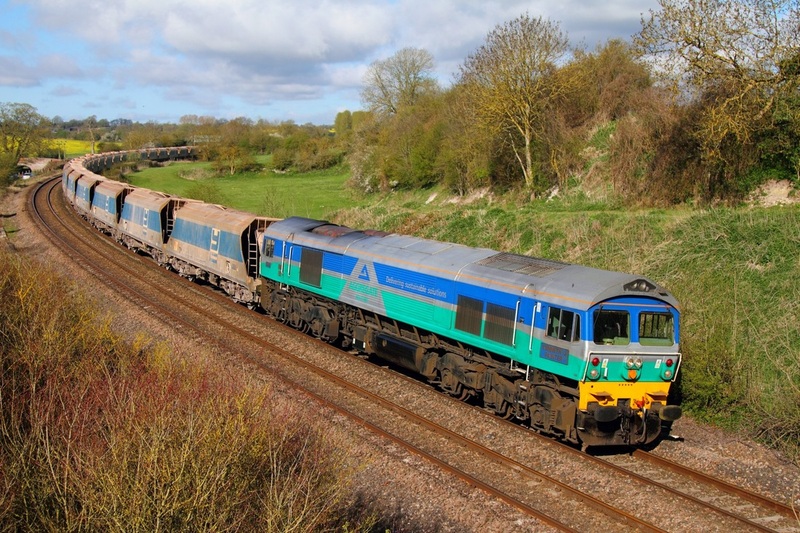 The 'WAG' Express diagram has now swapped traction from Class '57s' to Class '67s' and DB Schenker's Arriva Blue liveried 67002 became the first skip to work the 1W91 on the 26th March 2012 and the first '67' to work the 1V31 on the 27th March 2012. 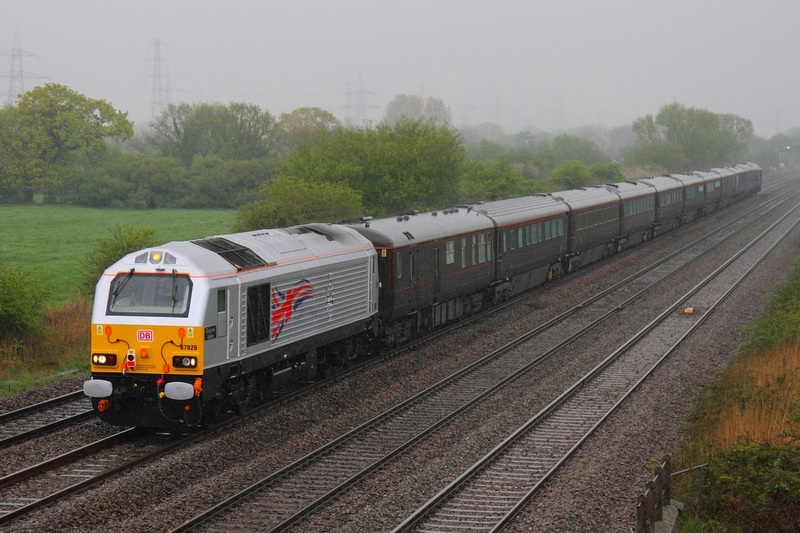 On the 27th March 2012, 67002 hauls the slightly late 1W91 Cardiff Central to Holyhead 'WAG' express at Ponthir. 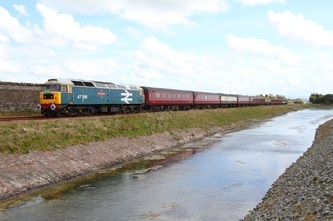 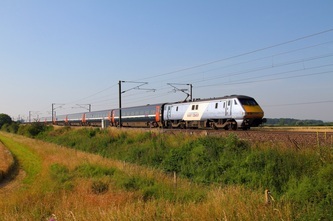 For more photographs and timings of the WAG Express please click here. 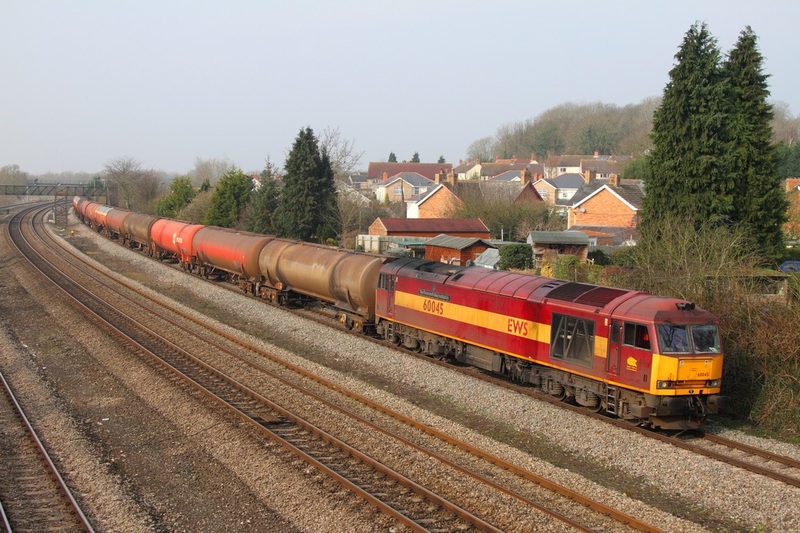 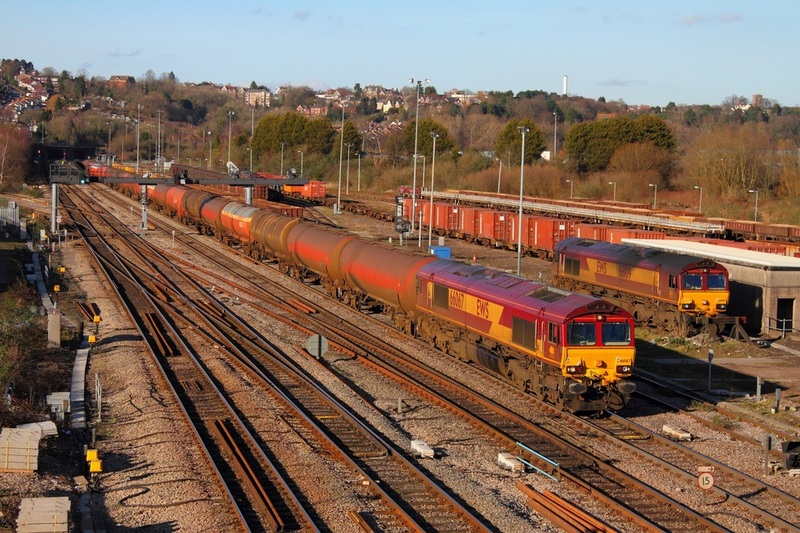 On the 27th March 2012, 60074 worked the 6B33 Theale to Robeston empty murco bogie tanks and is photographed at Newport. 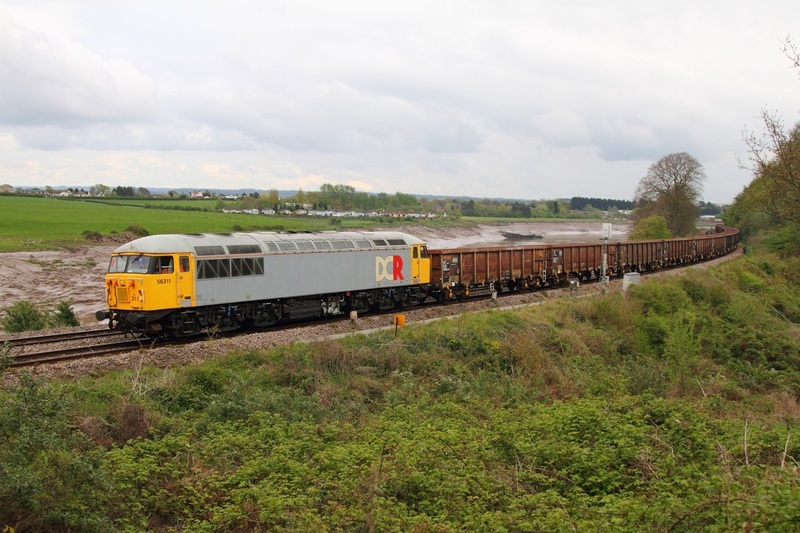 On the 26th March 2012, Grey liveried, with yellow cab ends and Railfest 2012 adverts 56312 leads de-branded Fastline liveried 56302 dead in train, powering the 6Z69 12:00 Burton Wetmore to Cardiff Tidal scrap metals at Purton. 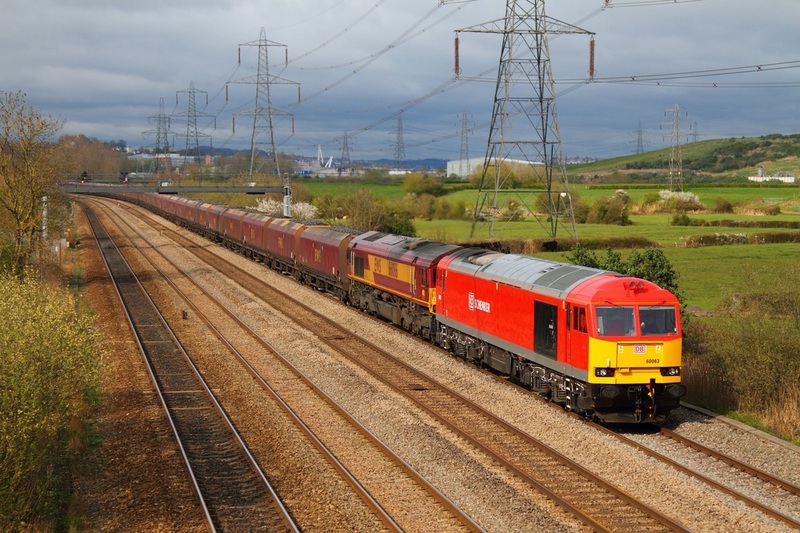 After working the overnight 6M94 Margam to Corby steel coils, DB Schenker's Cancer Trust liveried 60074 'Teenage Spirit' returned on the 19th March 2012 powering the 6V92 Corby to Margam empty steel coils. 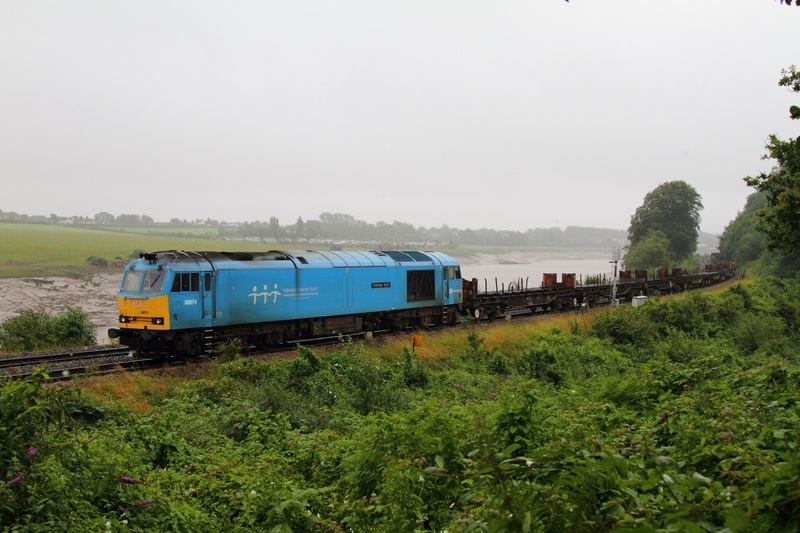 Running about 10minutes early, the Sky blue tug rounds the curve at Thornwell. 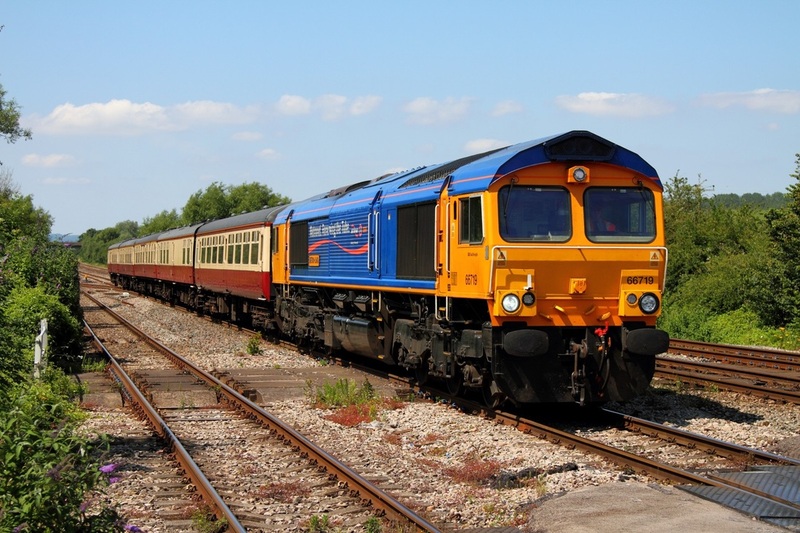 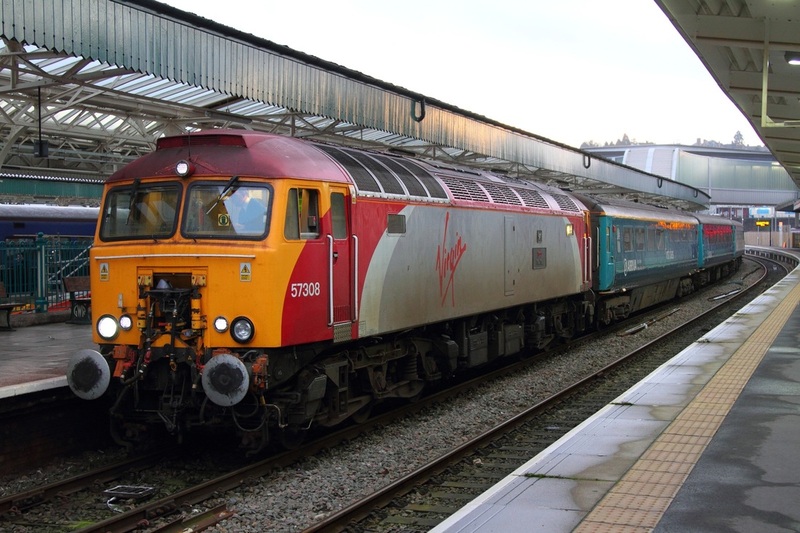 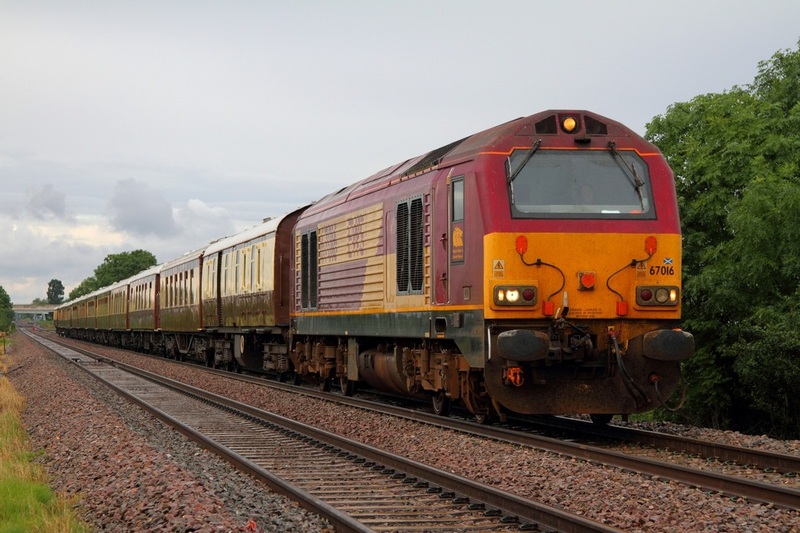 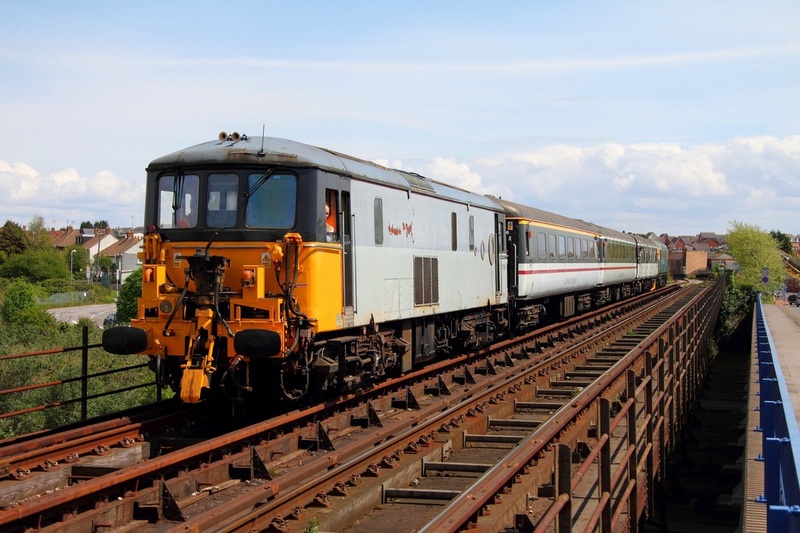 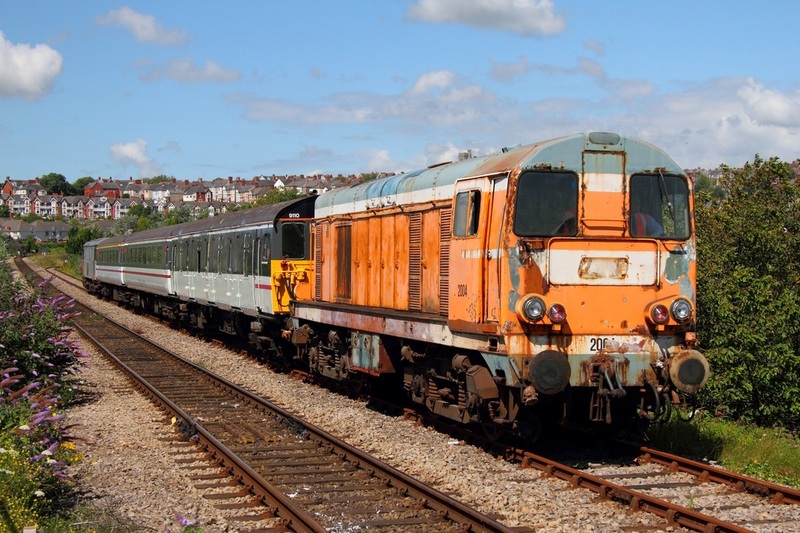 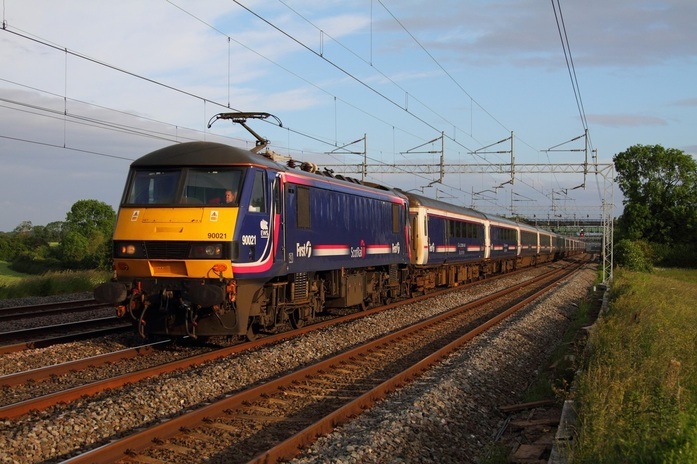 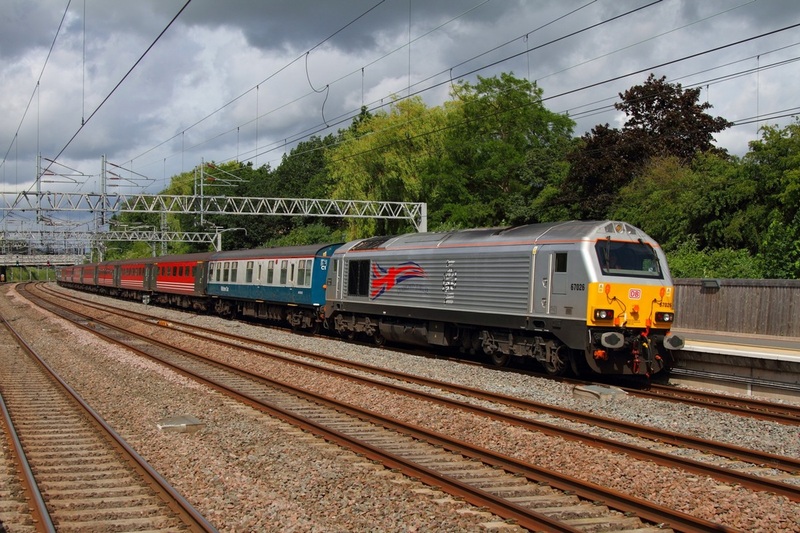 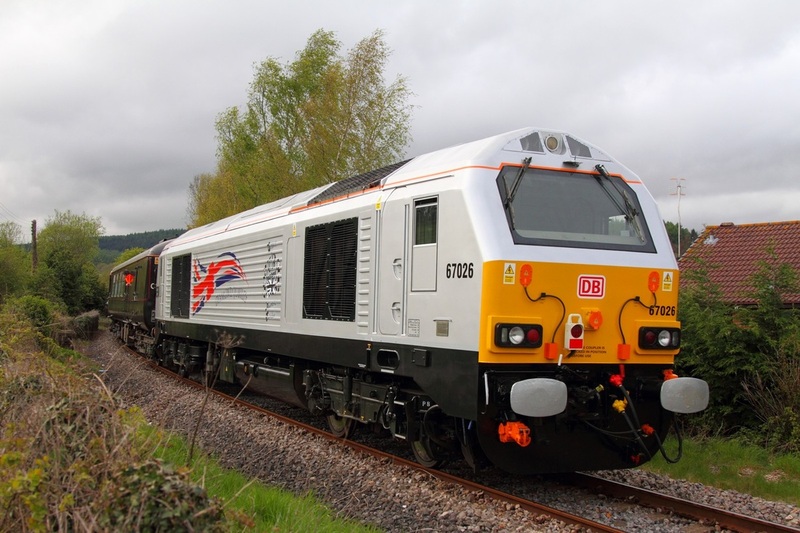 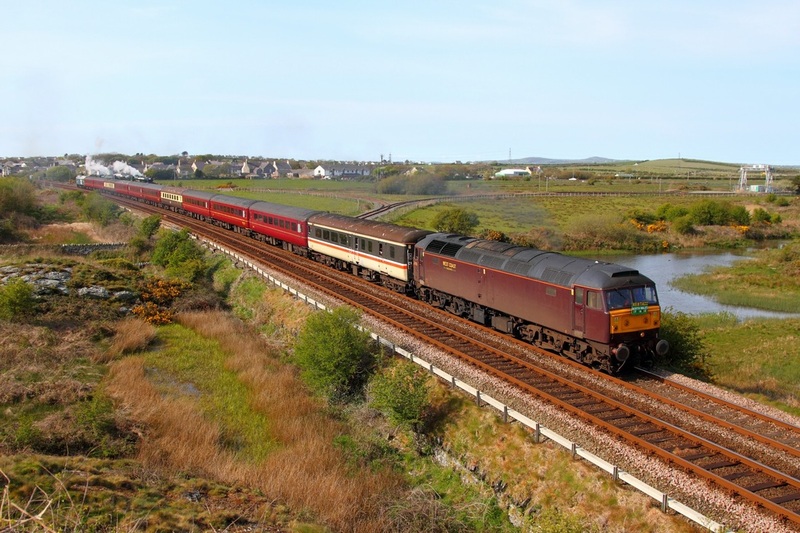 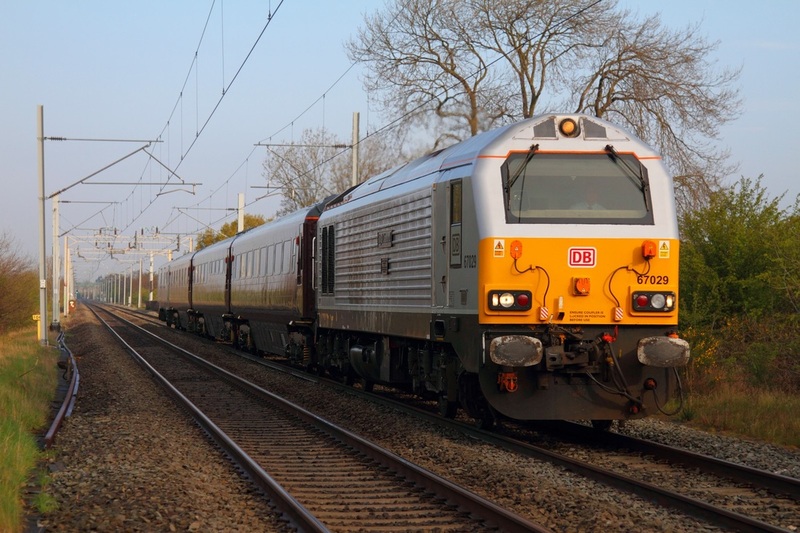 The Virgin Class '57s' are set to be replaced on the WAG express by DB Schenker Class '67s' at the end of the month. 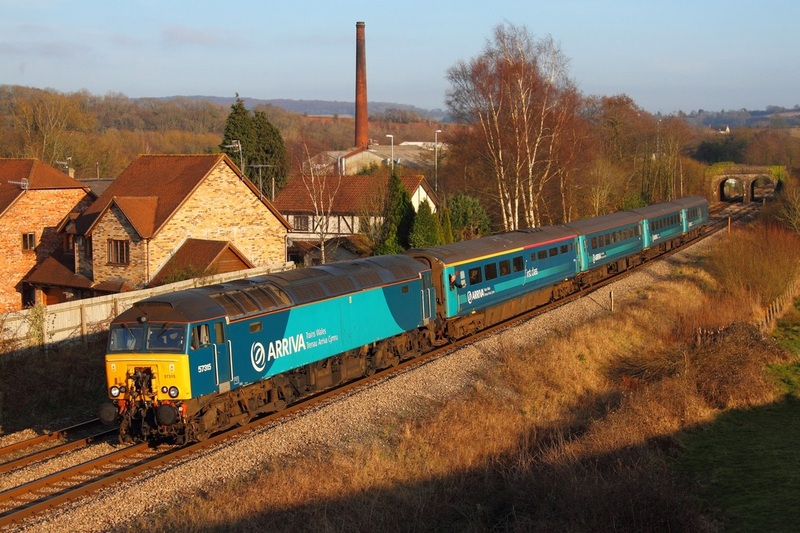 Arriva Trains Wales plain blue liveried 57316 heads north with the late afternoon 1W91 16:15 Cardiff Central to Holyhead WAG express at Llanellen near Abergavenny on the 14th March 2012. 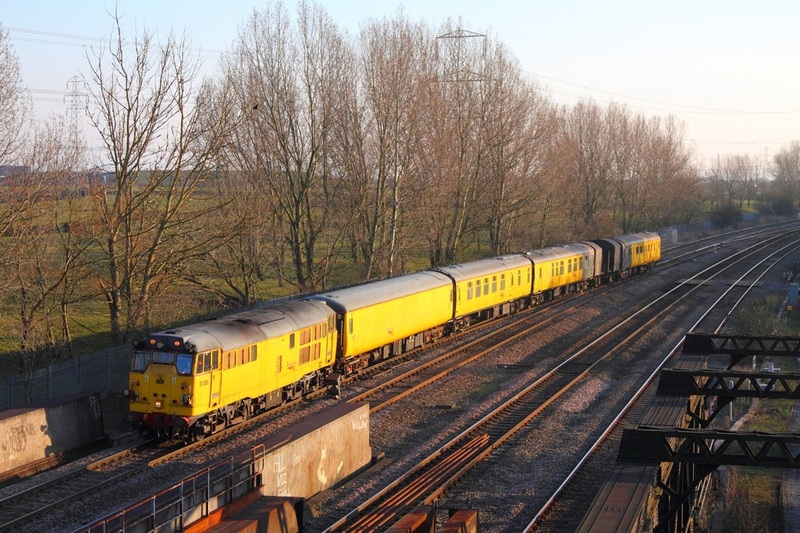 Arriva Trains Wales liveried 57315 leads the 1W91 Cardiff Central to Holyhead 'WAG' express in golden evening sunshine at Ponthir on the 12th March 2012. 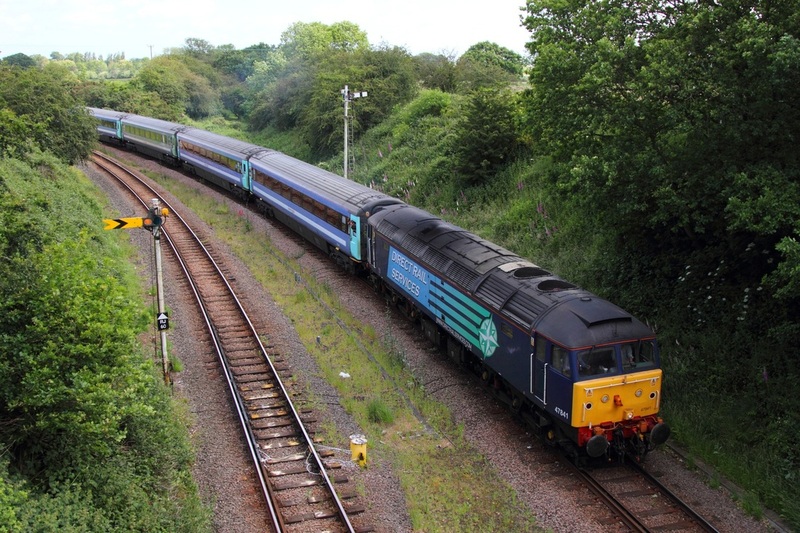 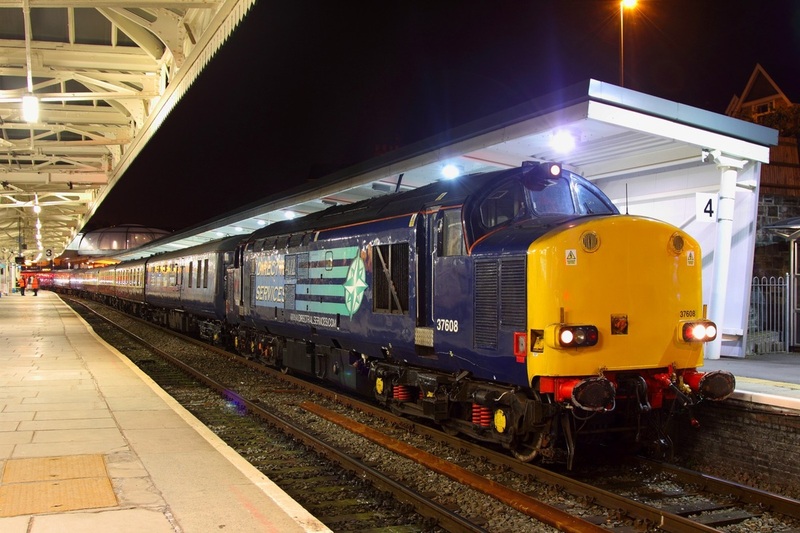 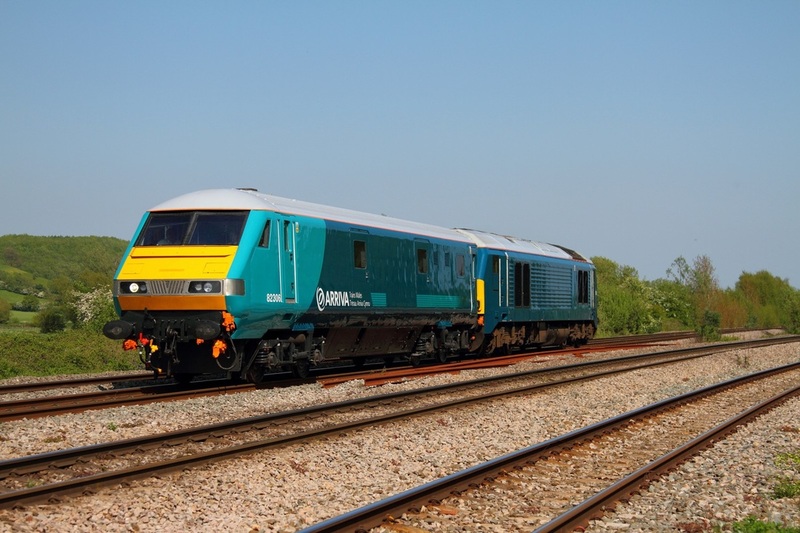 Due to the extra required passenger capacity due to the Wales and Italy match in Cardiff, Arriva Trains Wales liveried plain blue 57313 and ATW-branded 57315 top-and-tailed with six MK2s worked the 1V41 Holyhead to Cardiff Central passenger service. 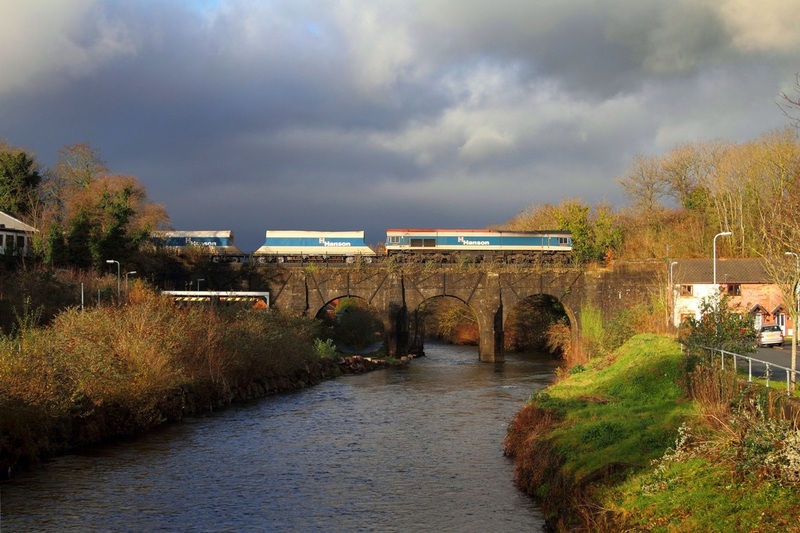 I photographed the train firstly at Pandy and then again at Ponthir after the train called at Abergavenny, Pontypool and Cwmbran for passengers. 10th March 2012. 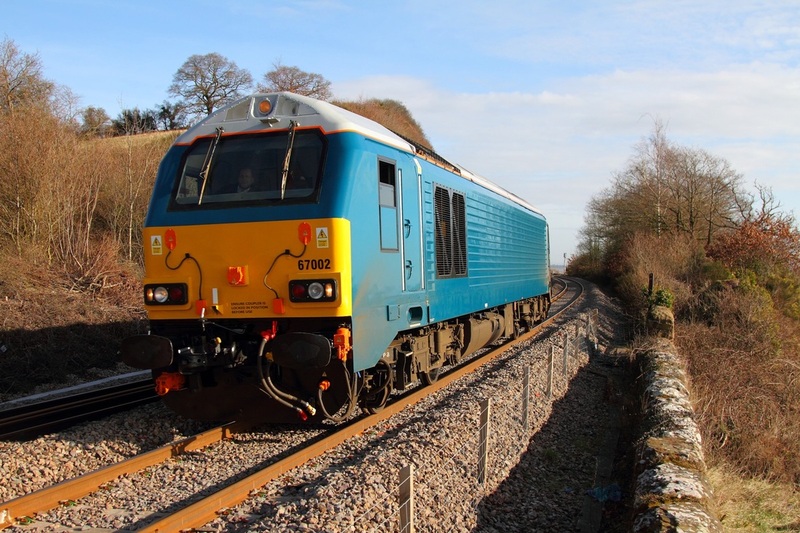 Br Blue 20142 leads Railfreight 20227 and a New Underground unit with two-tone grey 20901 and 20905 on the rear at Wychnor powering the 7X09 Old Dalby to Amersham on the 7th March 2012. 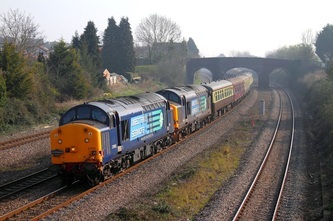 Arriva Train Wales liveried 57315 leads the 1W91 Cardiff Central to Holyhead WAG Express near Caerleon on the 6th March 2012. 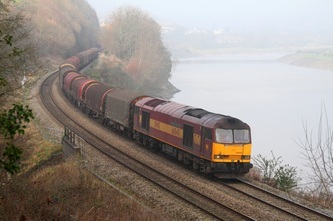 DB Schenker's Cancer Trust liveried 60074 powers the 6V40 04:25 Scunthorpe to Cardiff Tidal empty steel at Portskewett on the 25h February 2012. 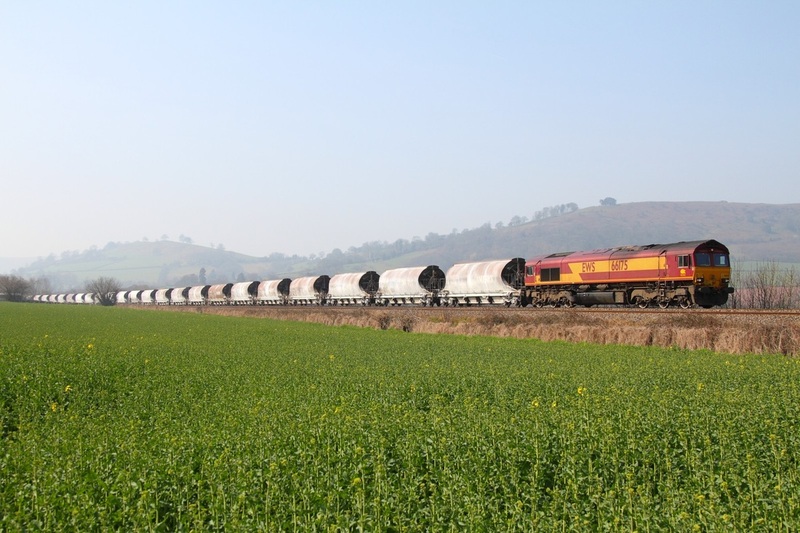 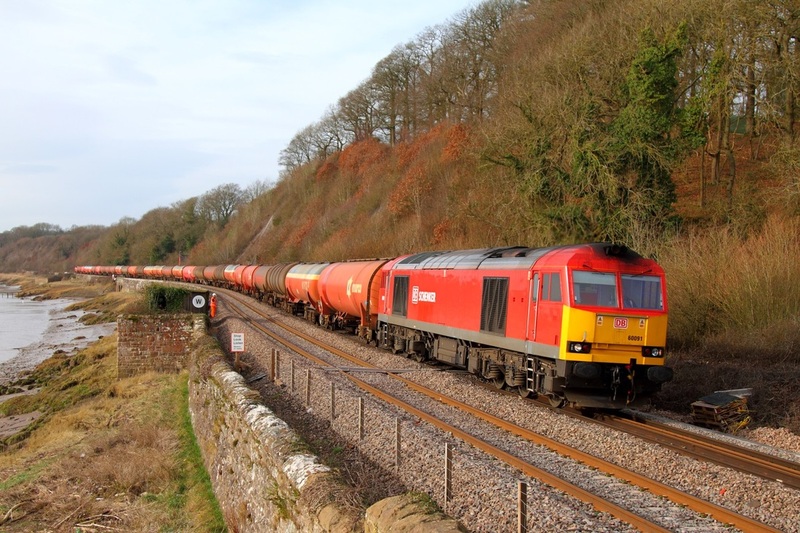 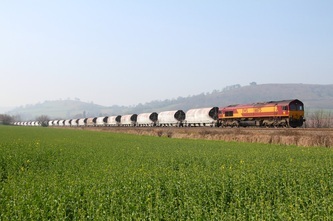 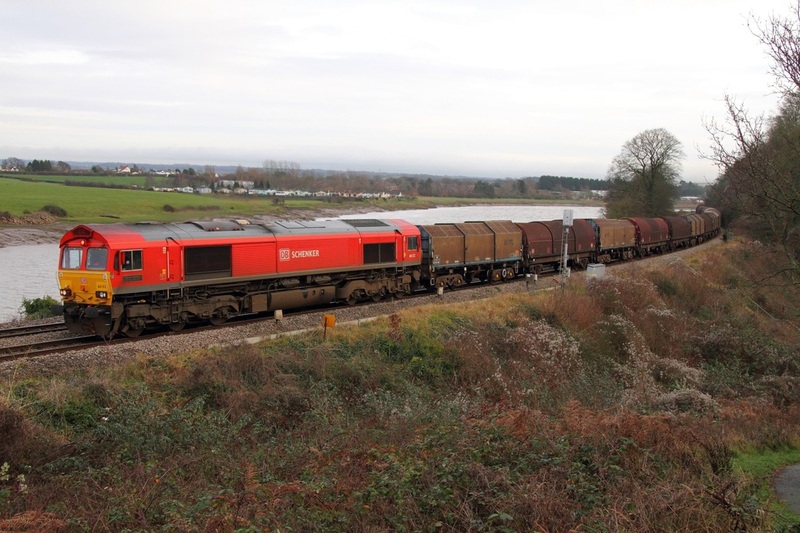 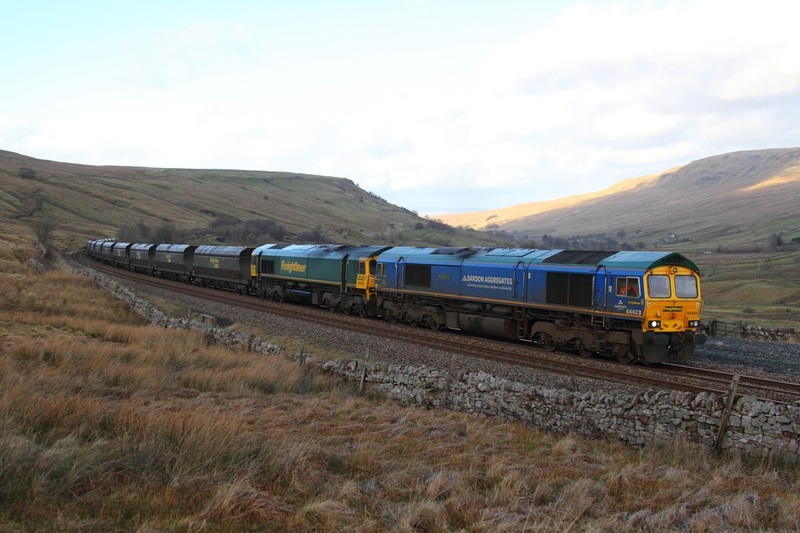 DB Schenker's EWS 60071 heads the 6E41 Westerleigh to Lindsey tanks at Wickwar on the 25th February 2012. 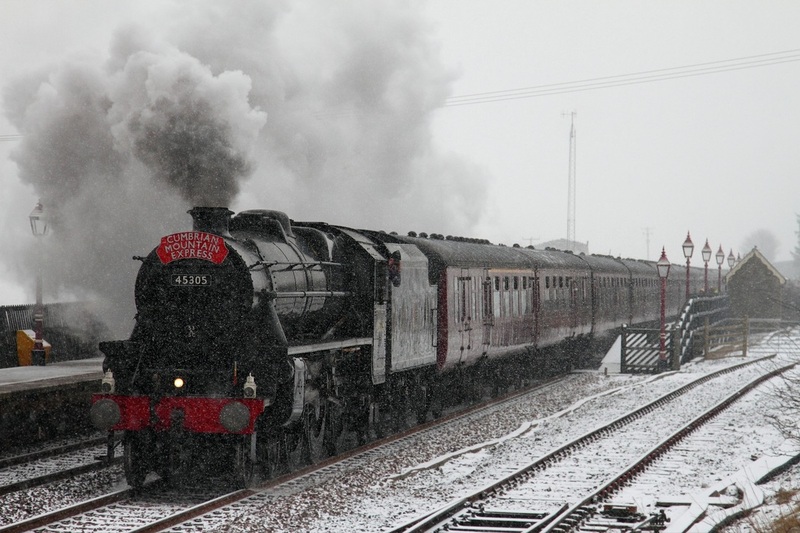 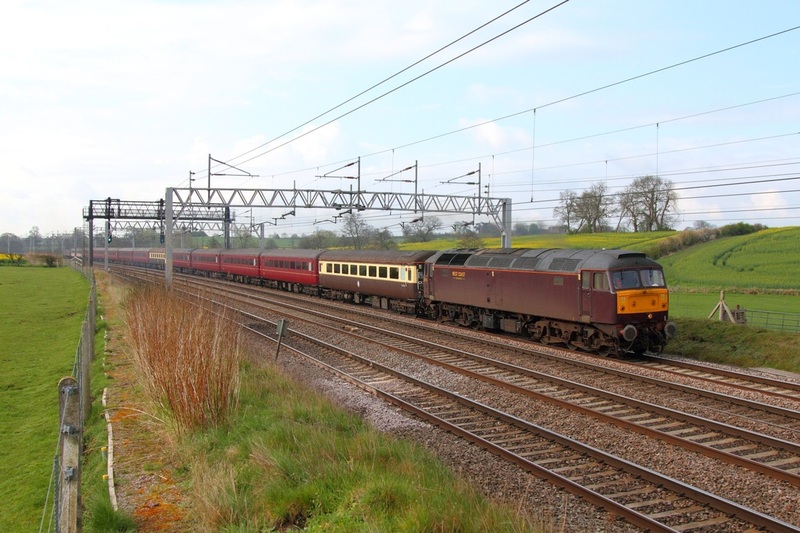 On the 18th February 2012, LMS Class 5MT 4-6-0 nos 44932 leads 45305 powering the 1Z86 London Euston to Carlisle (from Carnforth) at Docker. 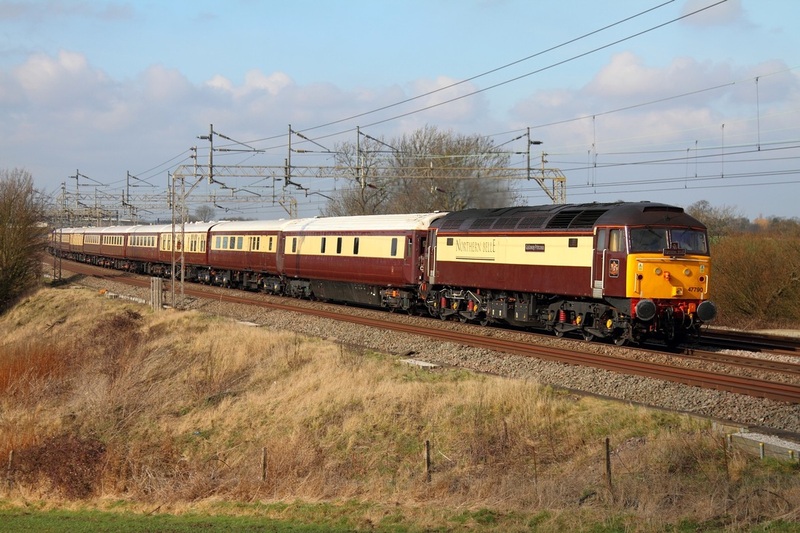 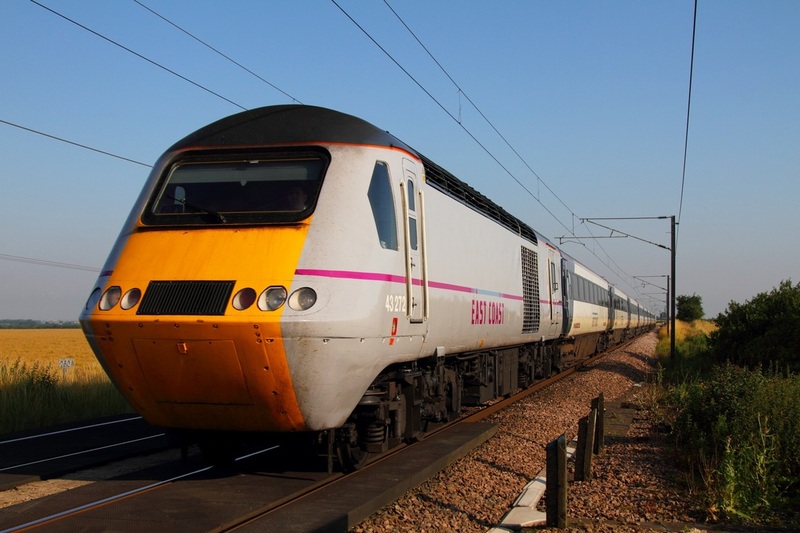 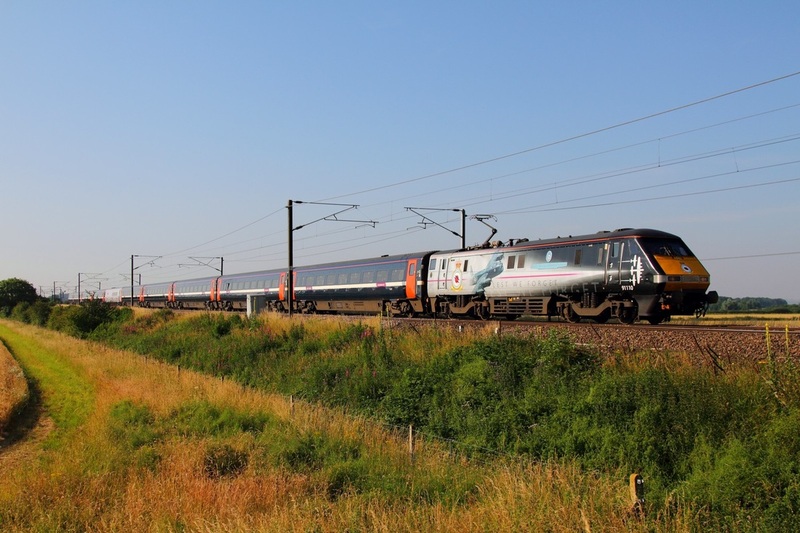 86259 would work the train from London Euston to Carnforth and return from Preston, whilst the steam locomotives would work between Carnforth and Preston via the WCML, Carlisle and the S&C. 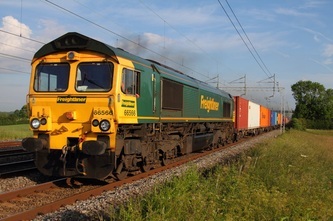 With the DRS Tesco contract between Daventry and Wentloog starting next week. 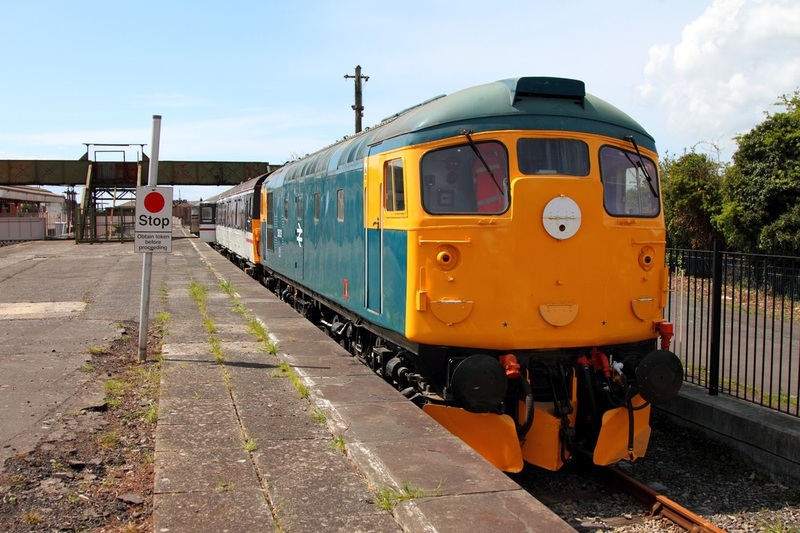 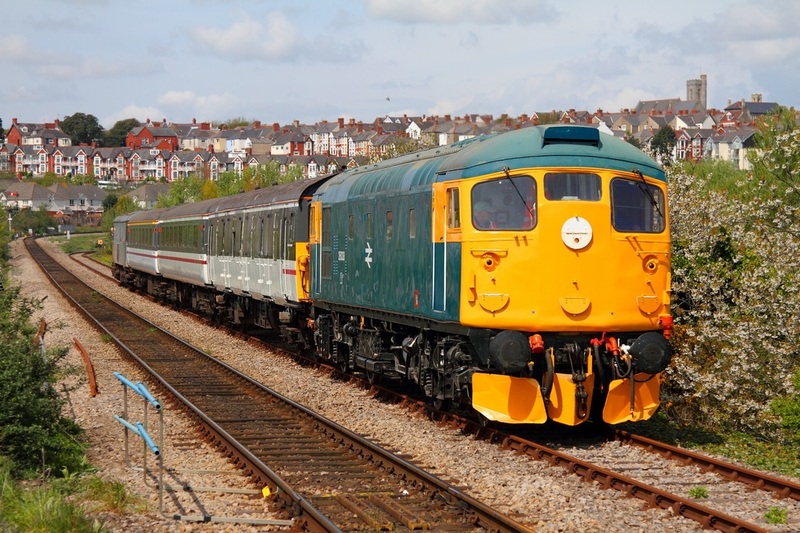 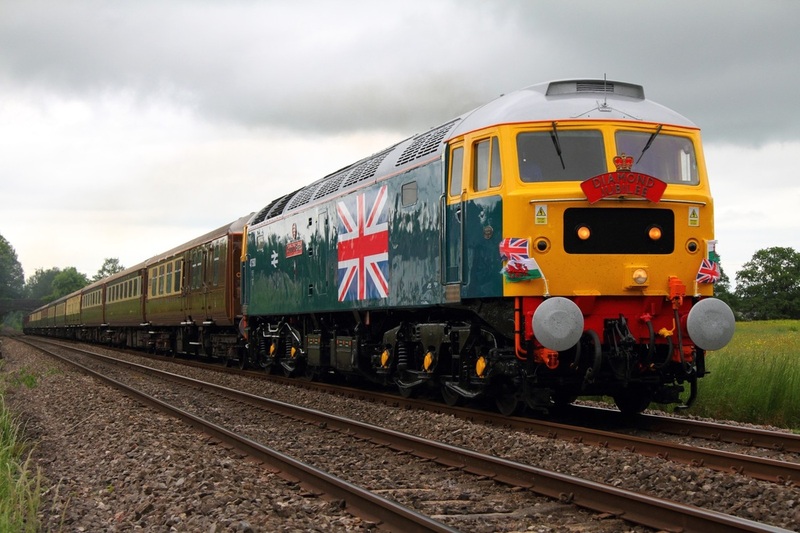 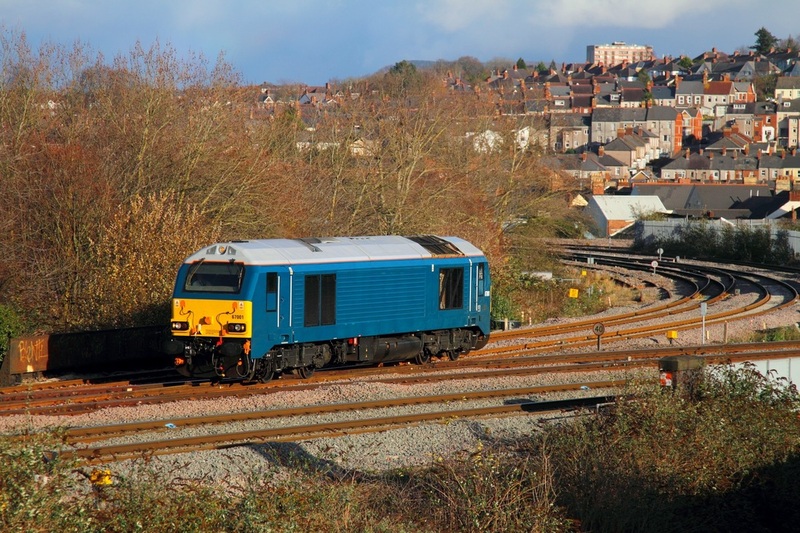 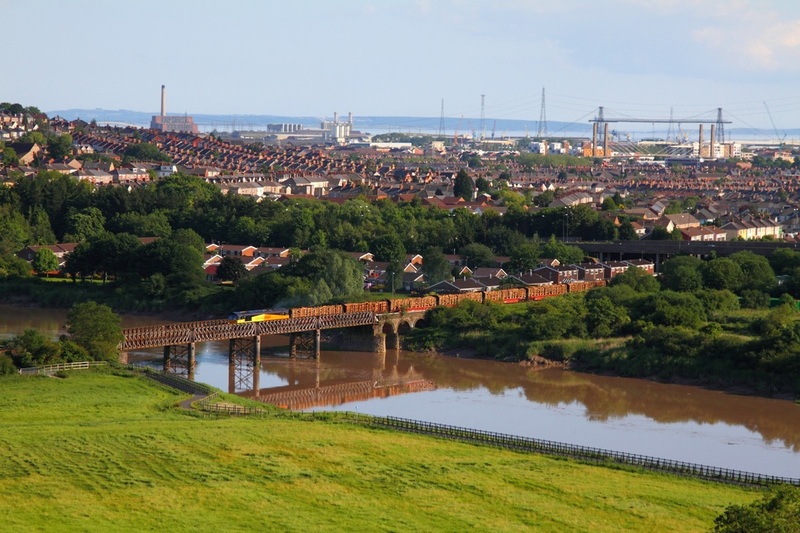 For the past few weeks, DRS have used various locomotives for route learning to South Wales. 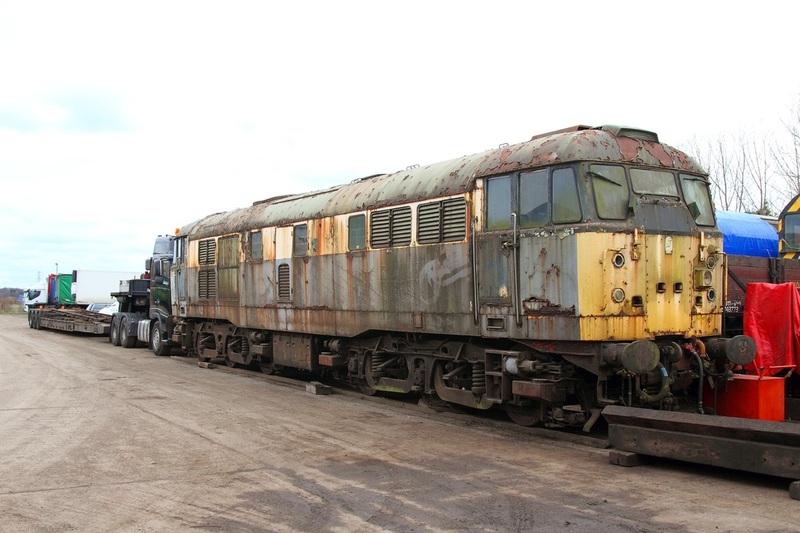 These have included classes 37s, 47s, 57s and 66s. 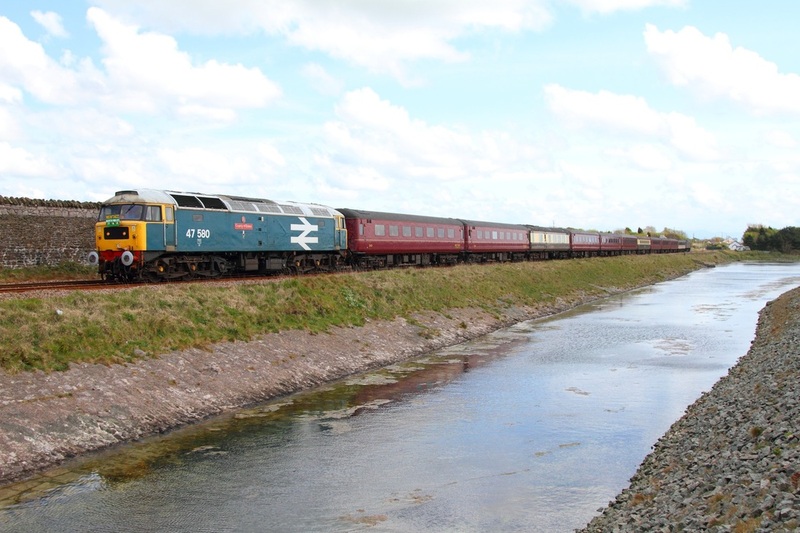 By far the rarest for South Wales occurred on the 17th February 2012, when 20309 and 20308 worked an 0Z30 Crewe Gresty Bridge to Cardiff Central and 0Z31 Cardiff Central to Crewe Gresty Bridge route learner via the marches. 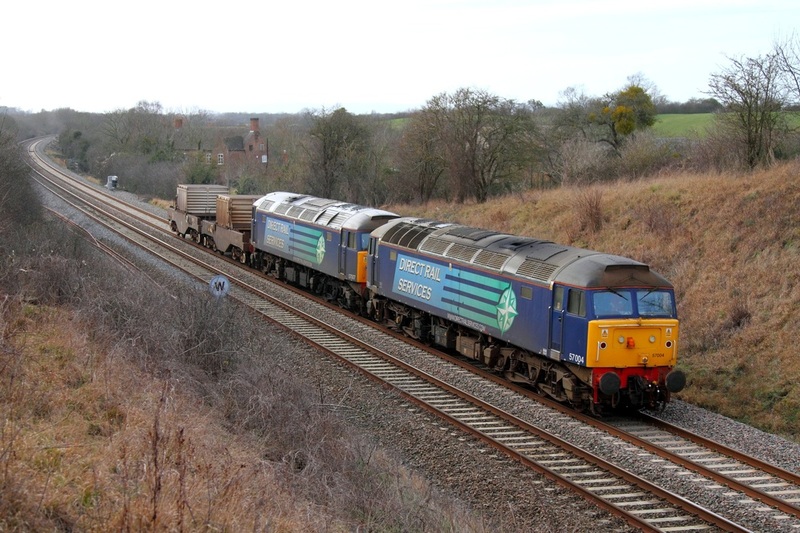 The Choppers terminated at Wentloog instead of running light into Cardiff. Left: 20309 leads 20308 working as the 0Z30 Crewe to Wentloog at Maindee West junction, Newport. 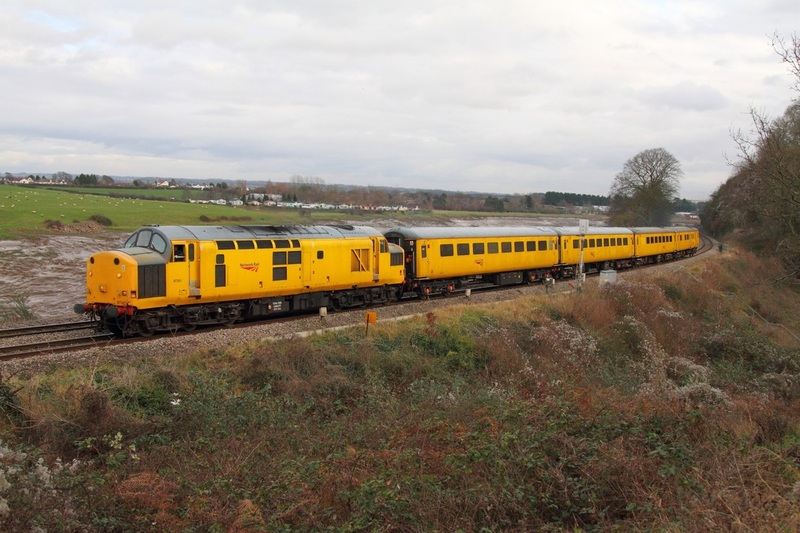 The 0Z31 return is photographed at Ponthir with 20308 leading. 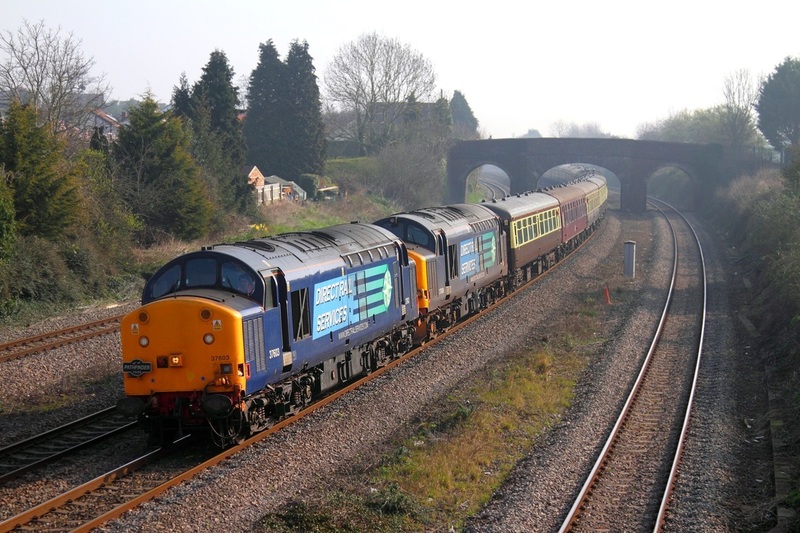 Looking resplendent in Br Blue, 86259 'Les Ross' hauls the 1Z86 London Euston to Preston Cumbrian Mountain Express at Grendon on the 11 February 2012. 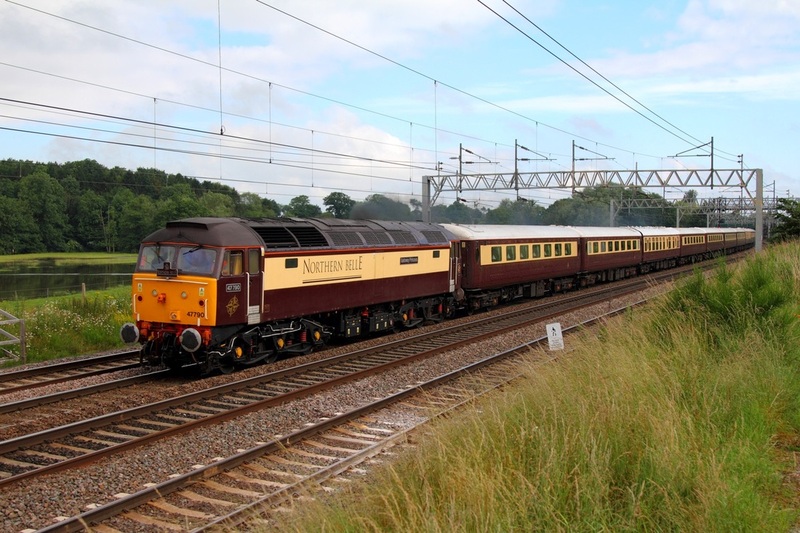 Steam loco 70013 would take the tour forward from Preston and work to Carlisle via the S&C. 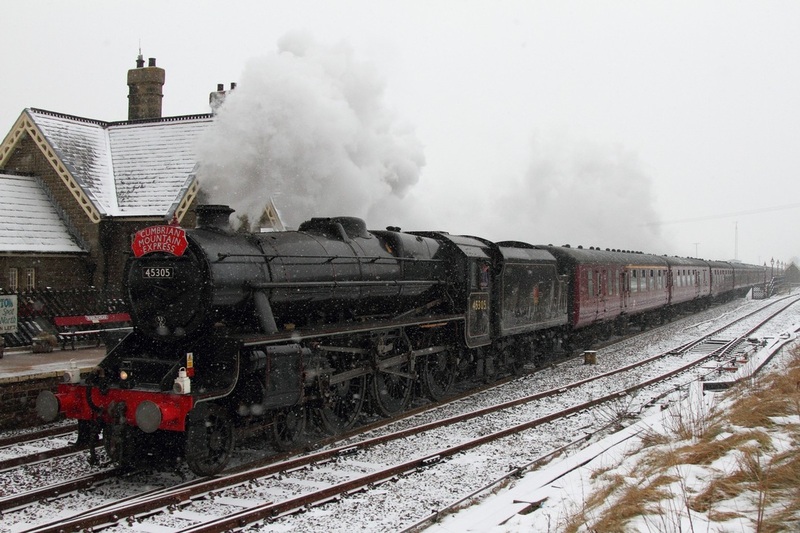 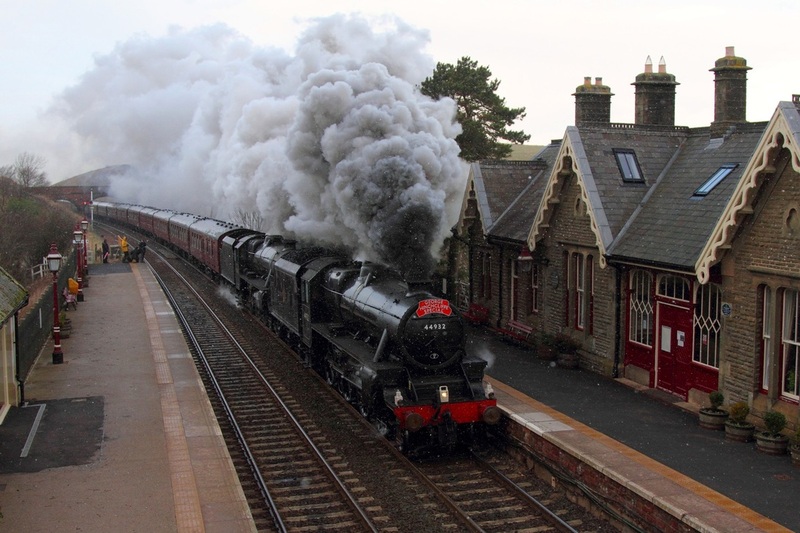 The tour would then work south from Carlisle and 86259 would replace Oliver Cromwell at Carnforth. 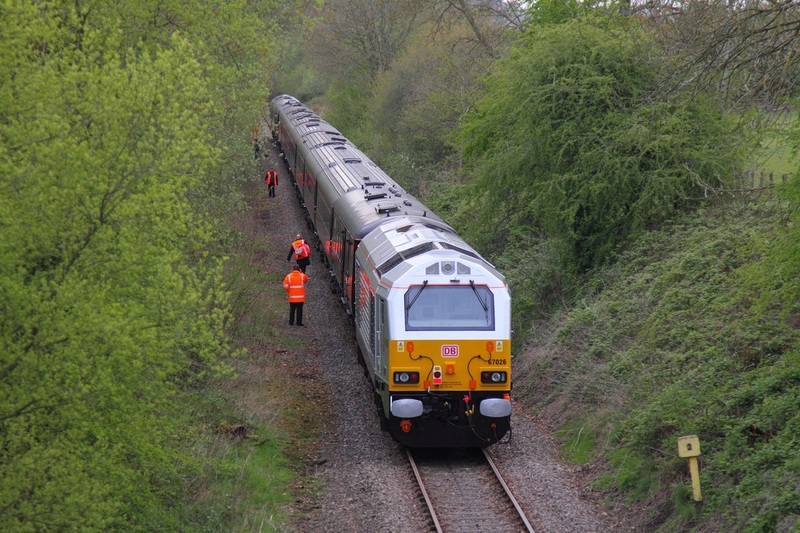 Click here for last weeks photos of the tour. 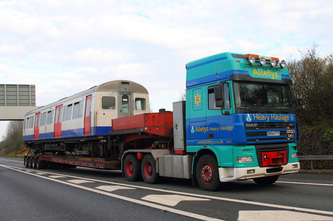 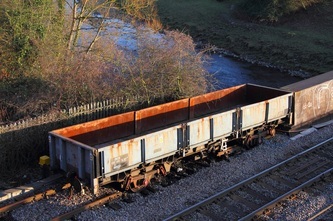 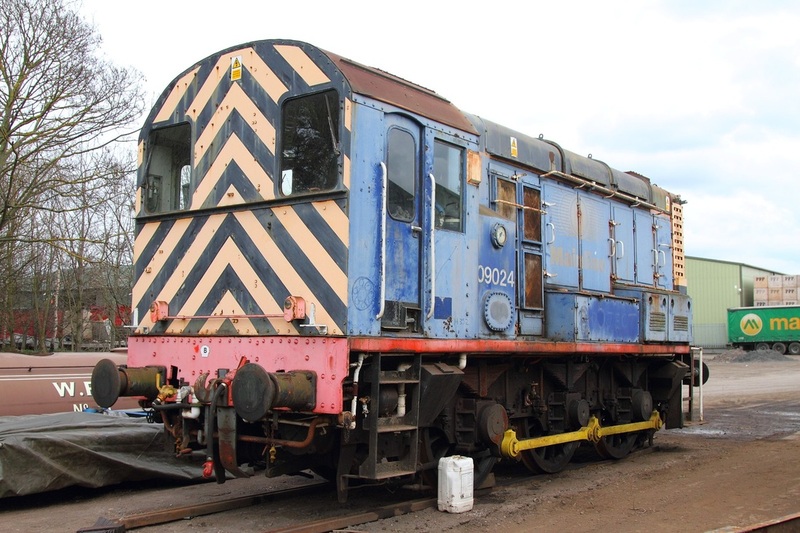 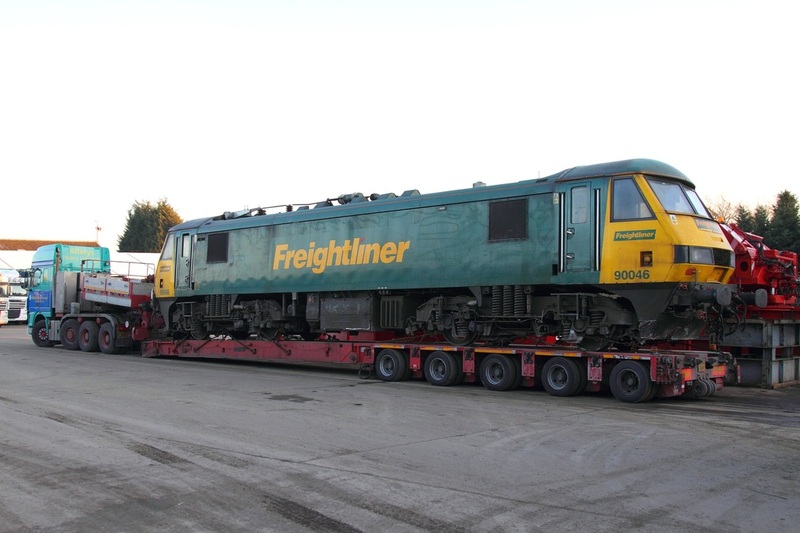 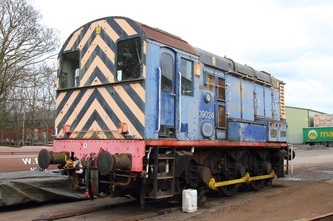 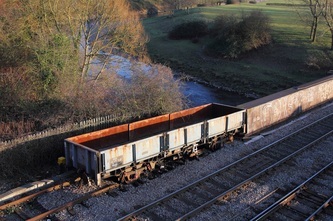 On the 11th February 2012,Freightliner's 90046 is photographed on an Allelys low loader at Allelys, Studley yard. 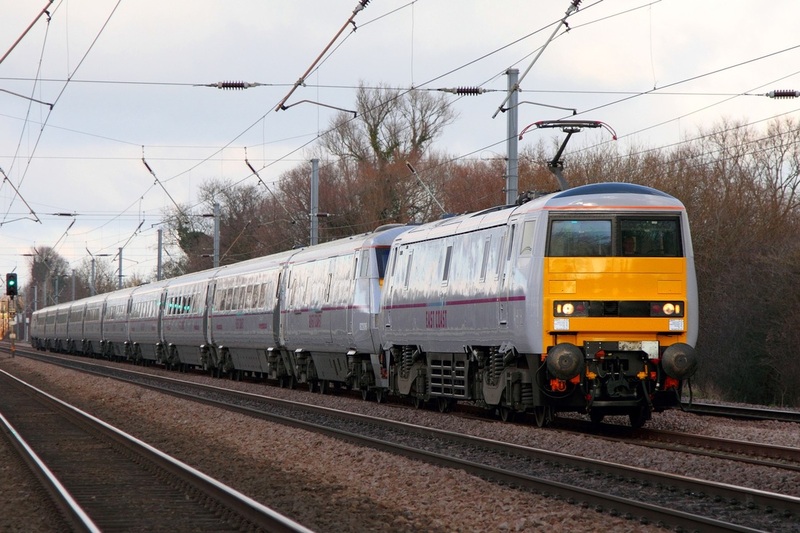 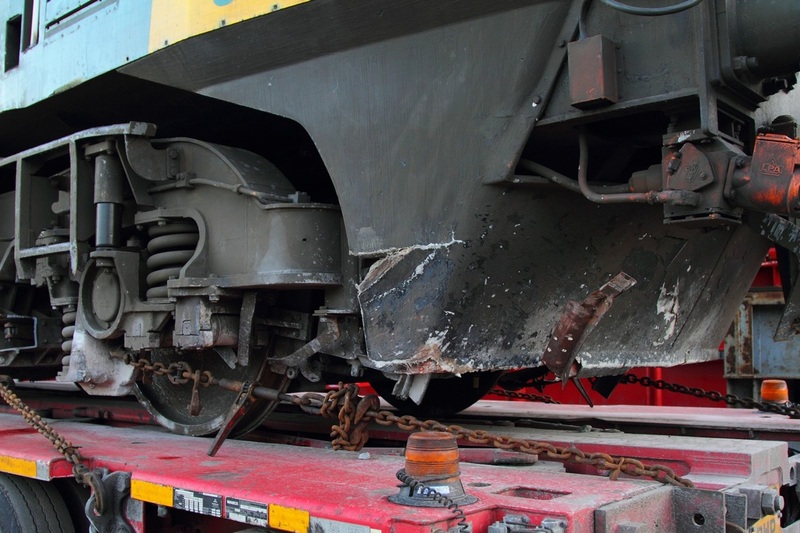 The Freightliner Skoda derailed at Bletchley south junction, Milton Keynes on the 3rd February whilst running light engine to Wembley on hire to Virgin Trains. 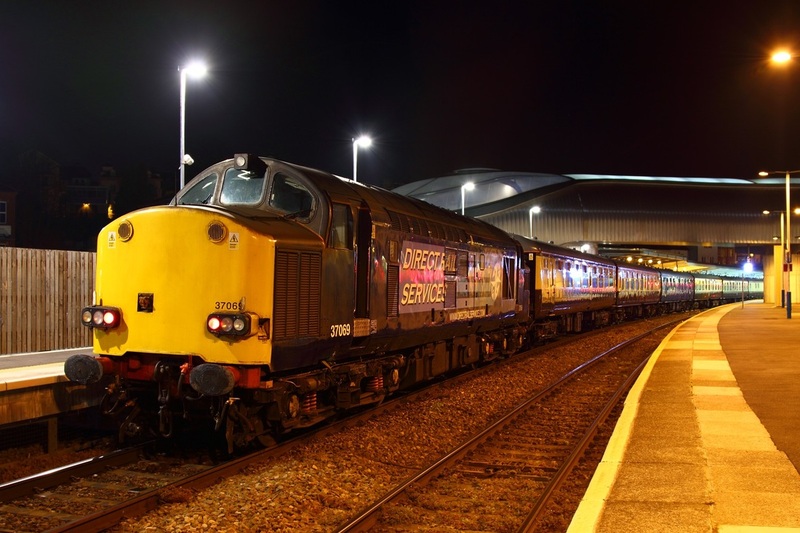 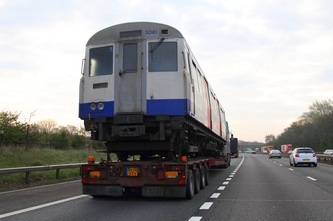 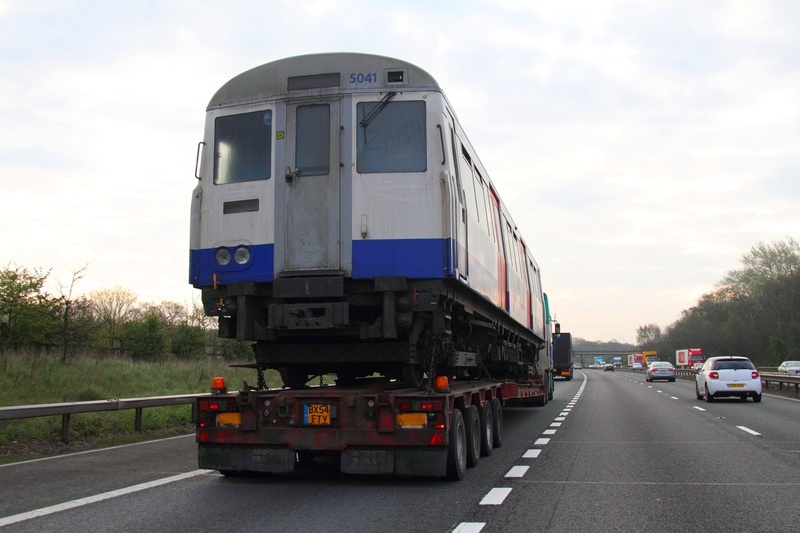 The loco was subsequently moved to Wembley and finally left on the evening on the 10th February. 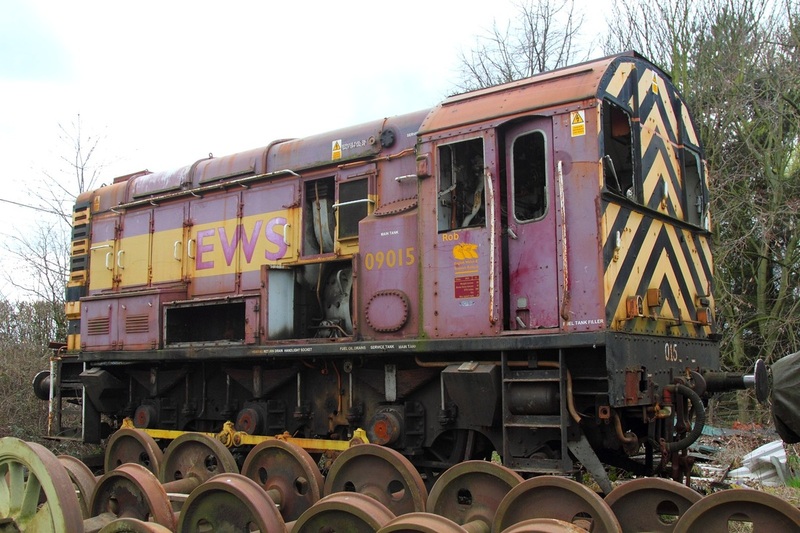 The lorry stabled at Studley yard over the weekend, before departing for Crewe Basford Hall in the late hours on the 12th February. 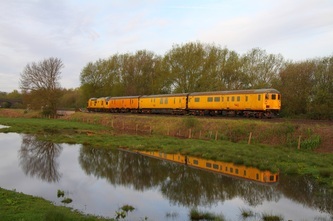 Click here for some more photographs. 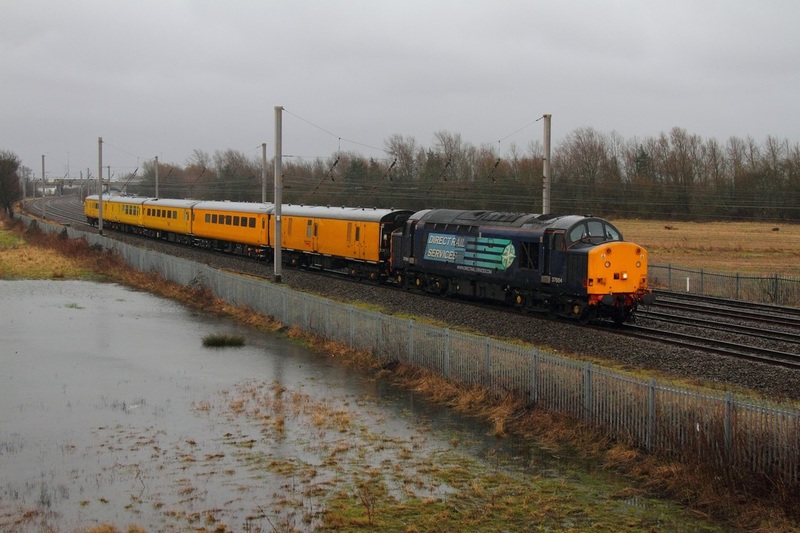 On the 11th February 2012, DRS 37510 leads a snow train consisting of 99709594014-1 and ADB977869 with old DRS liveried 37087 on the rear at Stenson junction powering the 6Z30 Derby RTC to Carlisle Kingmoor. The Growlers and the snow train would later move forward to Dundee as the 6Z31. 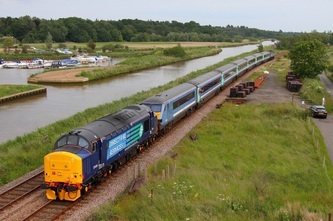 Click here for some more photographs. 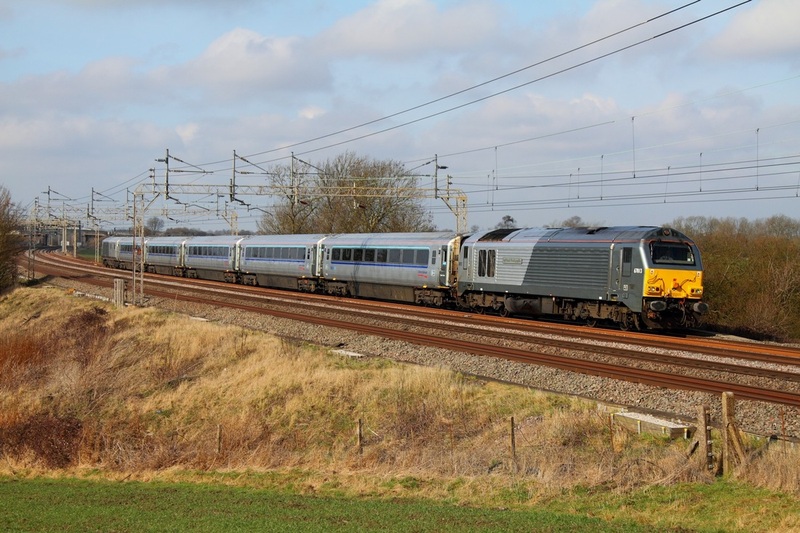 East Coast liveried 91112 slab-end leading hauls the 5G14 Neville Hill to Bounds Green consisting of 82206 and 91117 at Arlesey north of Stevenage on the 28th January 2012. 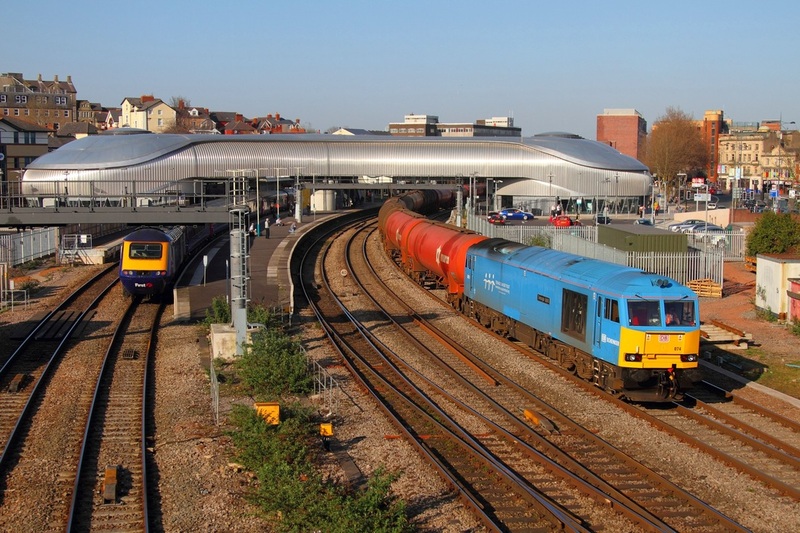 For more photographs from my visit to the South East on the 28th January, click here! 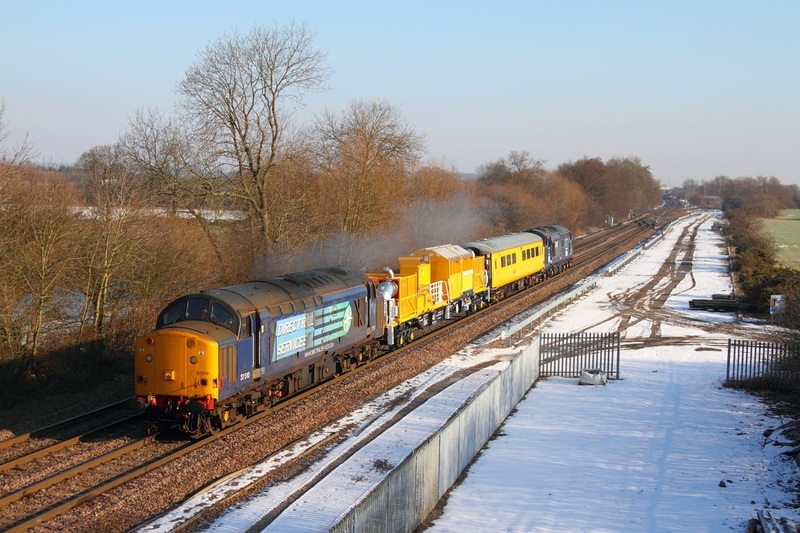 Click here for photographs of four of the six Network Rail '57s', including 57306 and 57312 with the new Snow train in Tonbridge Yard on the 28th January 2012. 57303 worked the 0Z57 Eastleigh yard to Tonbridge yard, whilst 57305 was already stabled. Holyhead 'WAG' express awaits departure from Newport. 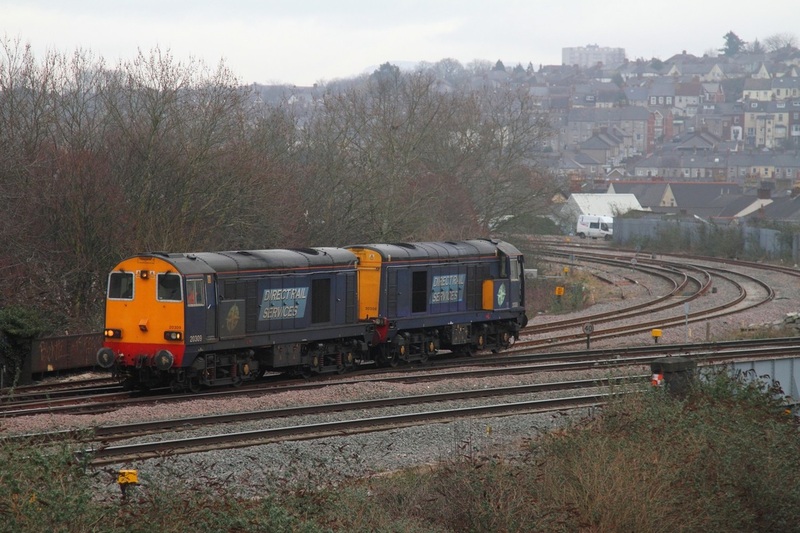 On the 23rd January 2012, Network Rail's 97301 worked the 1Q13 06:48 Derby RTC to Tyseley via Hereford, Gloucester, Newport and Bristol Parkway. DBSO 9701 lead the test train down the Lydney line and 97301 led the return from Newport to Bristol Parkway. 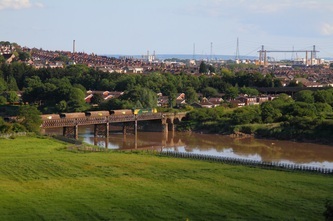 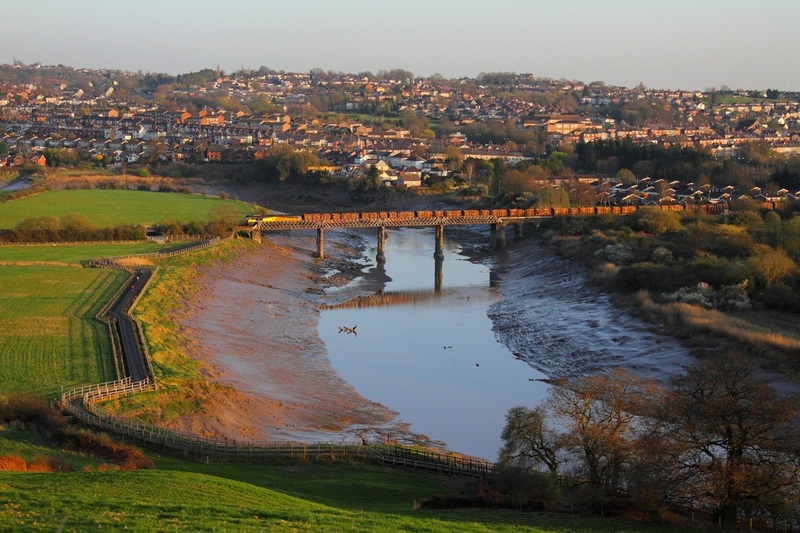 The train hurries through Thornwell near Chepstow. 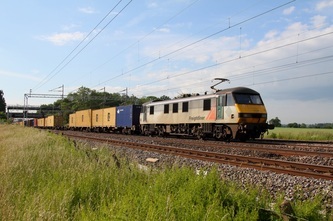 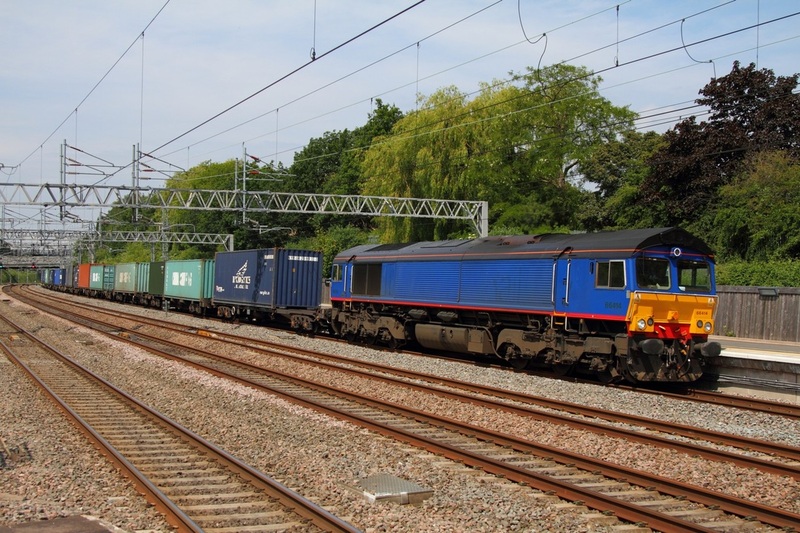 Click here to view more photographs of 97301 and 31285.
world at Bassaleg (built in 1826) whilst powering the 6A83 Machen to West Drayton.